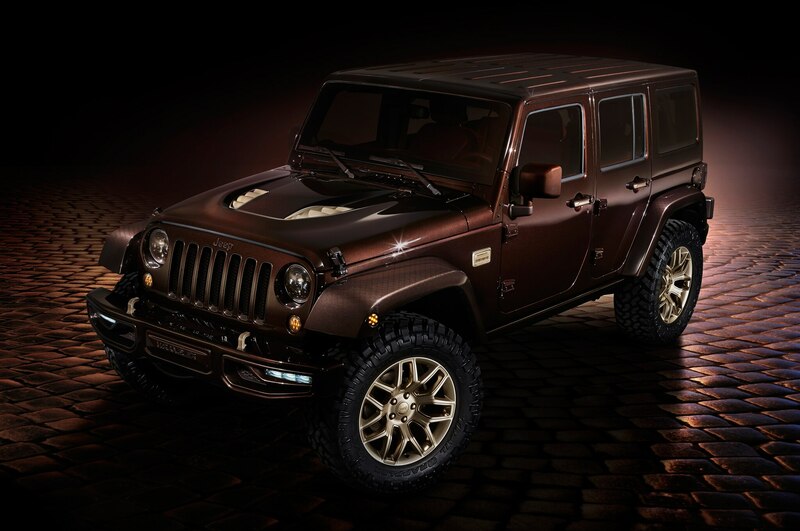 Jeep is making a splash at this year’s Beijing auto show with four new concepts that draw from modern Chinese urban culture, design, and fashion. 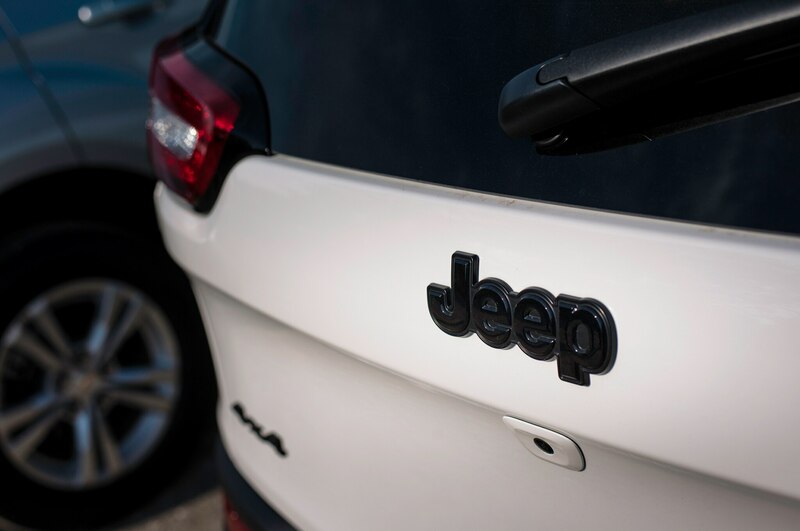 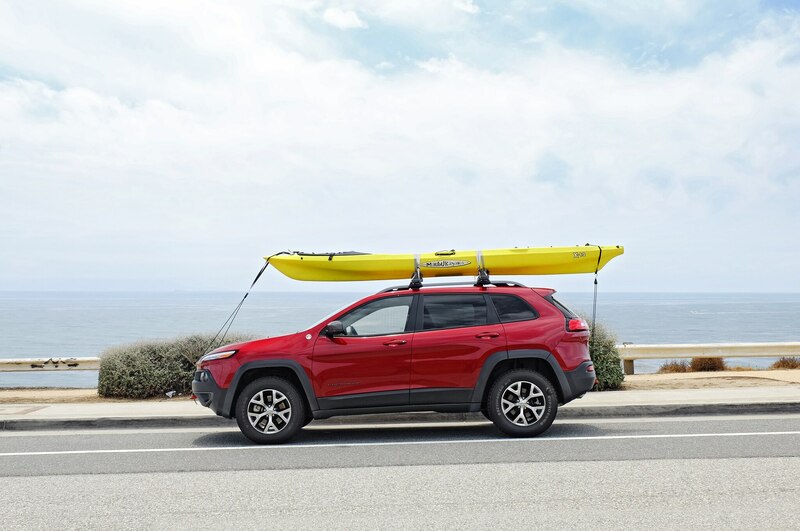 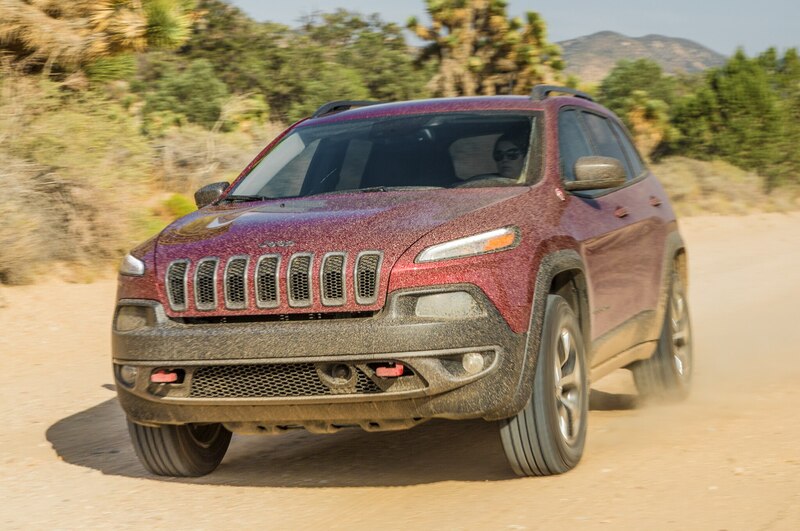 Jeep continues to grow into an ever more popular import brand for the Chinese market, and these four concepts—based on the Jeep Renegade, Cherokee, and Wrangler models—will test the consumer market for future China-focused design strategy. 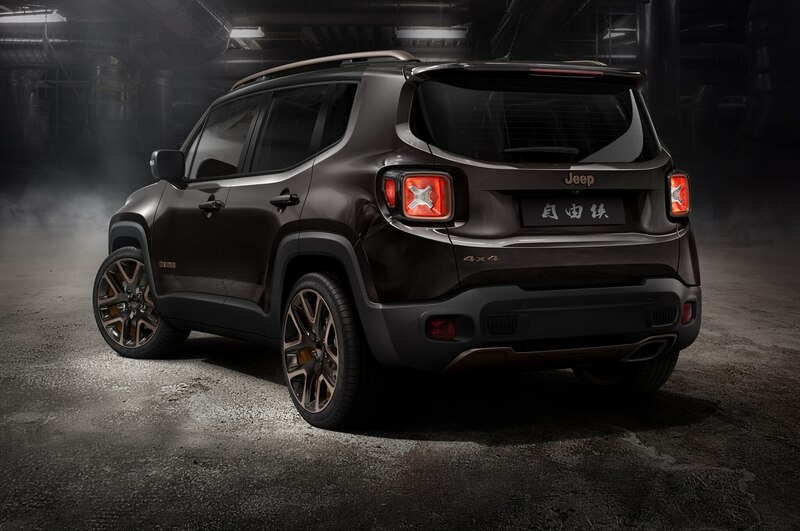 The Jeep Zi You Xia, or “rebel”, concept uses the four-cylinder Jeep Renegade as its jumping-off point. 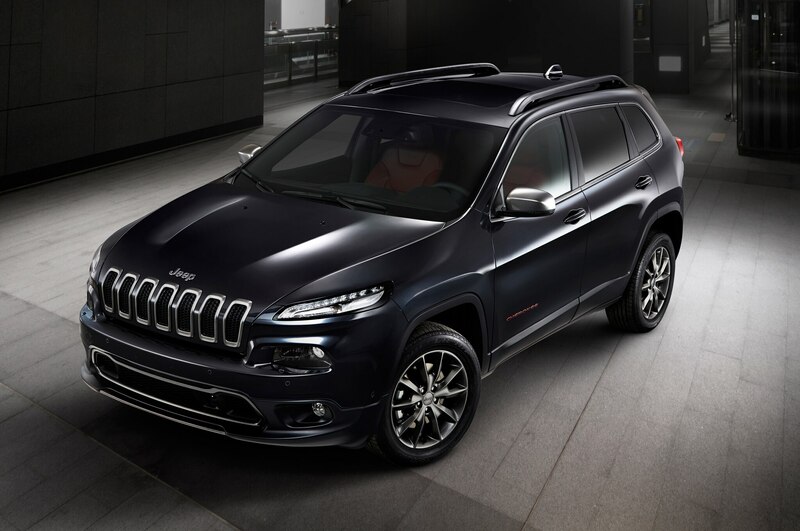 Jeep looked to bring a much more refined and style-conscious flair to the Zi You Xia concept, which starts with the compact crossover’s rich, dark-colored exterior design scheme. 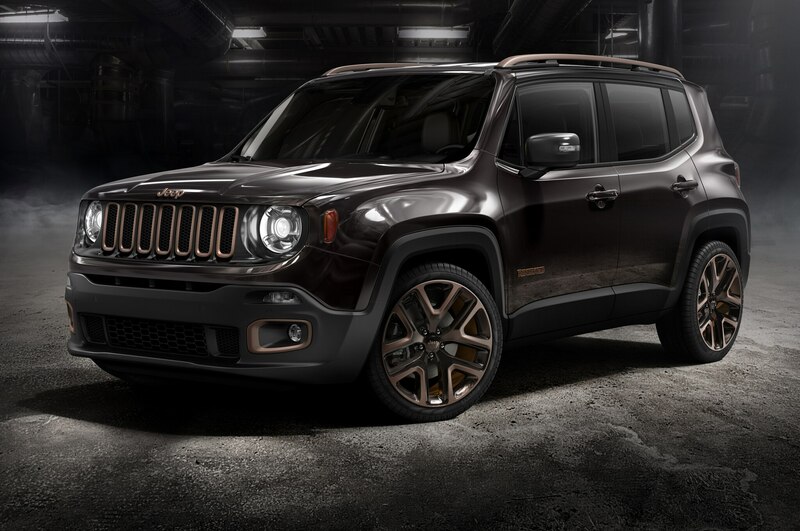 Warm Chocolate Grey paint contrasts with Dark Anodized Bronze accents on the grill outlines, fog lamp bezels, rear lower fascia, taillamp bezels, and badges. 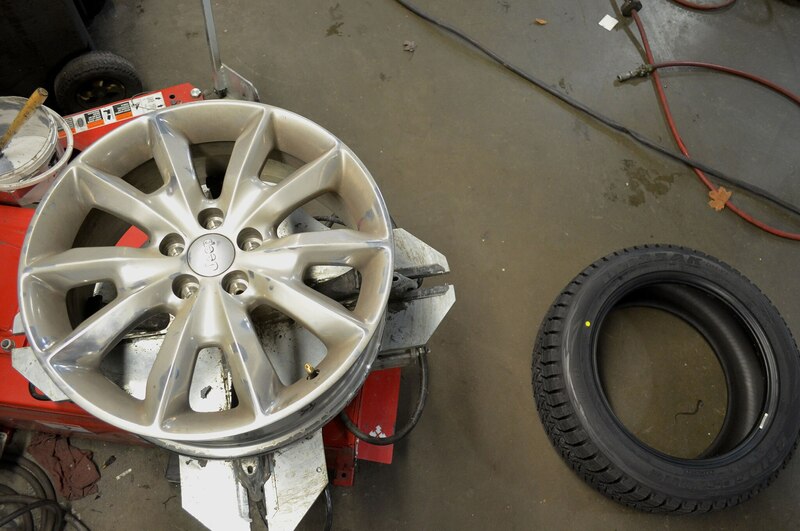 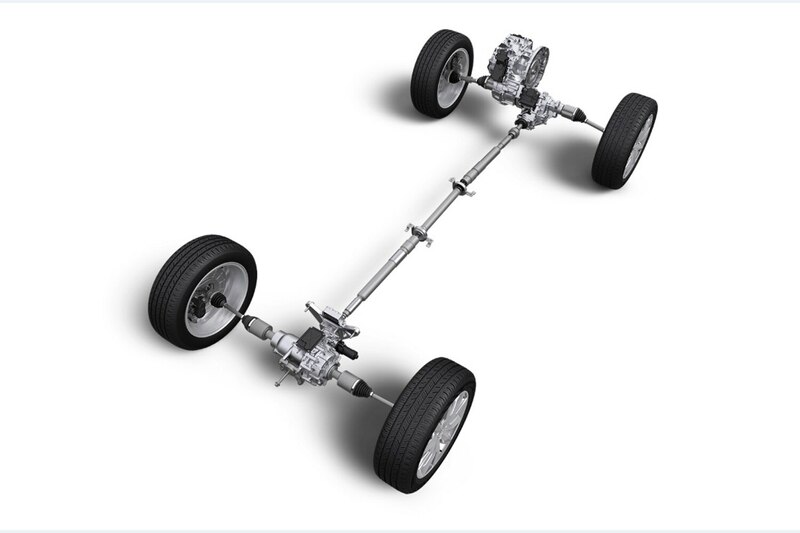 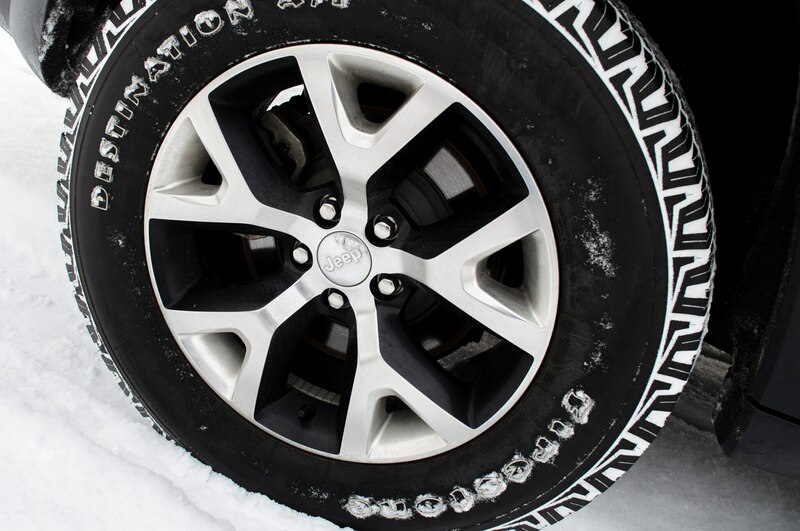 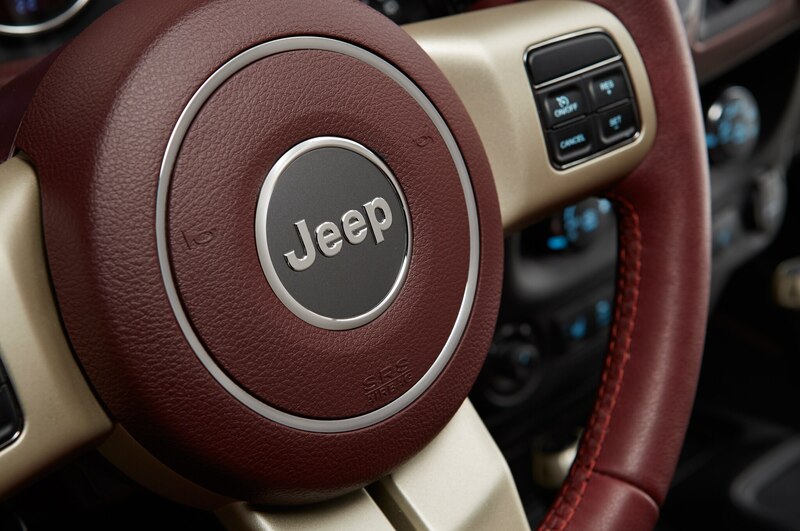 These elements match the concept’s 20-inch Anodized Bronze wheels, as well. 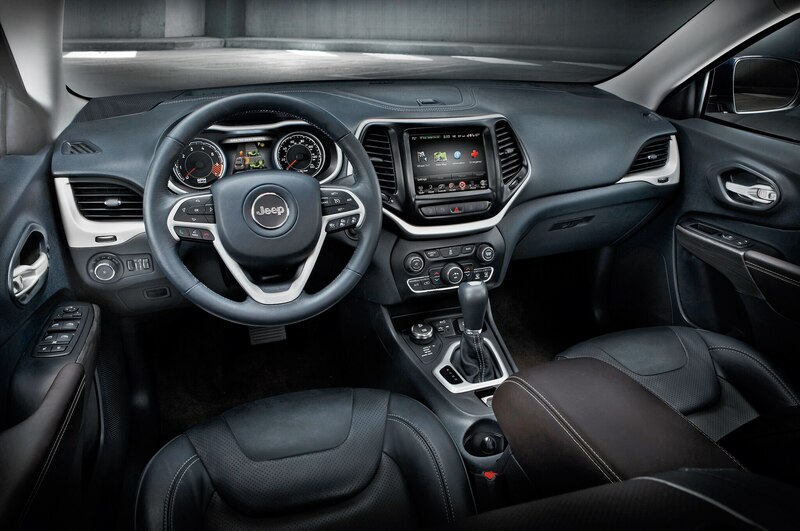 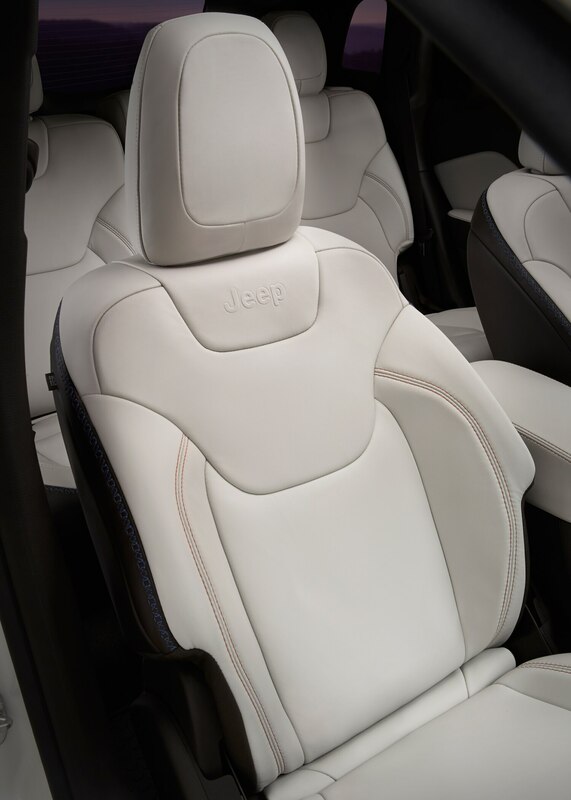 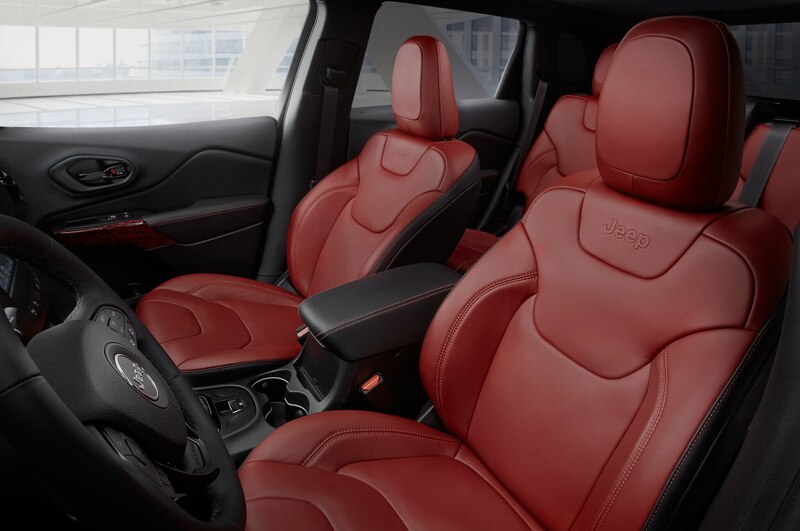 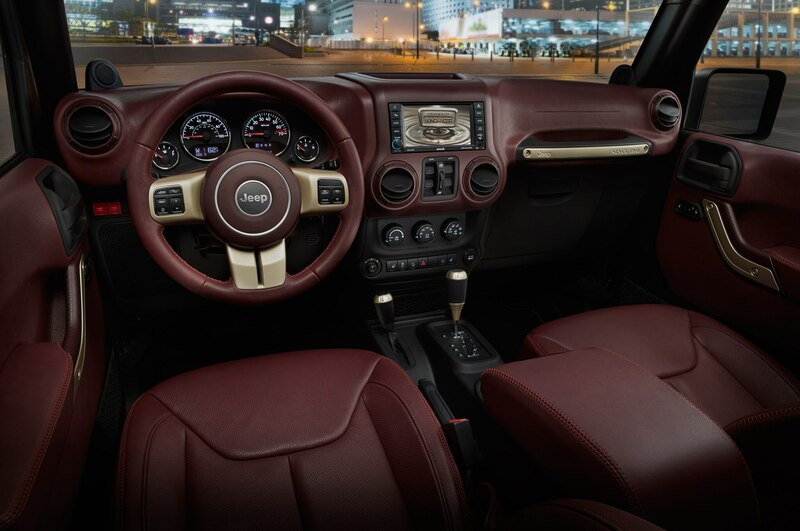 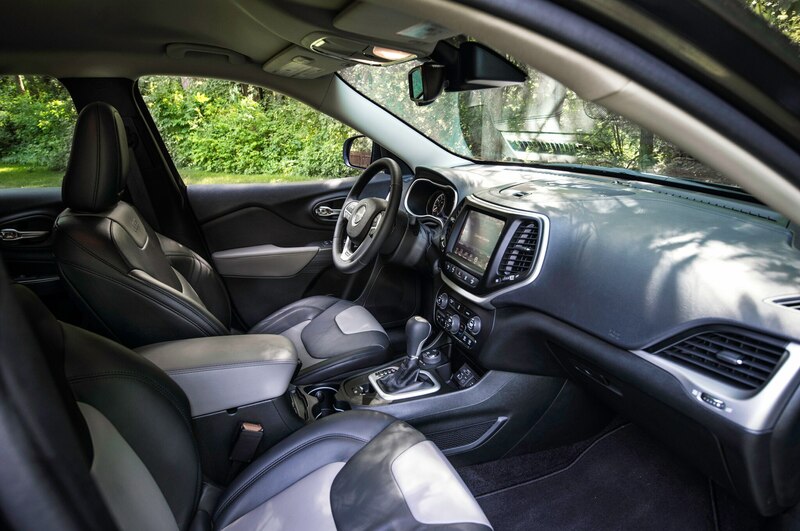 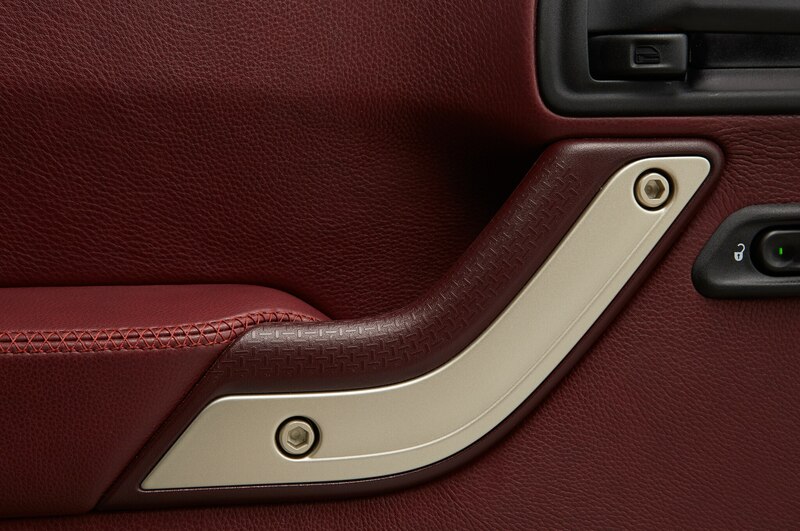 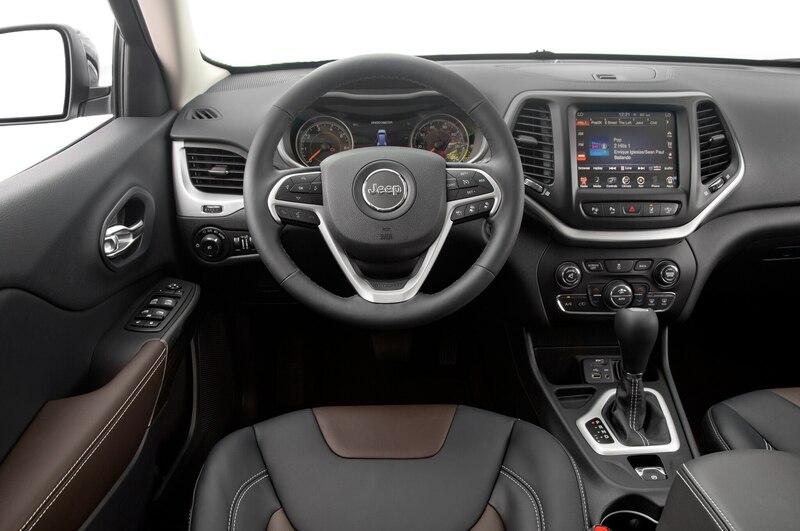 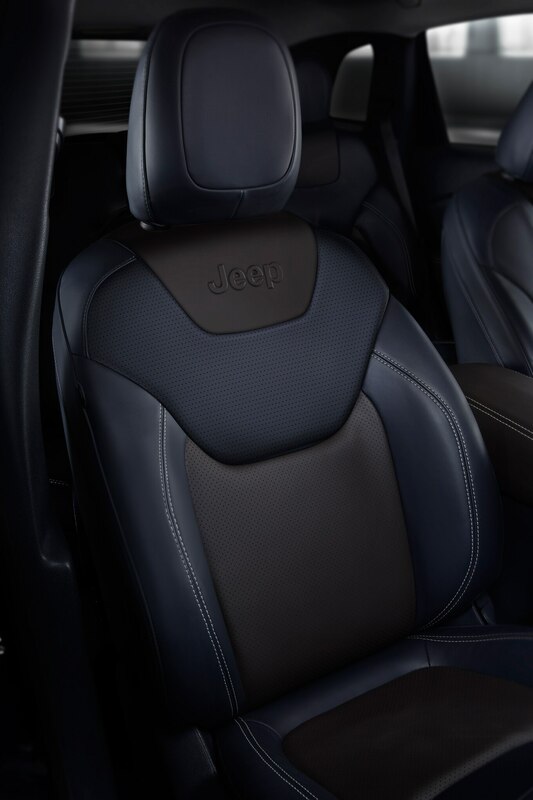 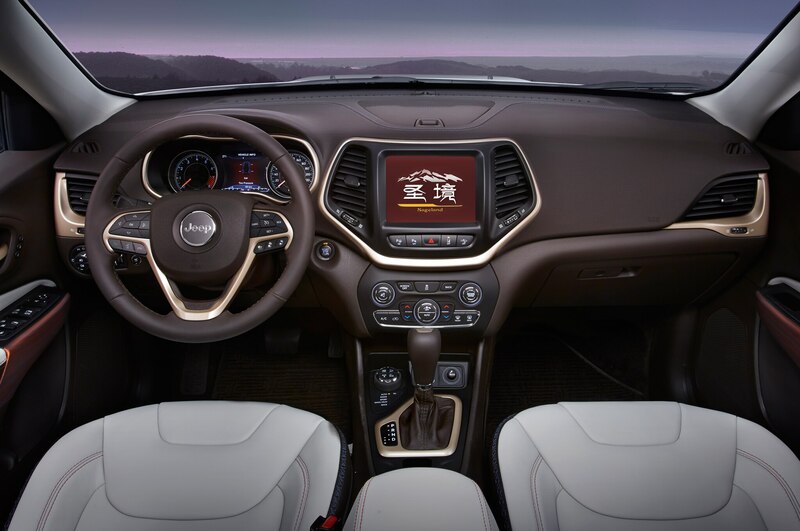 On the Jeep Zi You Xia concept’s interior, the same dark-color scheme continues. 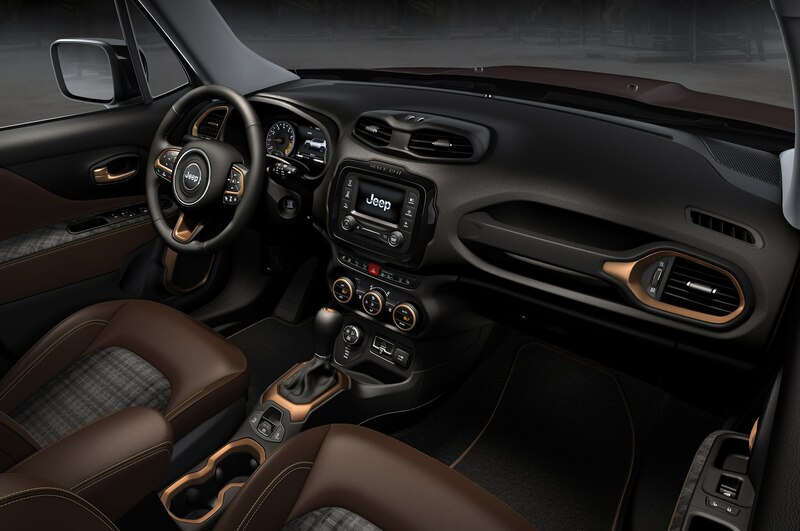 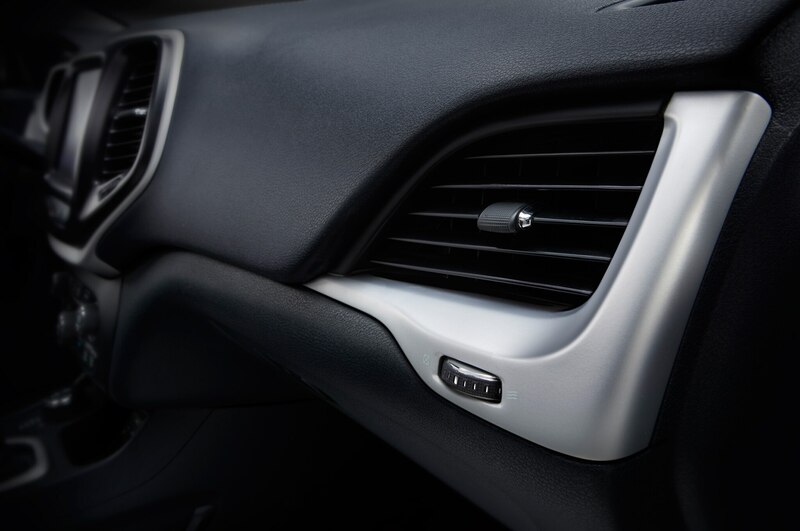 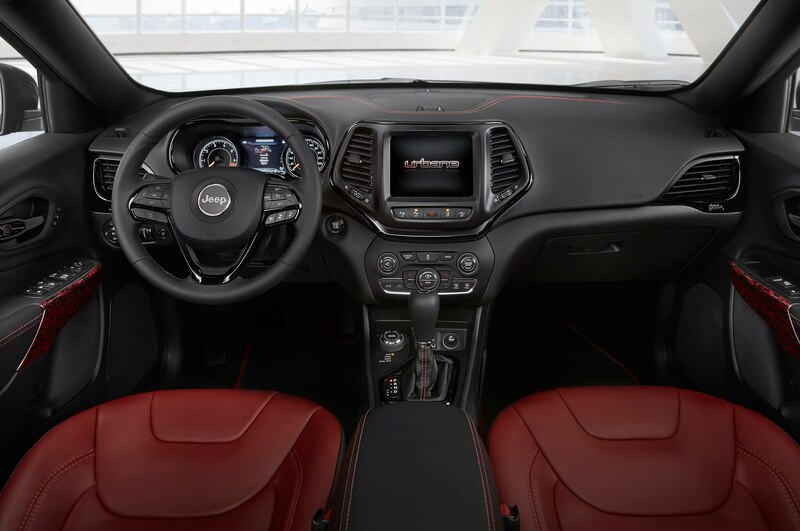 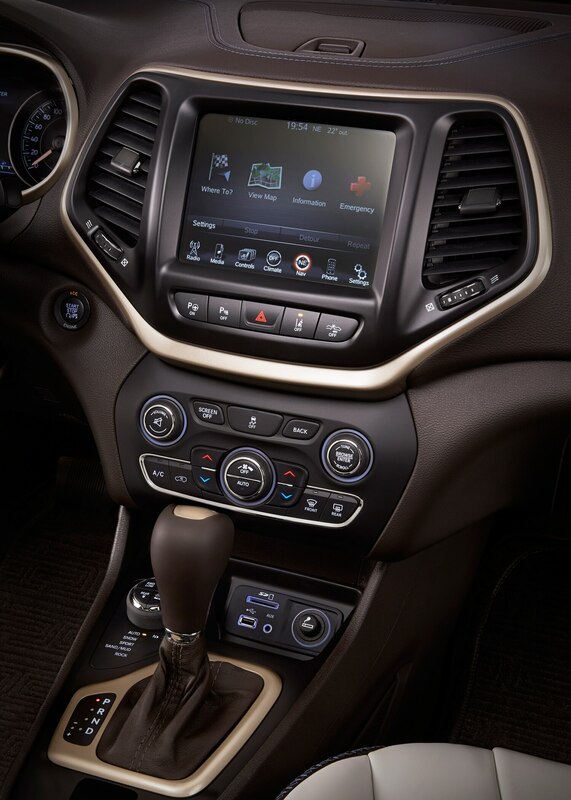 Anodized Copper metallic trim on the air vents, speakers, shift console, cupholders, and climate control knobs stand out prominently against the Piano Black interior and grey A-pillars. 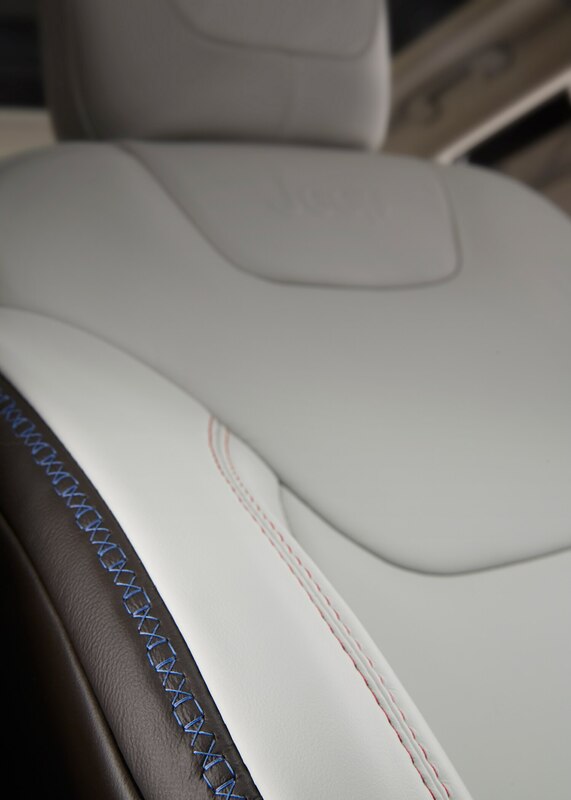 Completing the sporty-premium atmosphere are plaid fabric seat inserts supposedly meant to evoke Chinese menswear and tailored suit patterns. 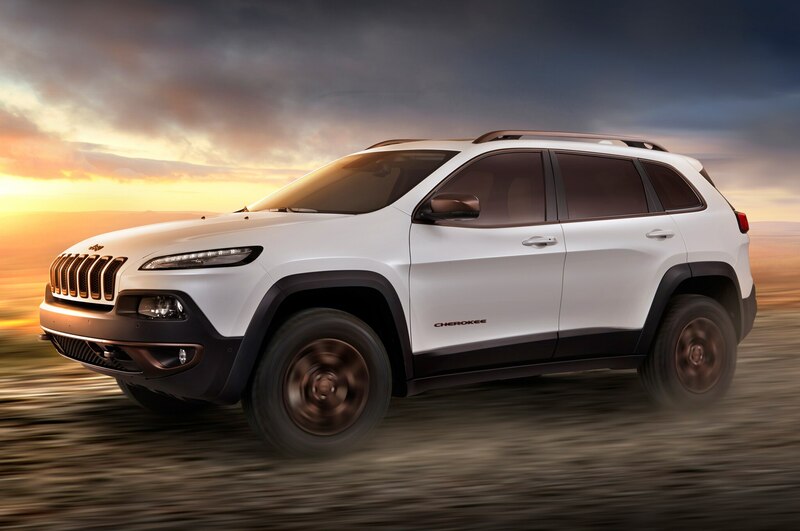 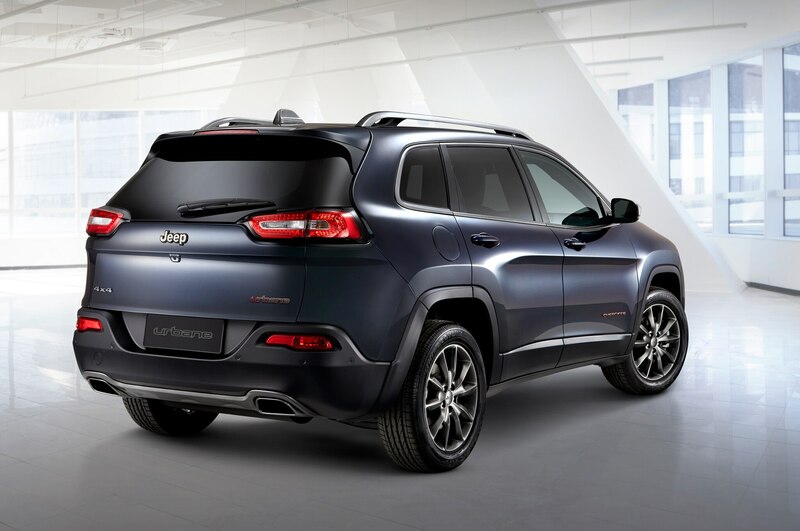 Following the launch of the Jeep Cherokee in China earlier this year, the Sageland concept brings a sense of Chinese history and nature to the midsize SUV. 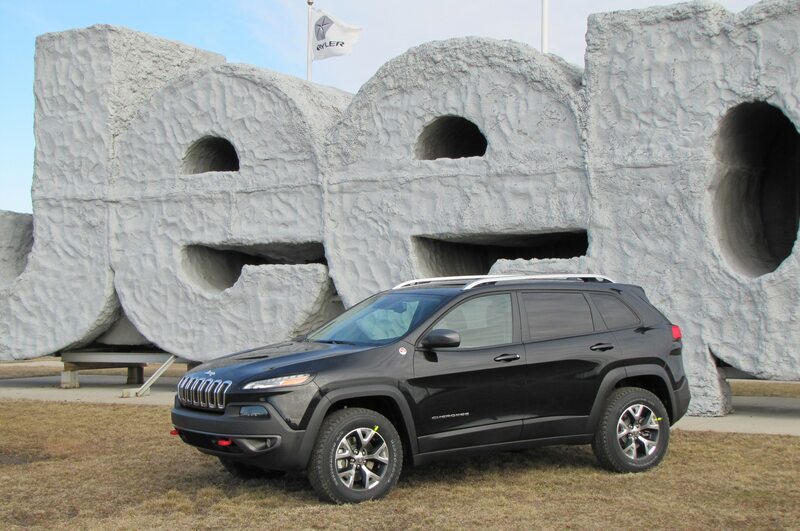 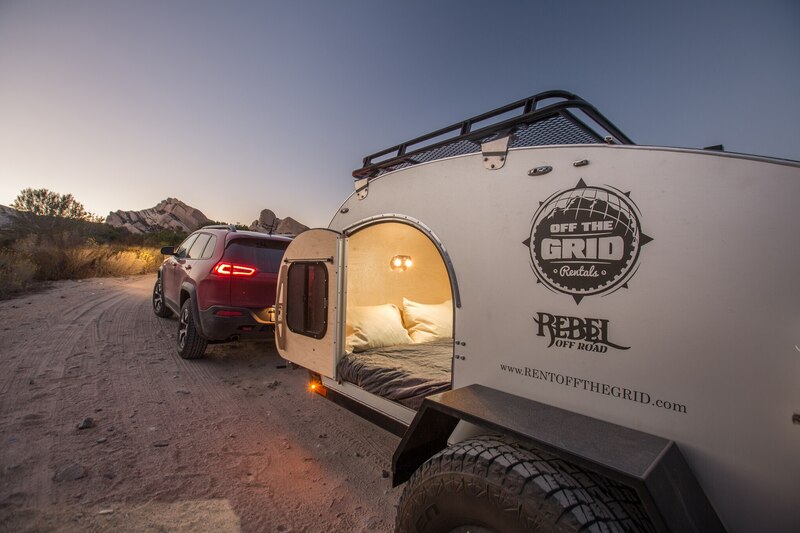 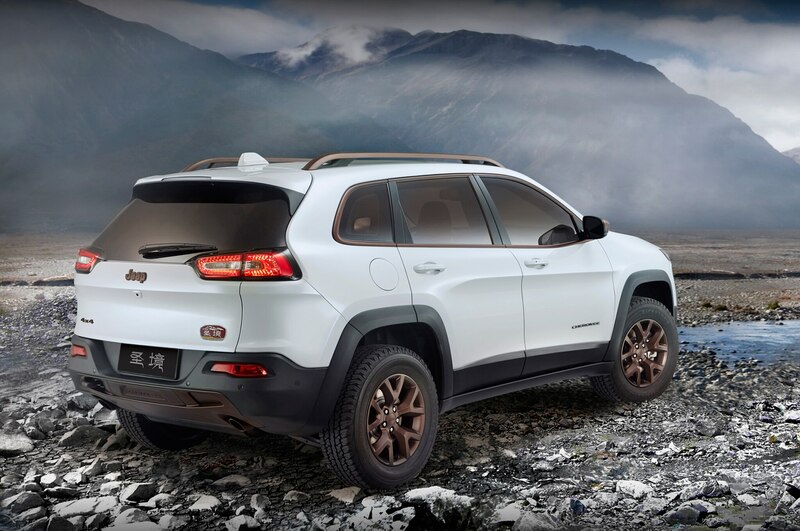 Jeep says it looked at the landscape of the mystical Shangri-La for the Sageland’s design, which features bright Ivory tri-coat Pearl white paint with earth-tone trim. 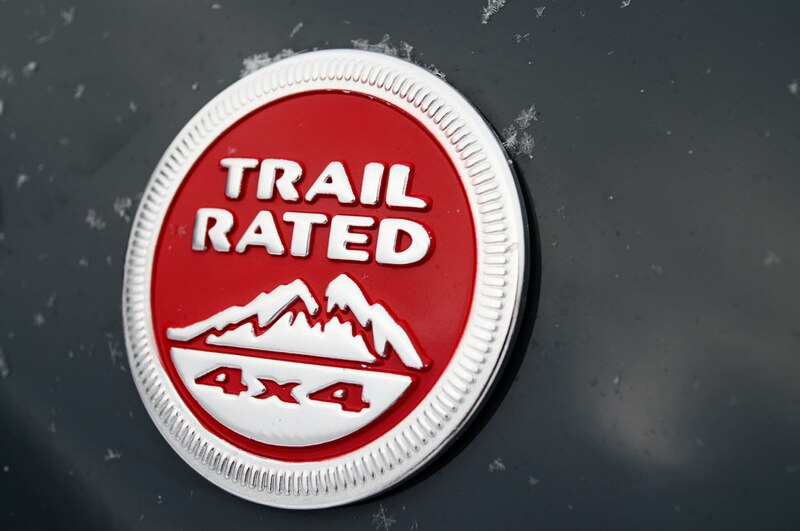 Grill surrounds, front fascia applique, roof racks, badging, door mirror caps, rear lower fascia, and exhausts tips are all treated with bronze metallic finish. 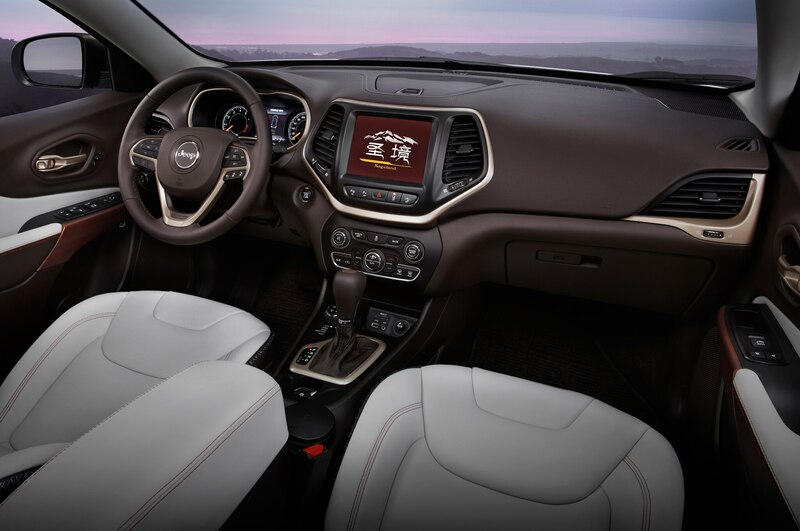 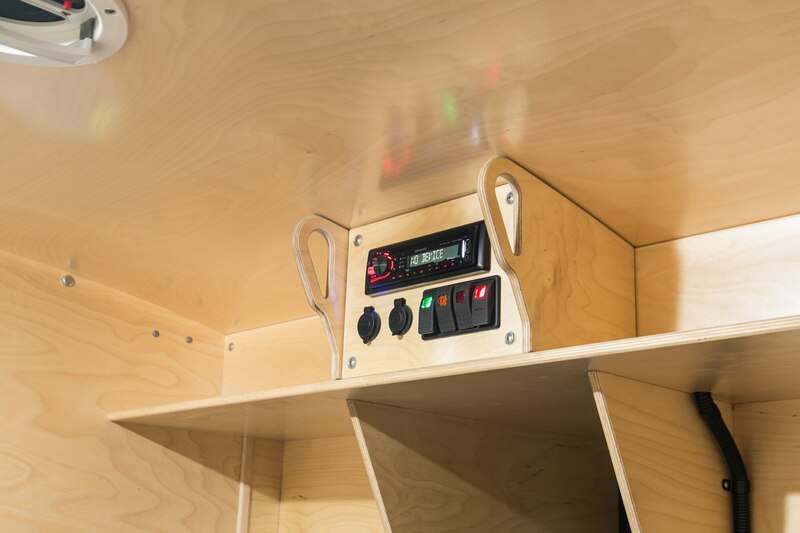 Notable interior features include Nappa leather seats with water blue accents meant to evoke traditional Chinese knot design, as well as door inserts mimicking the ornamental Chinese door knobs. 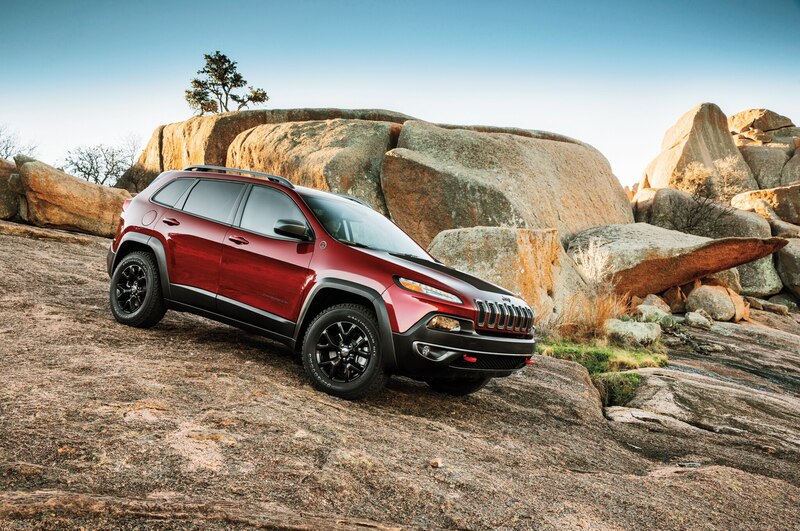 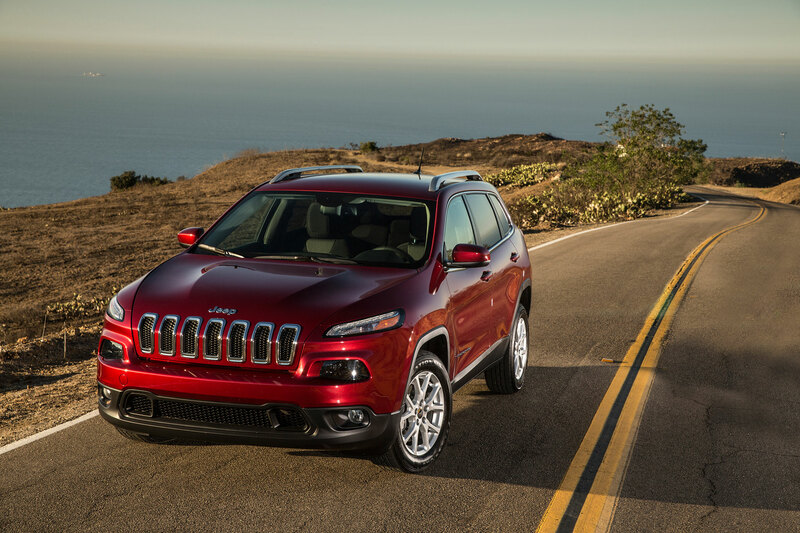 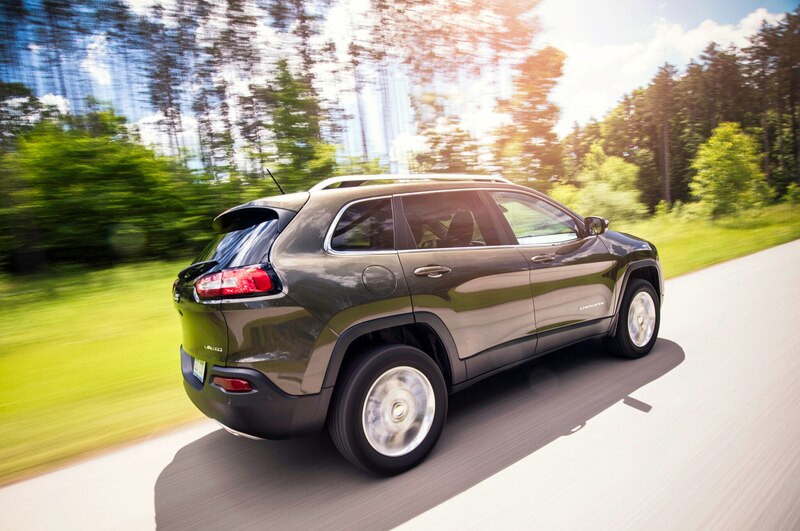 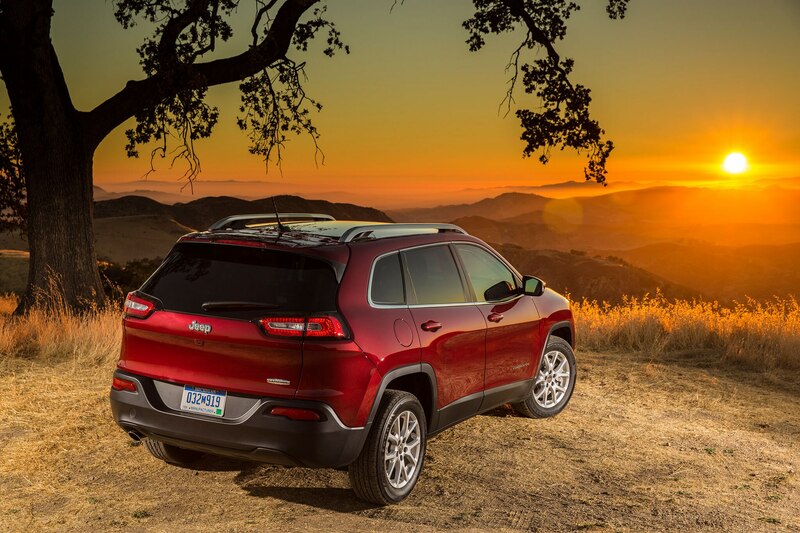 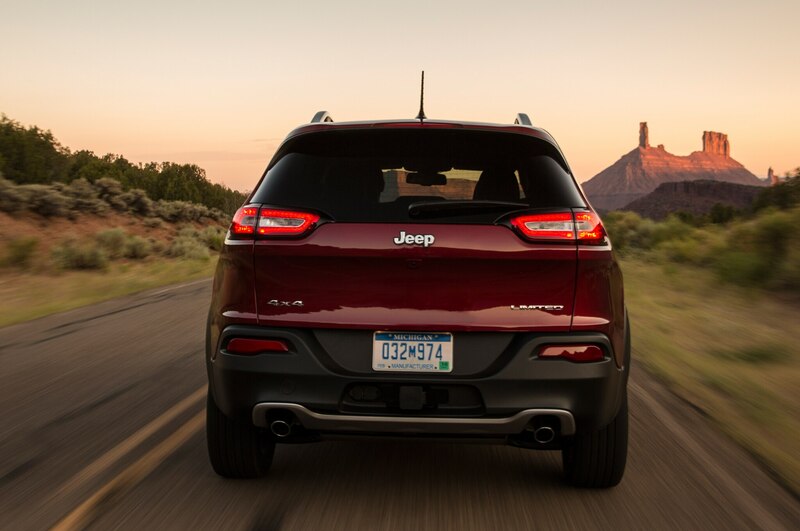 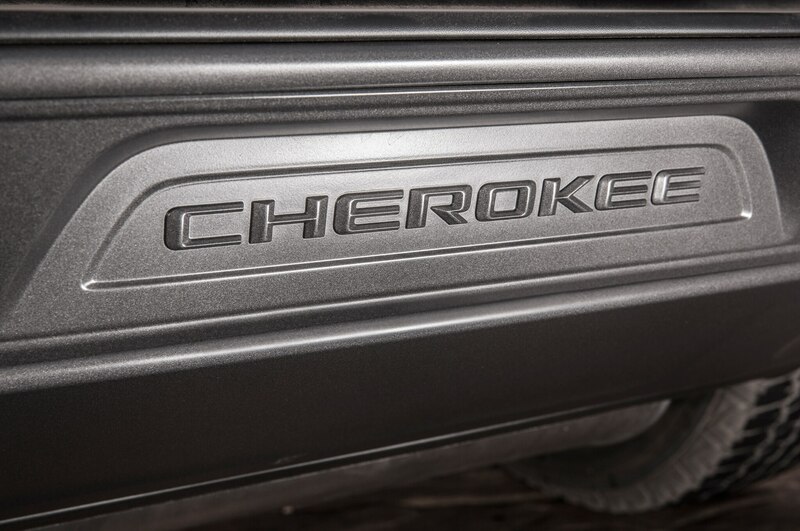 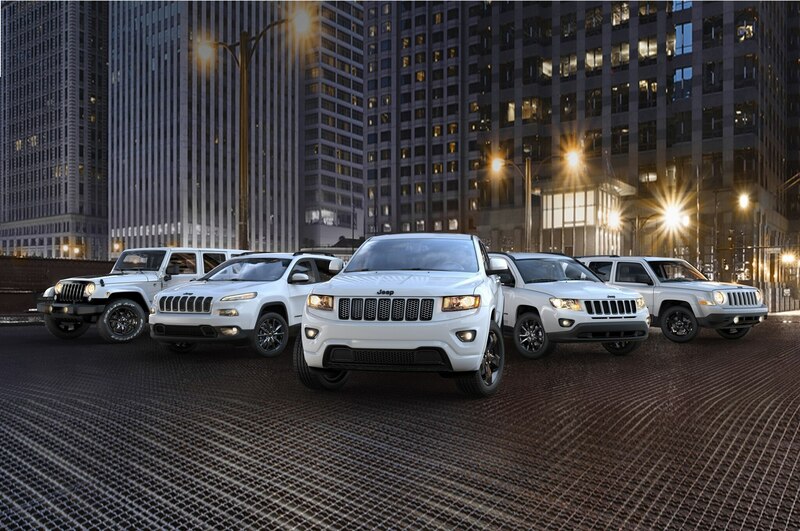 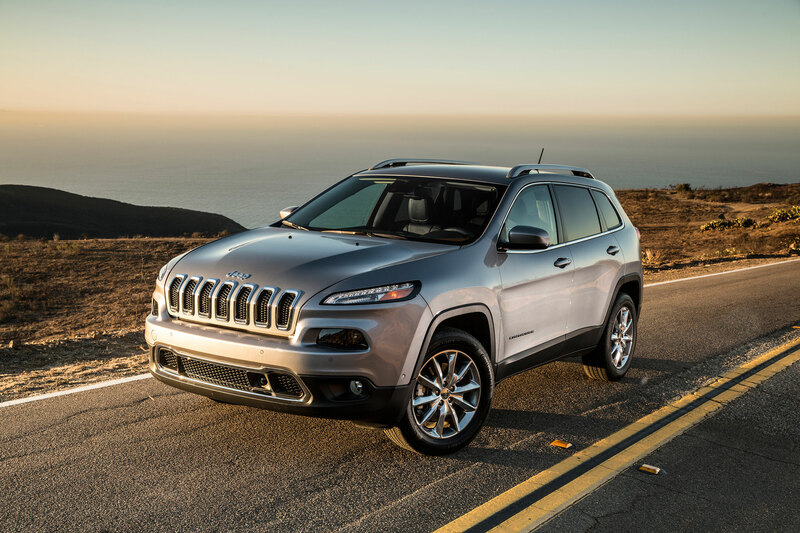 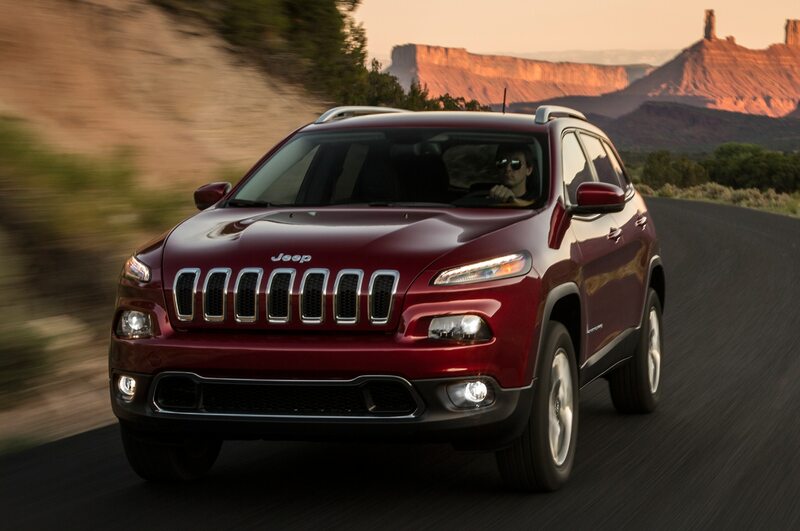 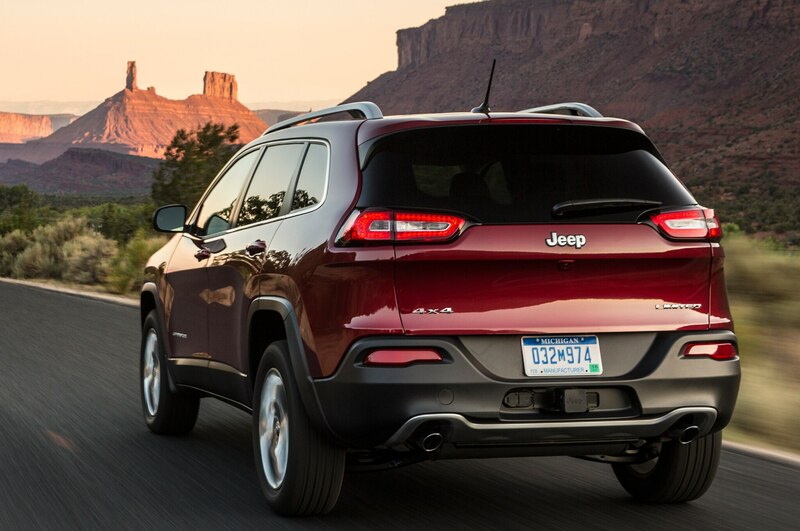 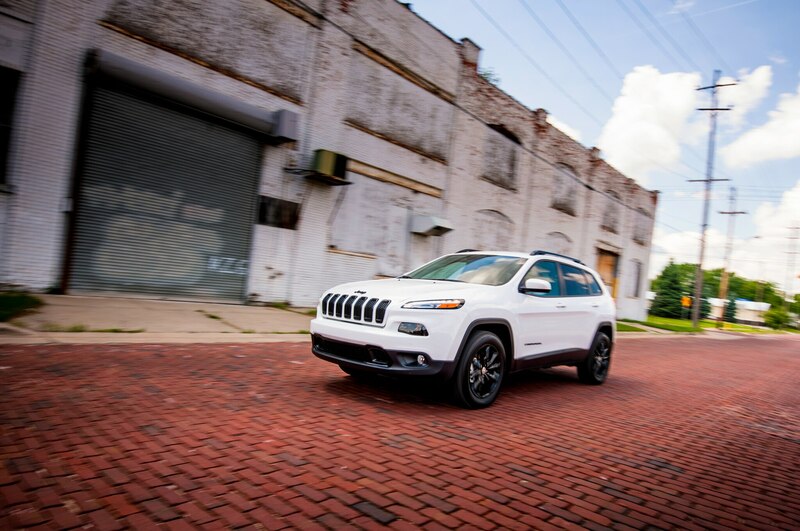 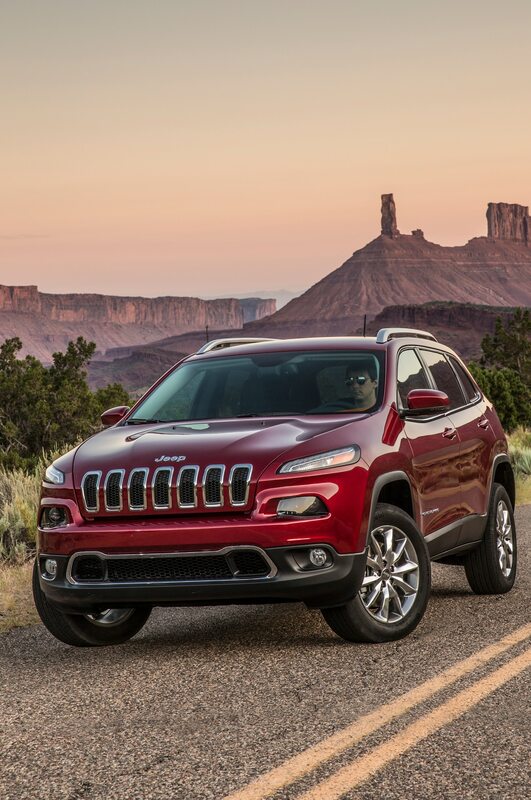 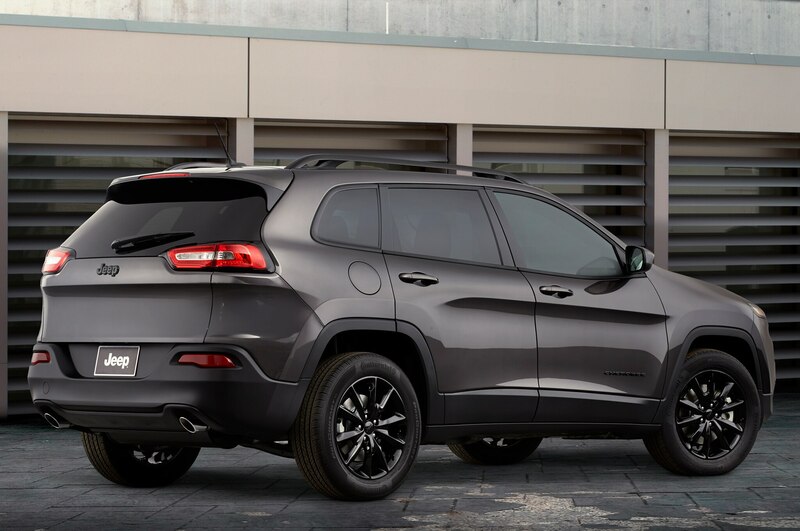 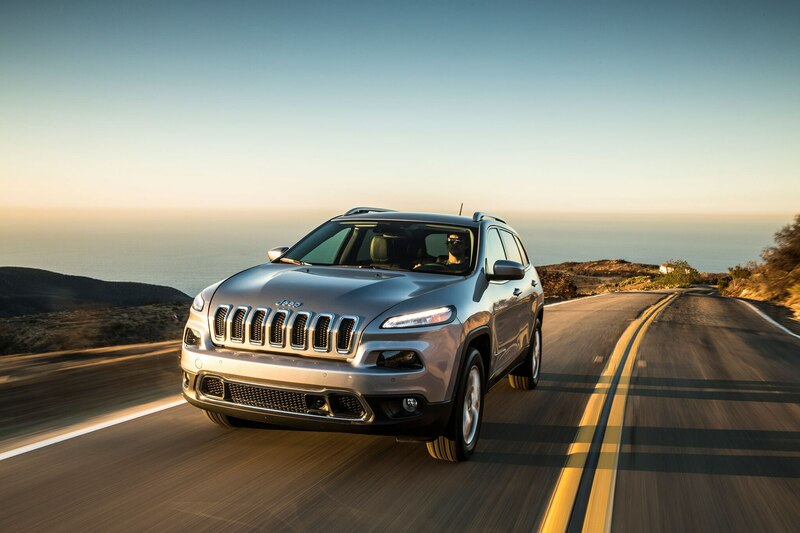 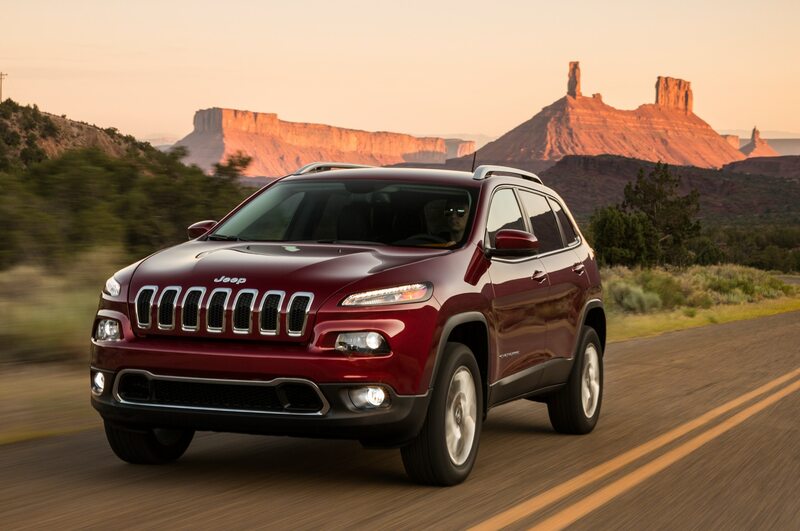 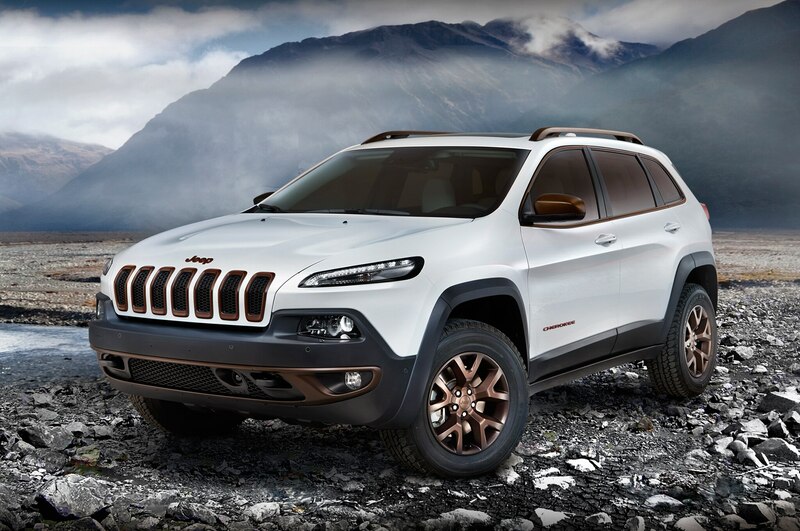 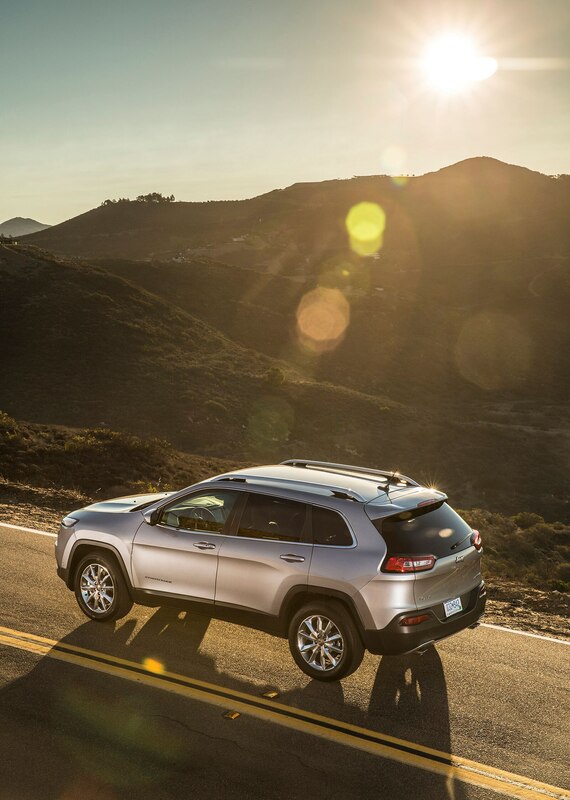 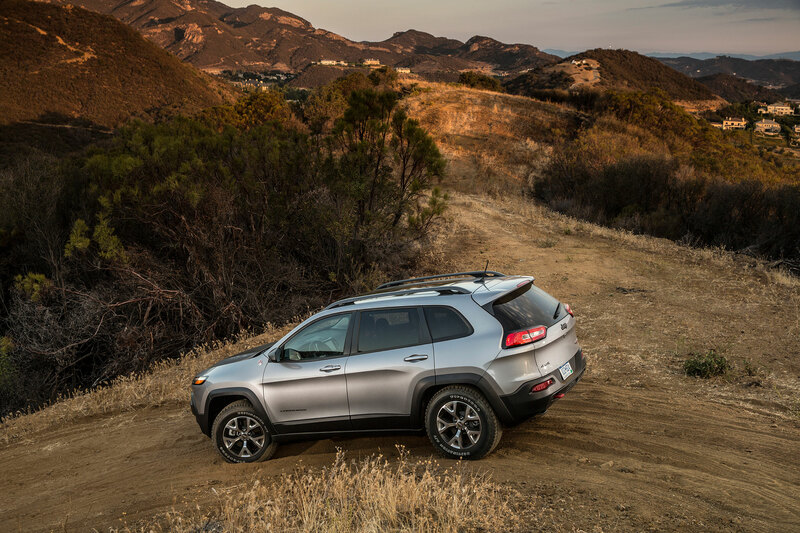 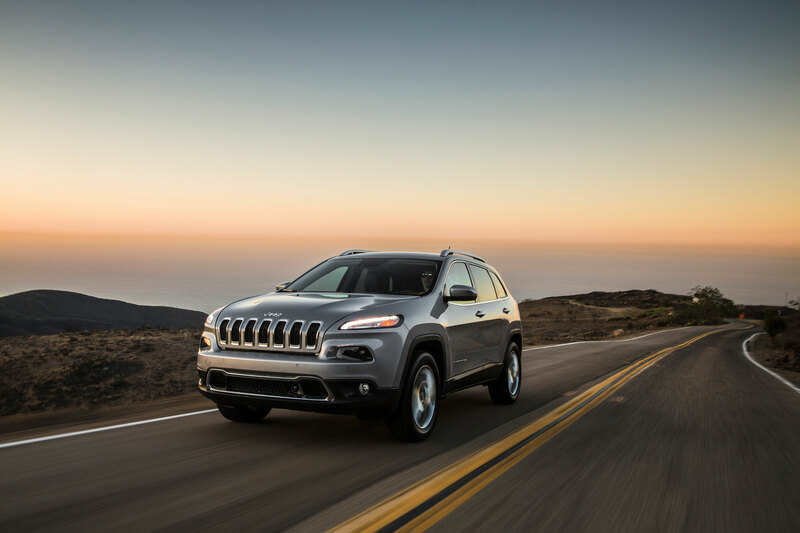 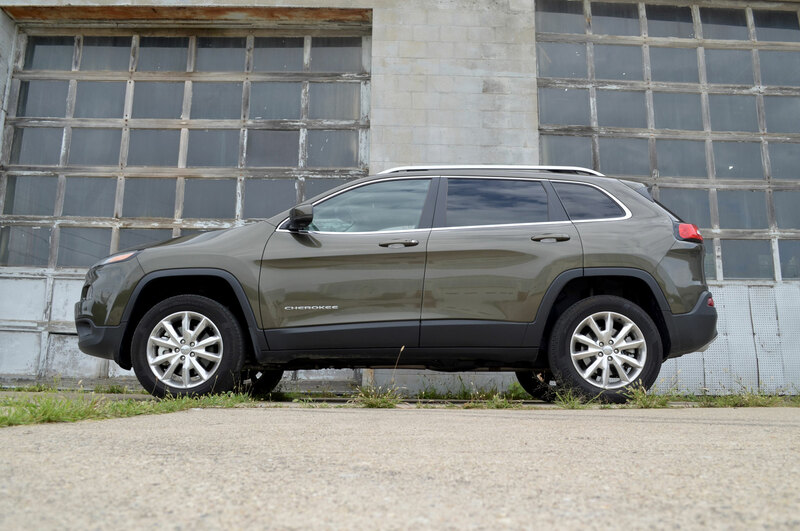 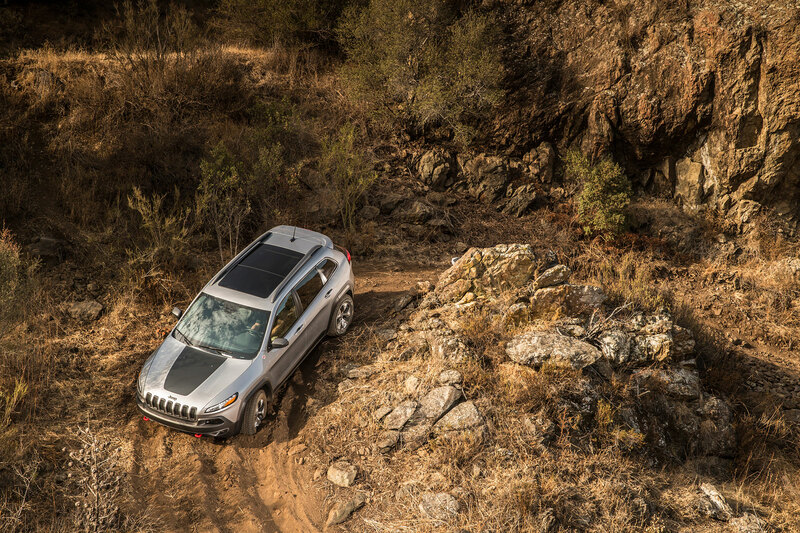 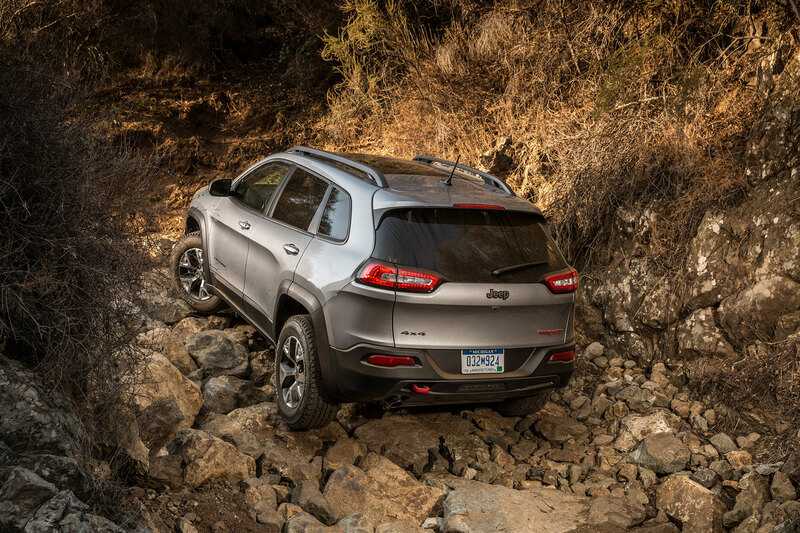 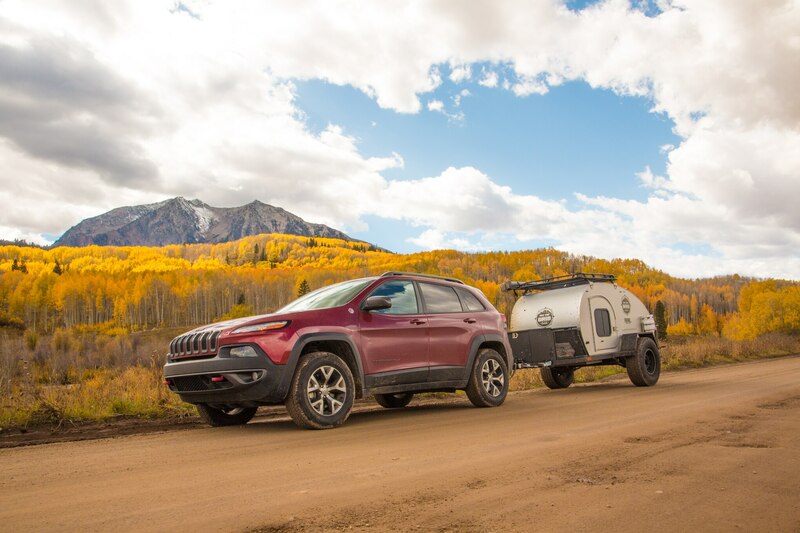 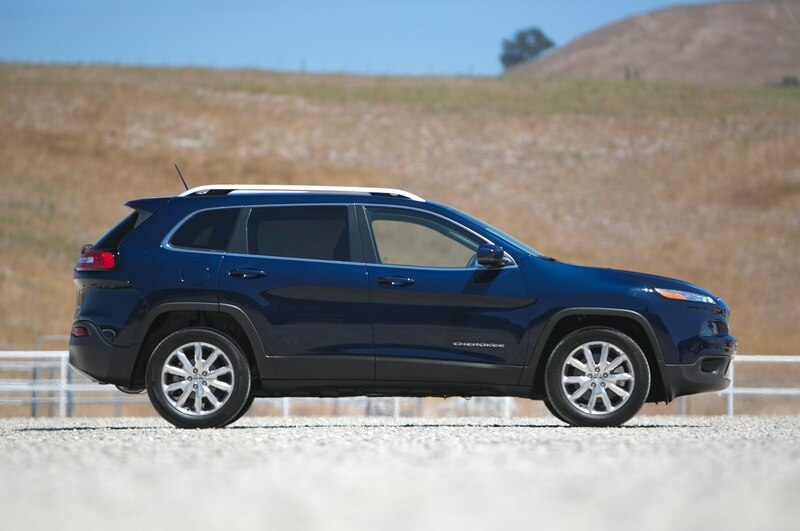 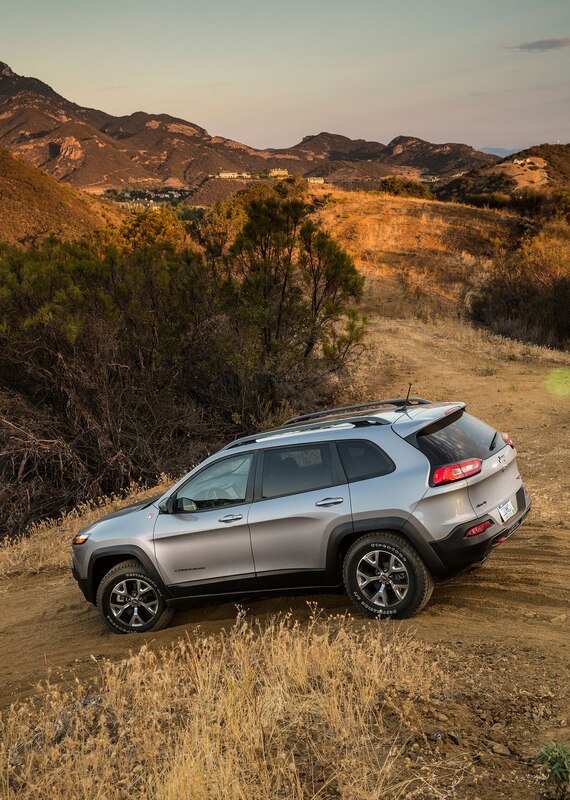 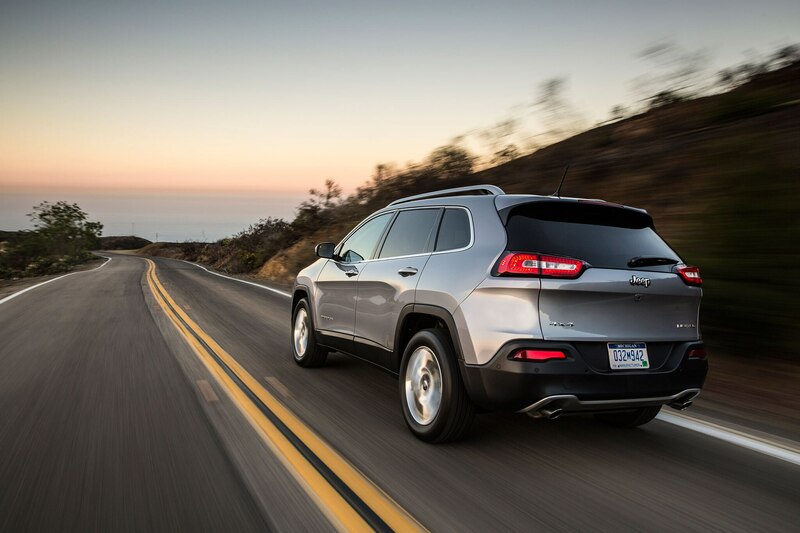 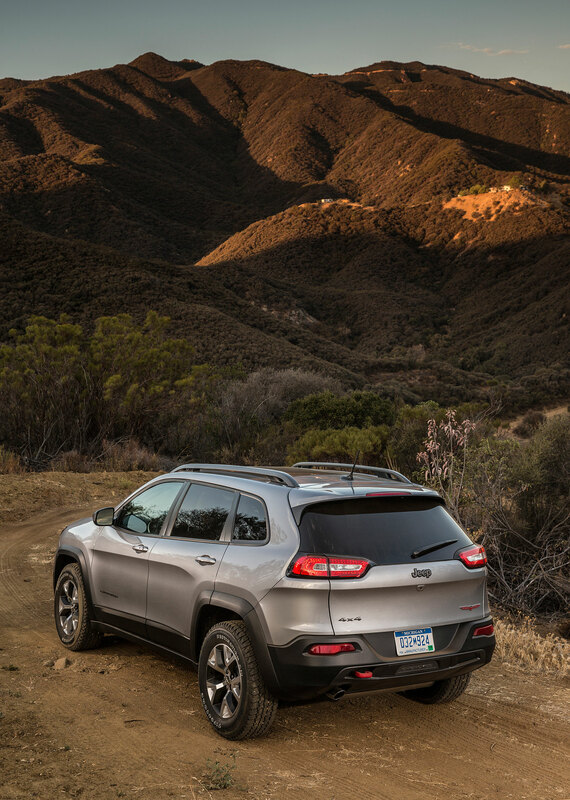 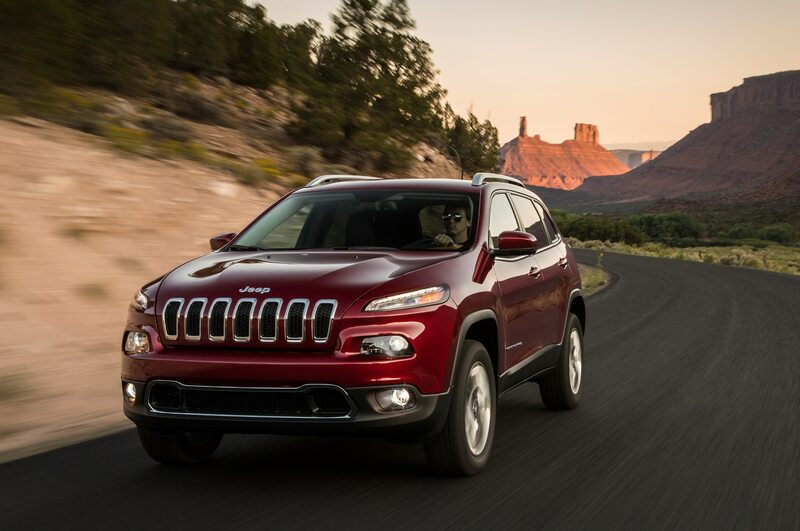 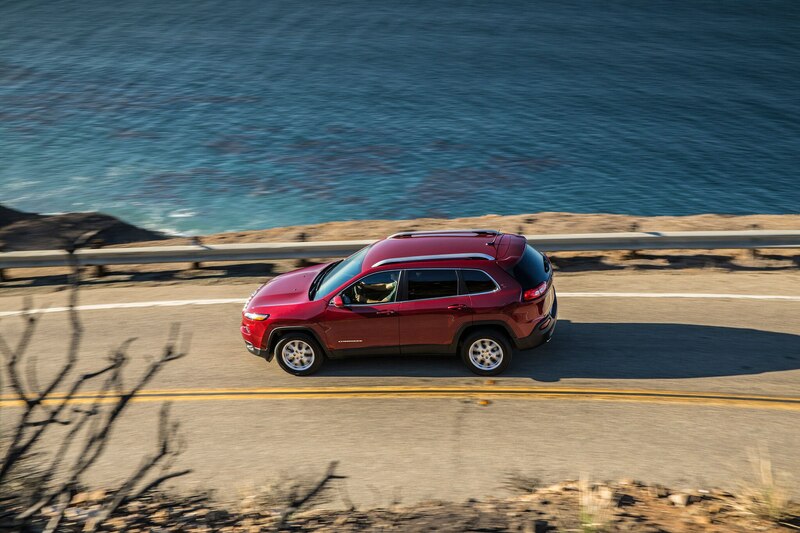 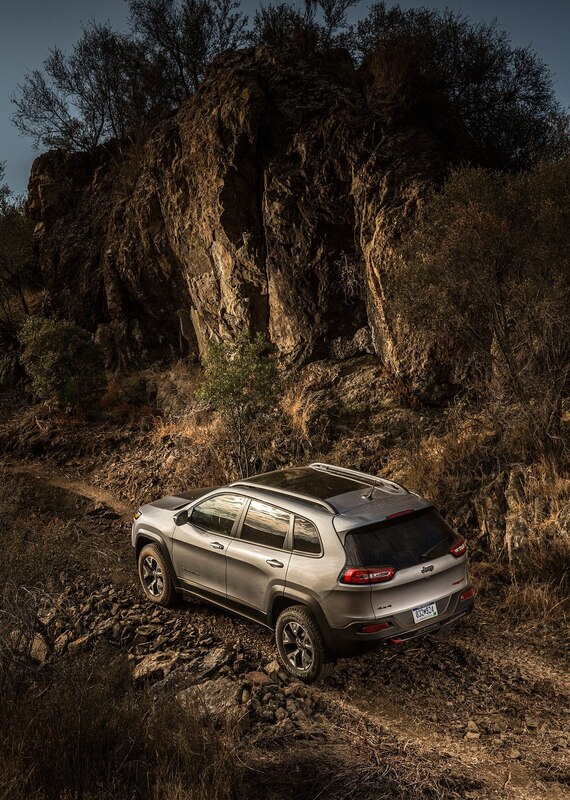 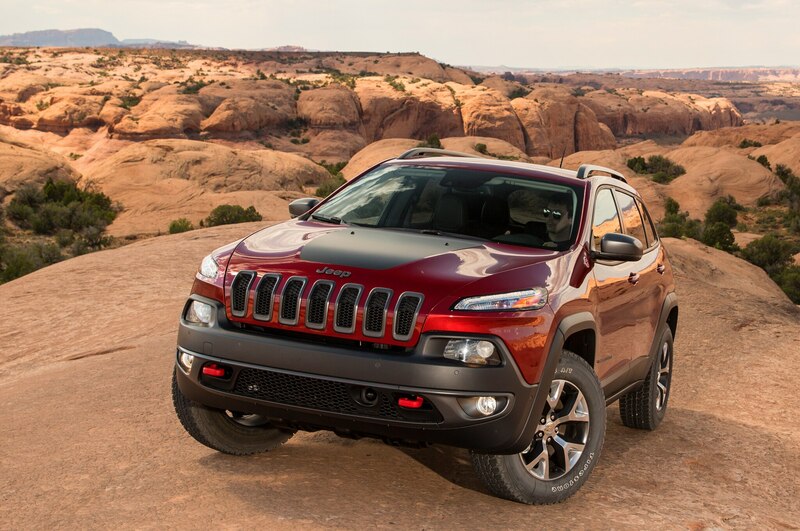 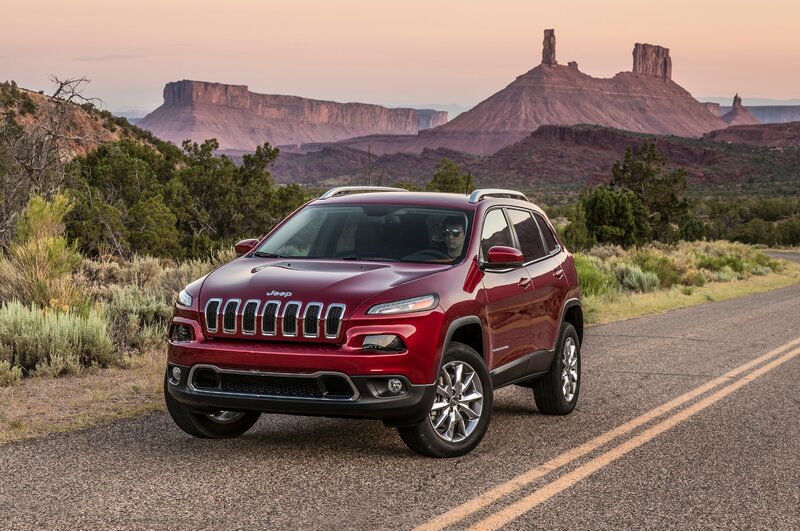 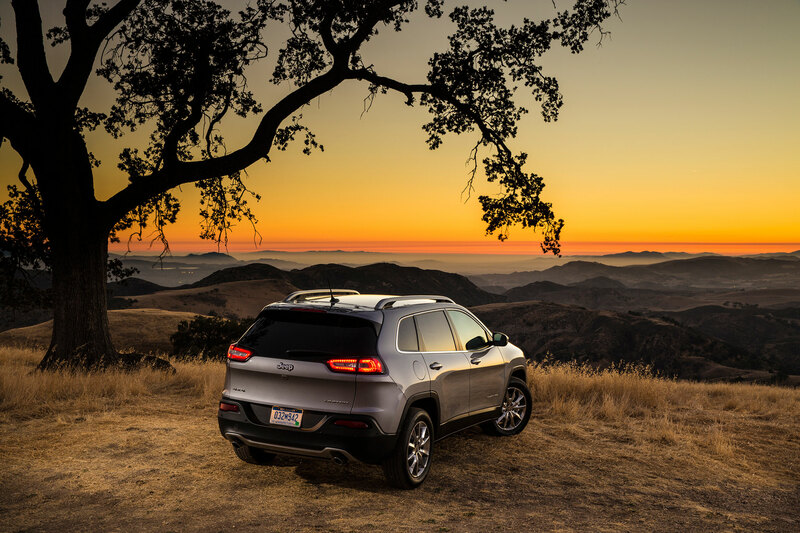 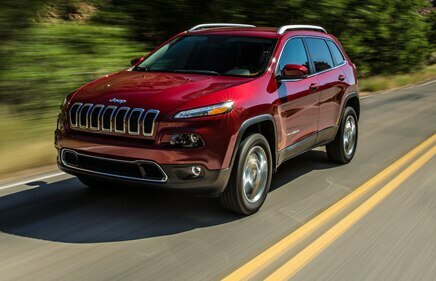 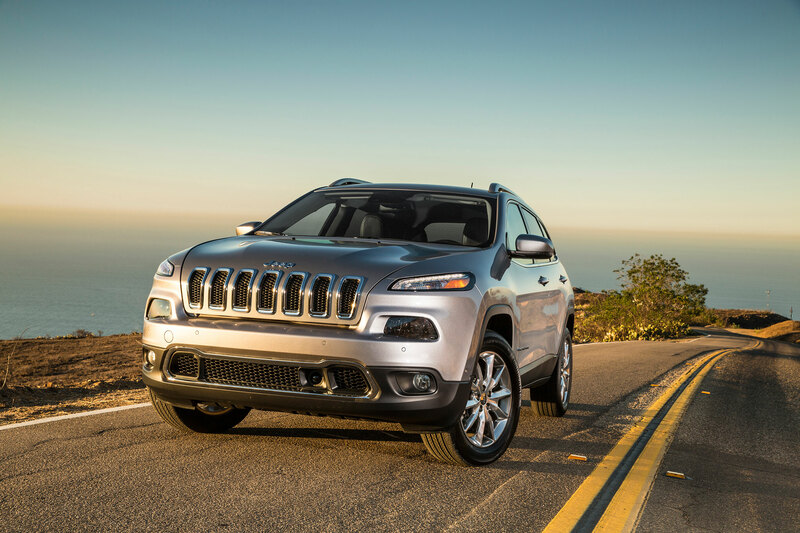 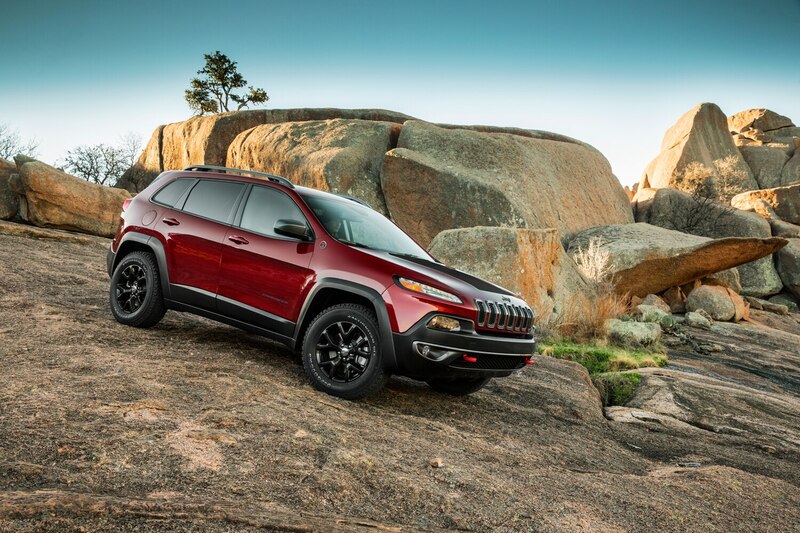 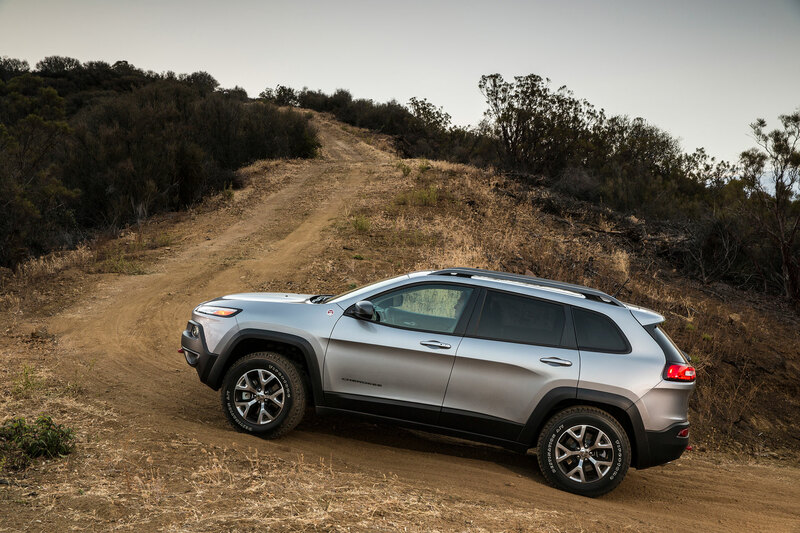 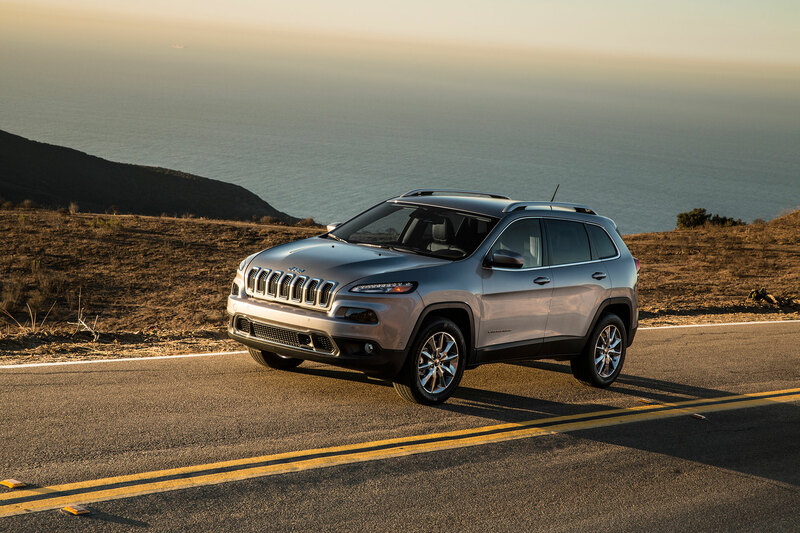 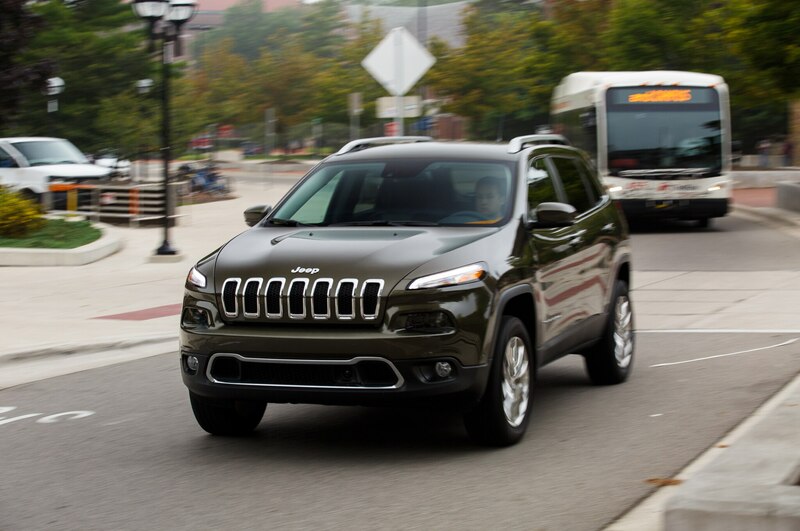 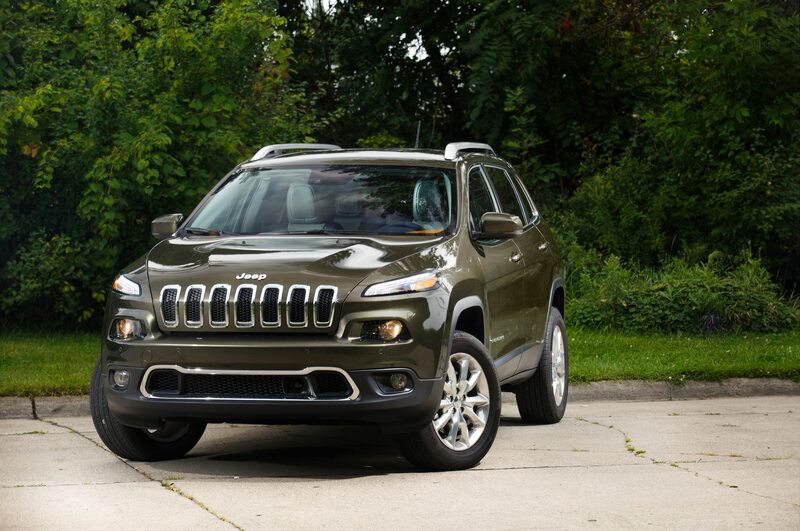 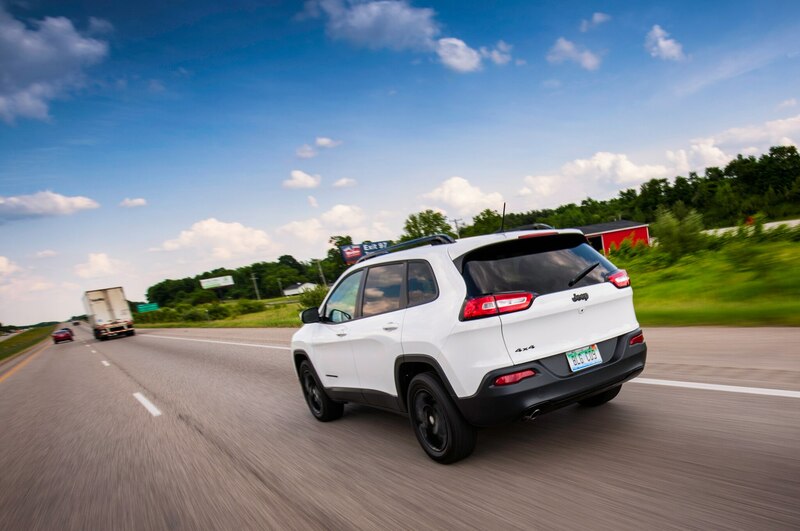 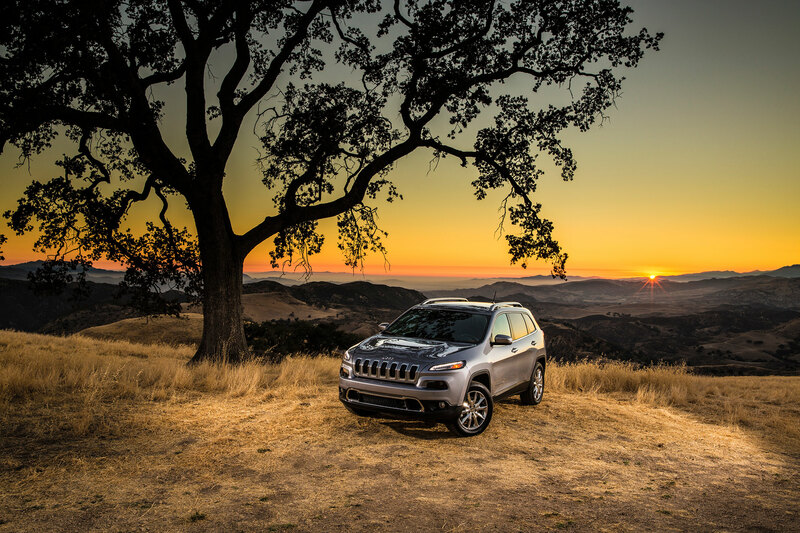 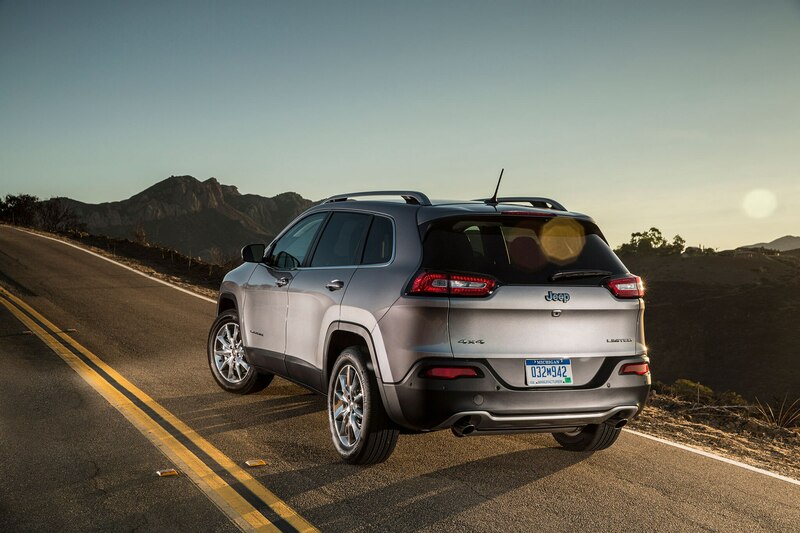 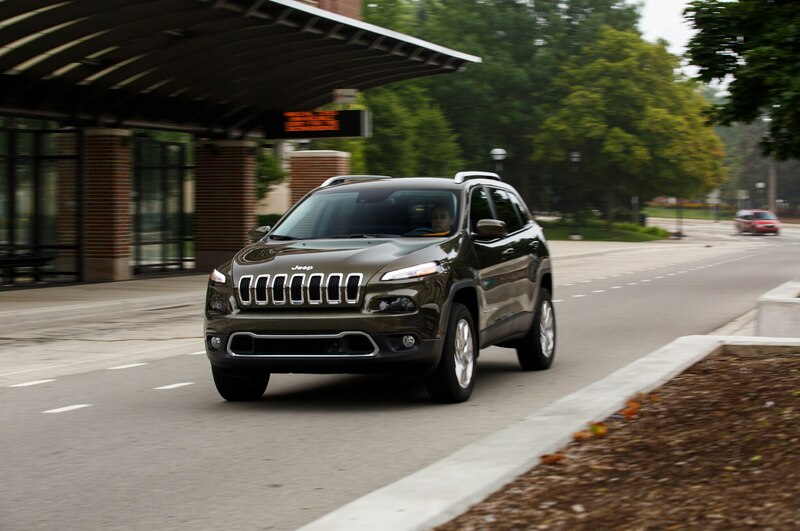 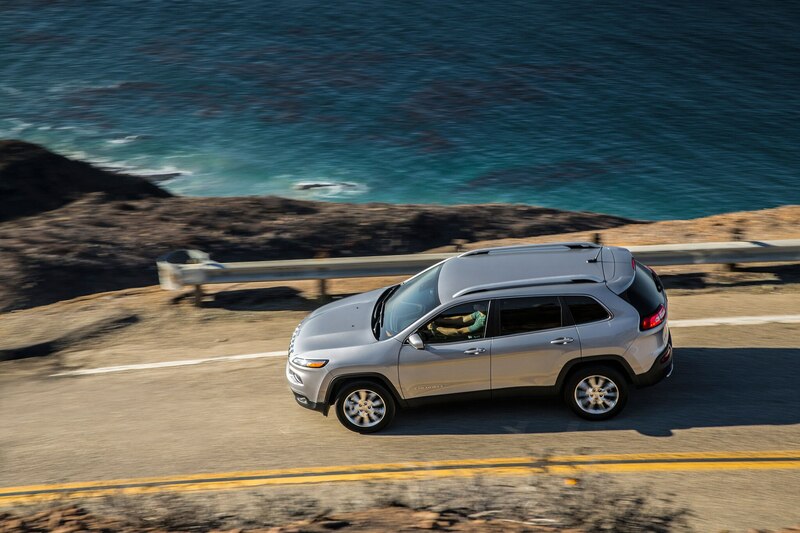 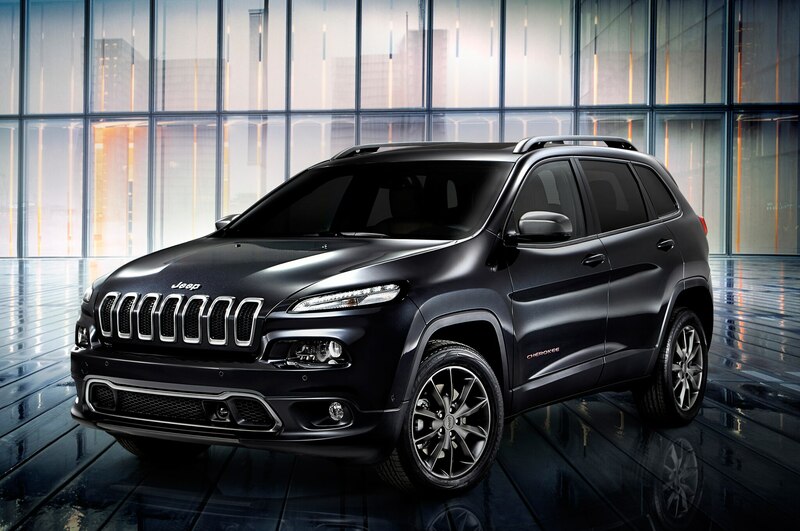 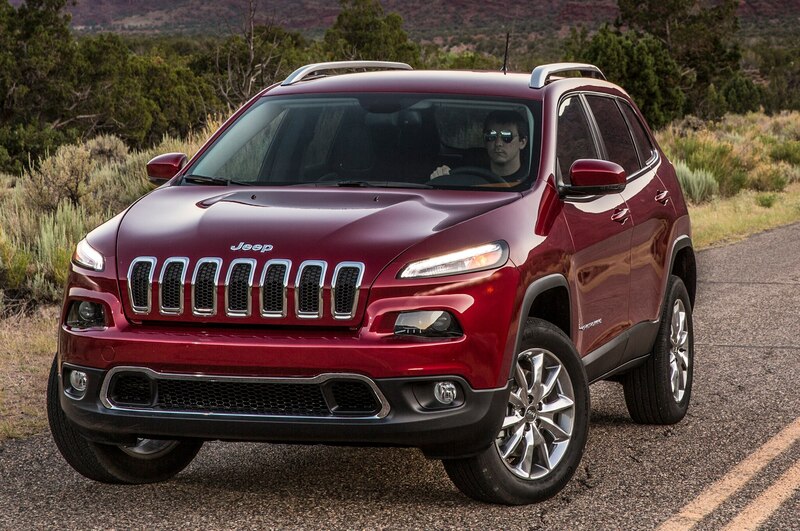 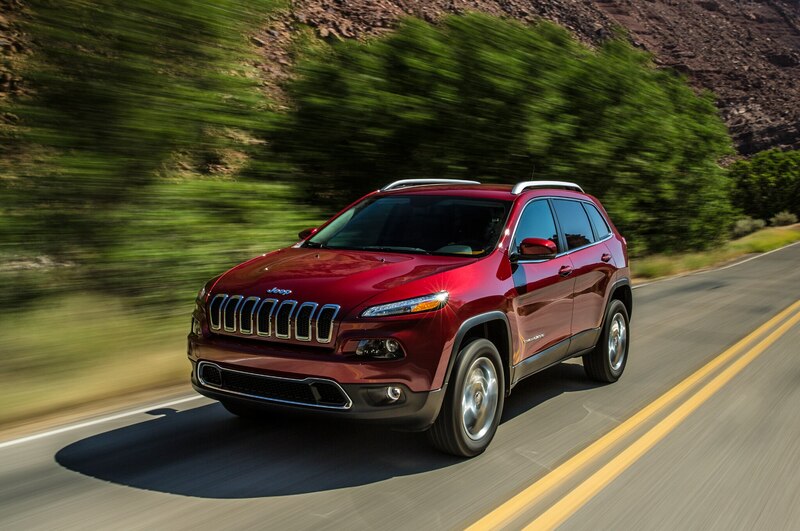 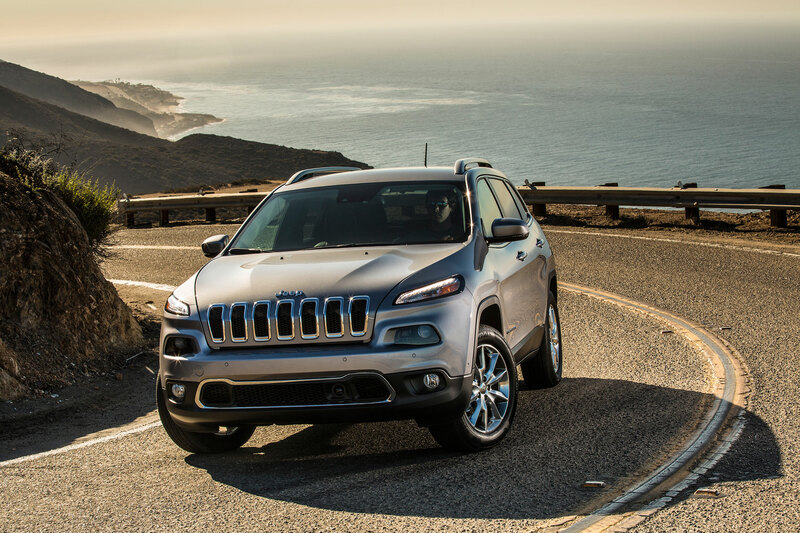 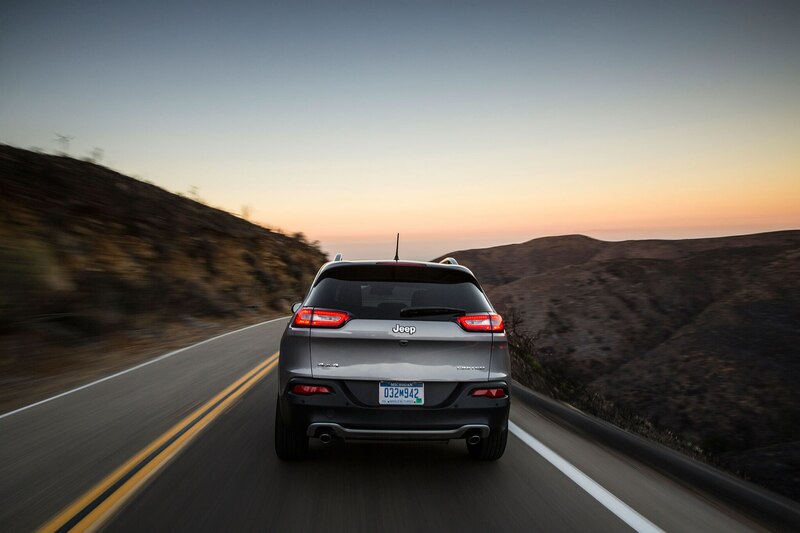 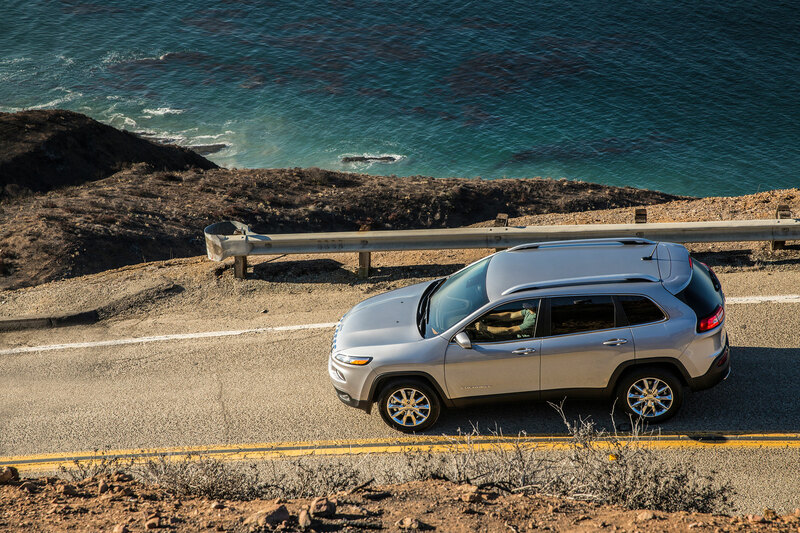 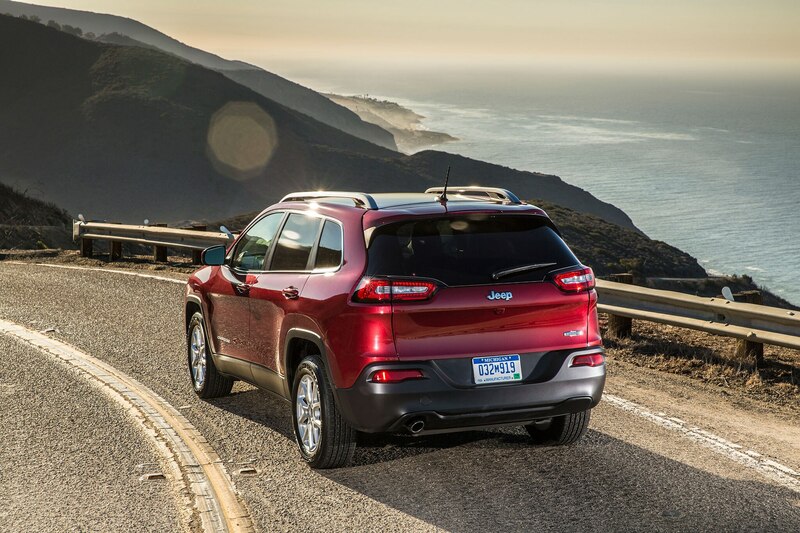 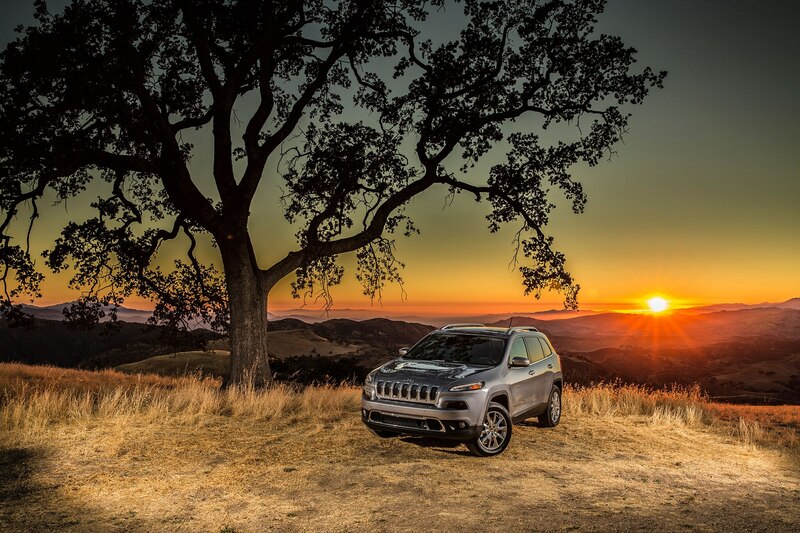 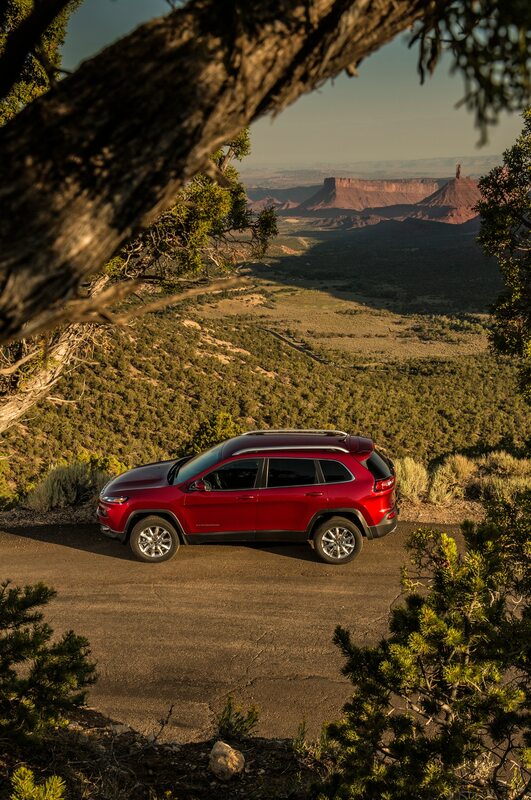 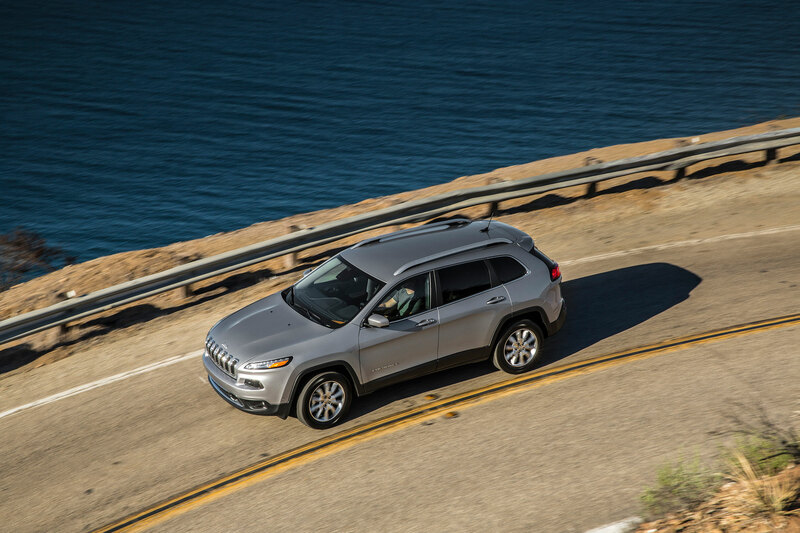 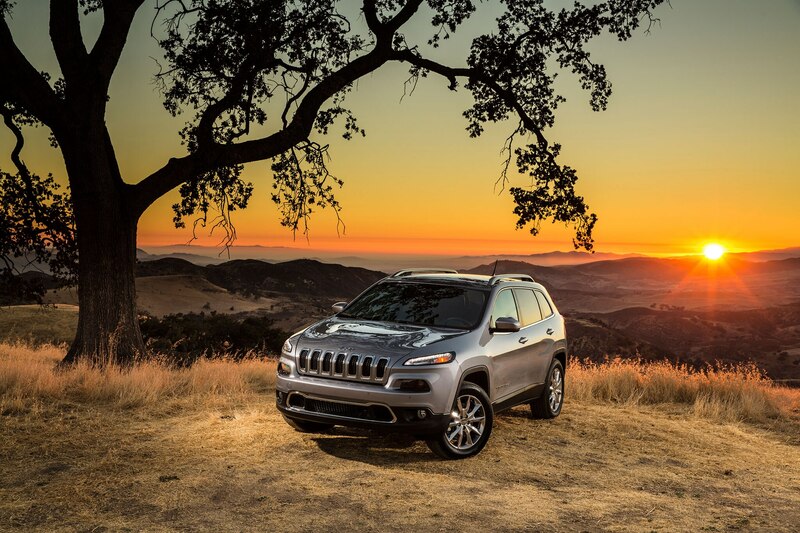 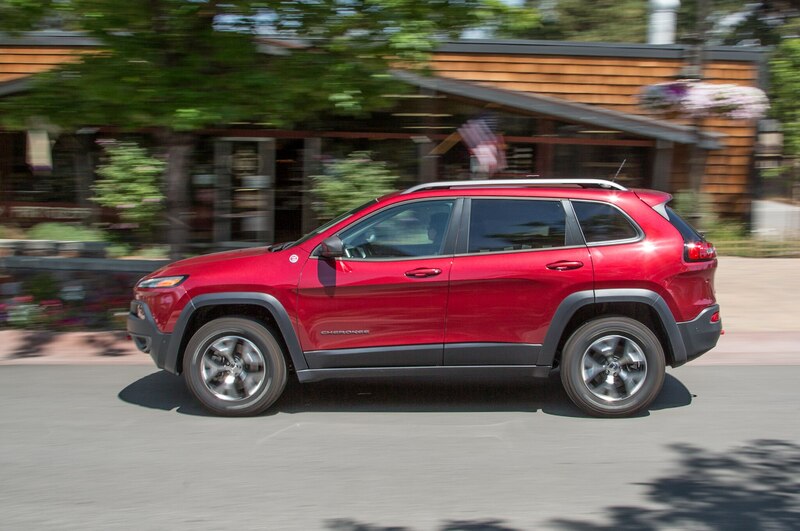 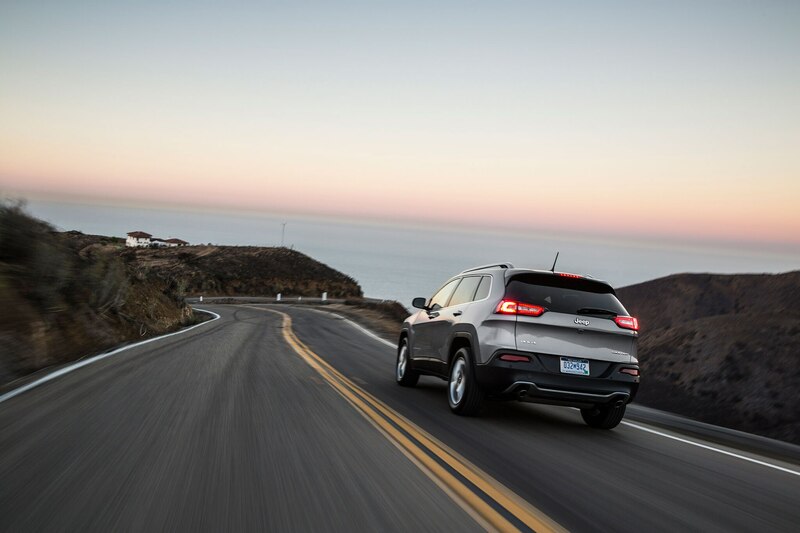 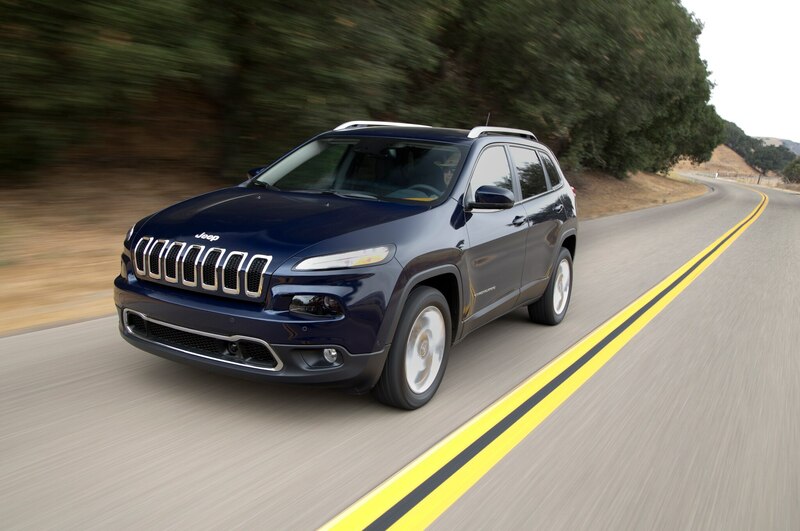 As its name suggests, the Cherokee Urbane looks to megacities like Beijing and Shanghai for its design influence. 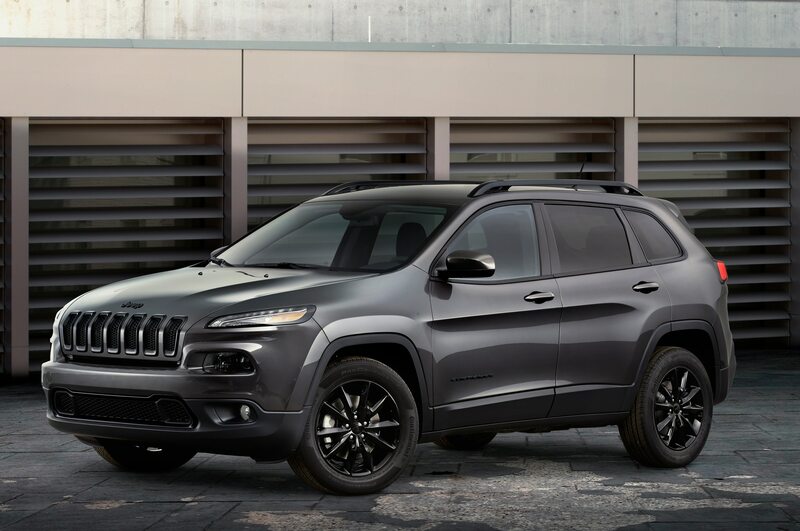 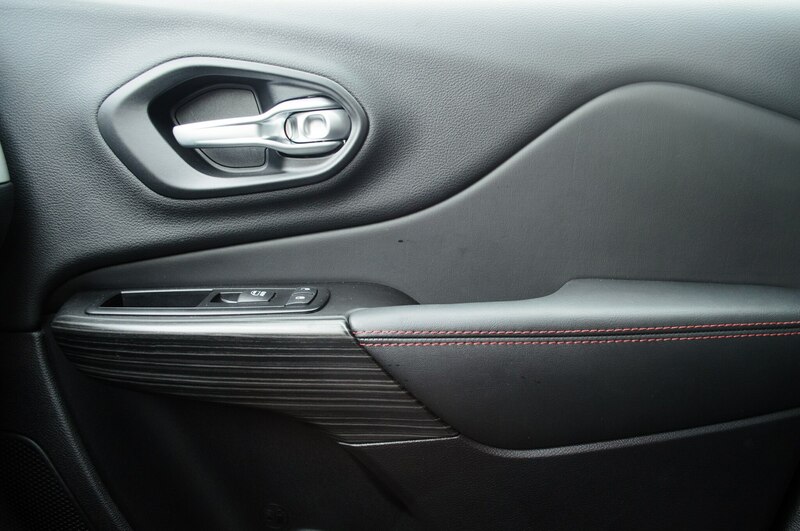 Maximum Steel metallic paint teams up with Hyper Black accents for a clean and modern look. 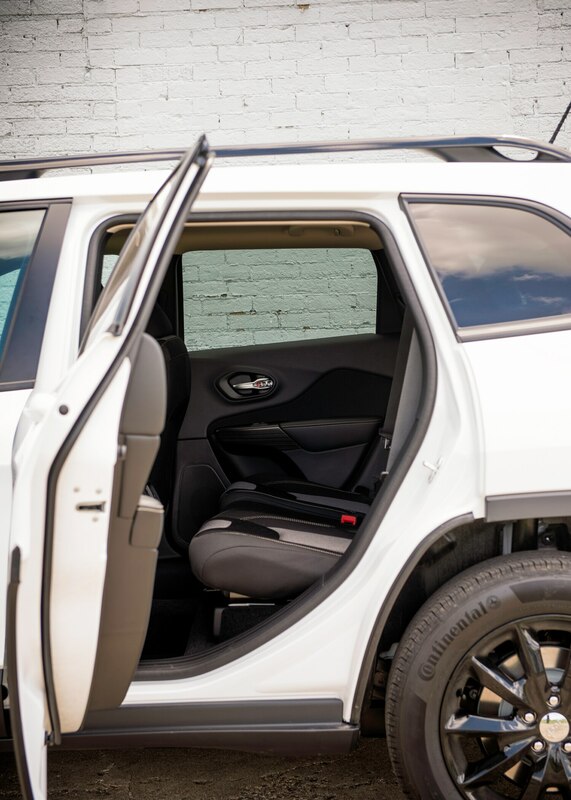 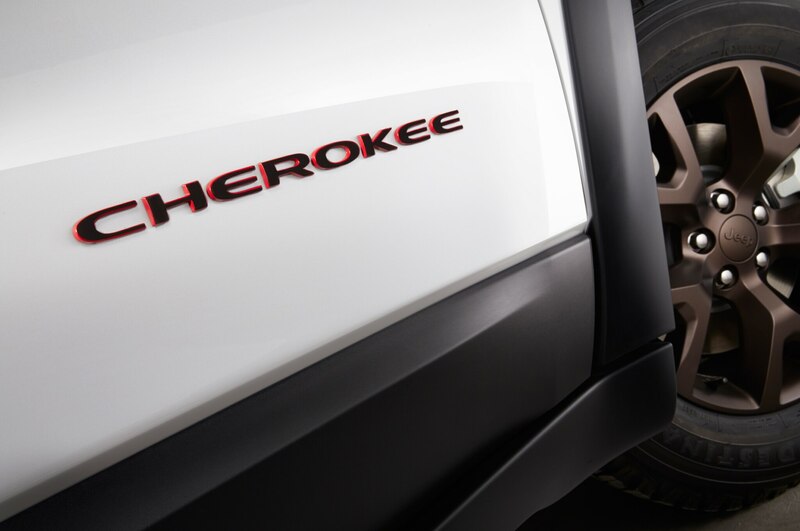 The Cherokee Urbane’s door applique trim is decorated with Chinese calligraphy brushstrokes in mind, matching the Piano Black interior. 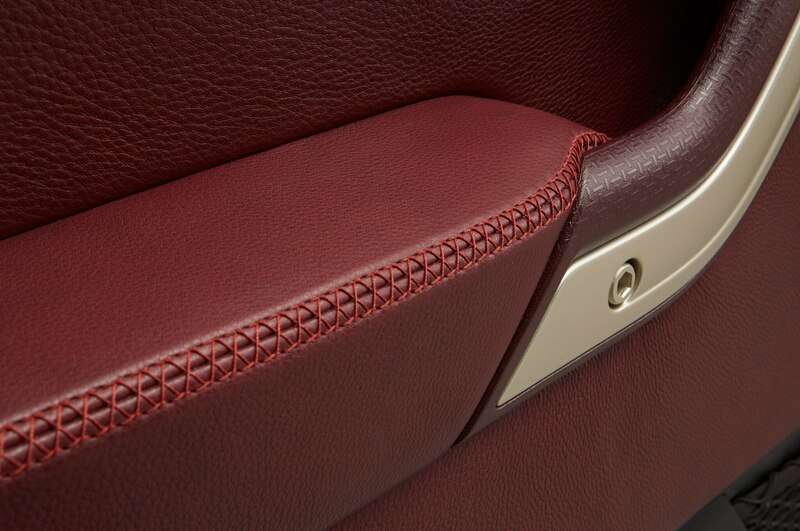 Nappa leather dark red seating surfaces match the outlines of the Urbane’s floor mats, which are styled after Chinese window traditions. 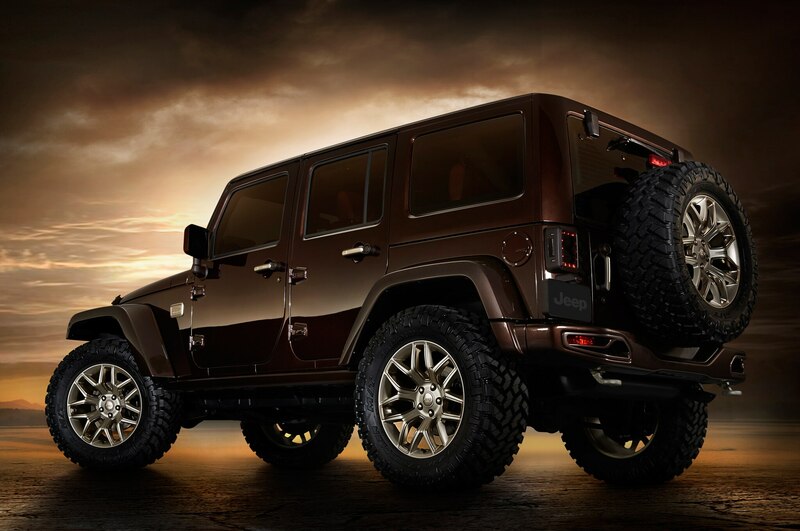 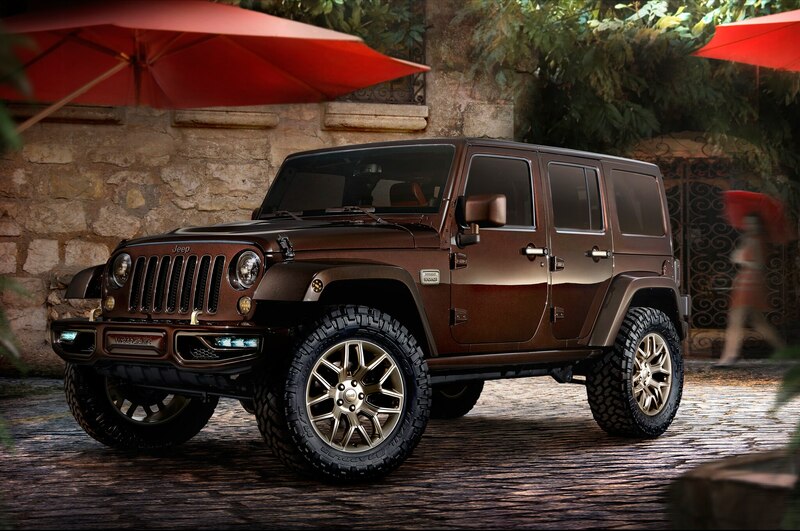 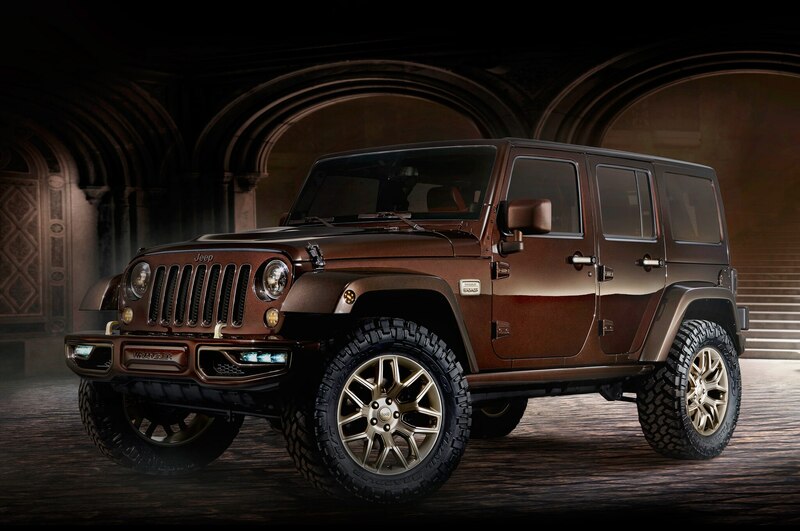 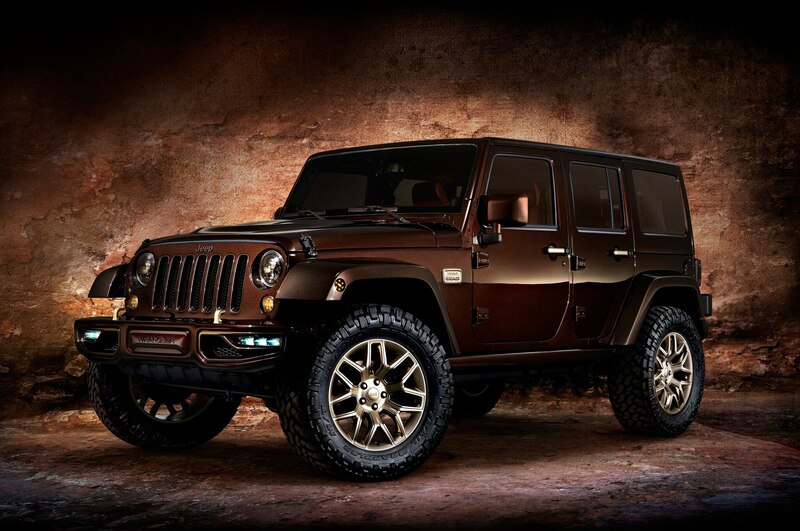 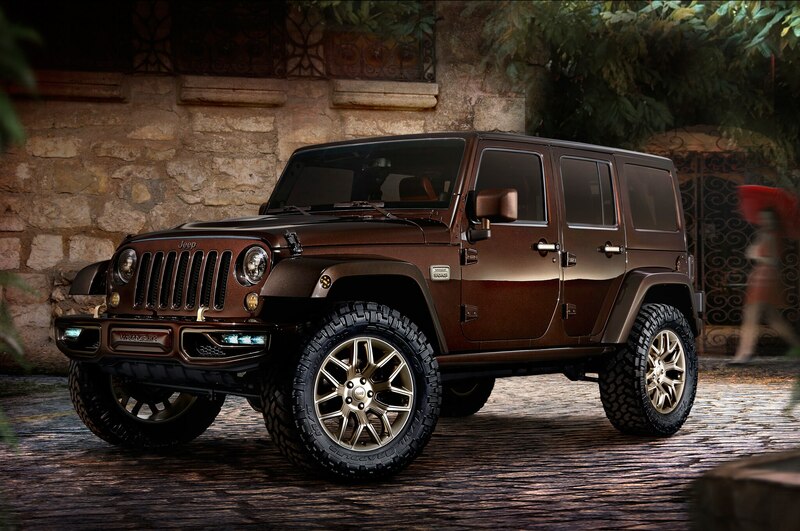 In this Sundancer concept, touches of high quality and luxurious refinement populate the trail-tested Wrangler. 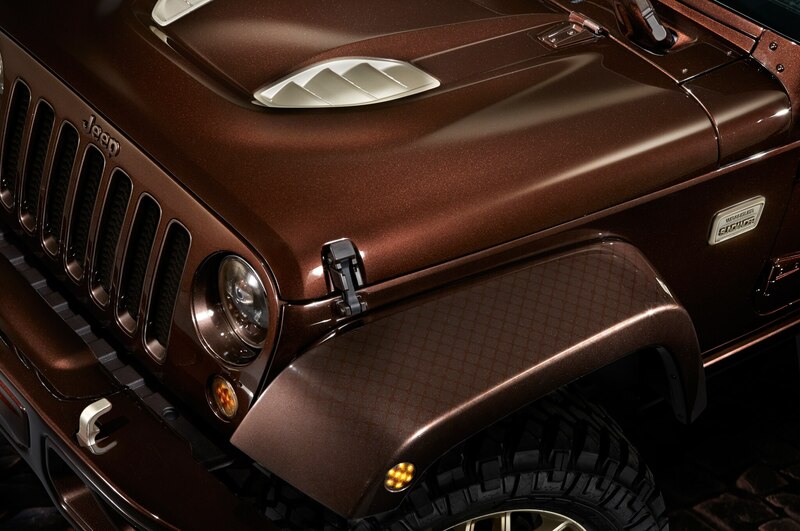 Chocolate Brown metallic paint melds smoothly with champagne-colored Billet aluminum 20-inch wheels, fender badges, and hood scoops. 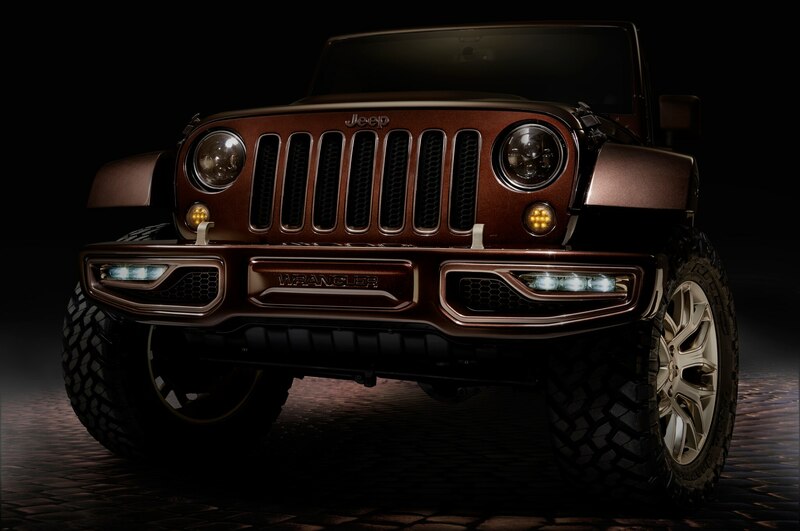 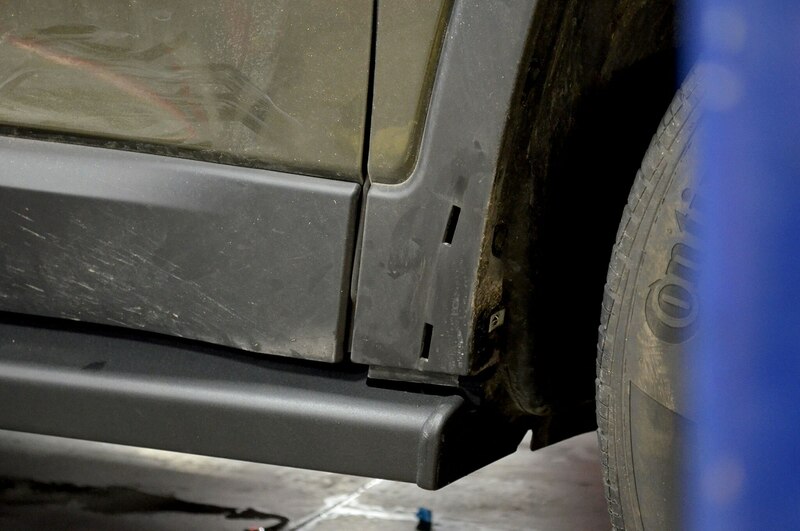 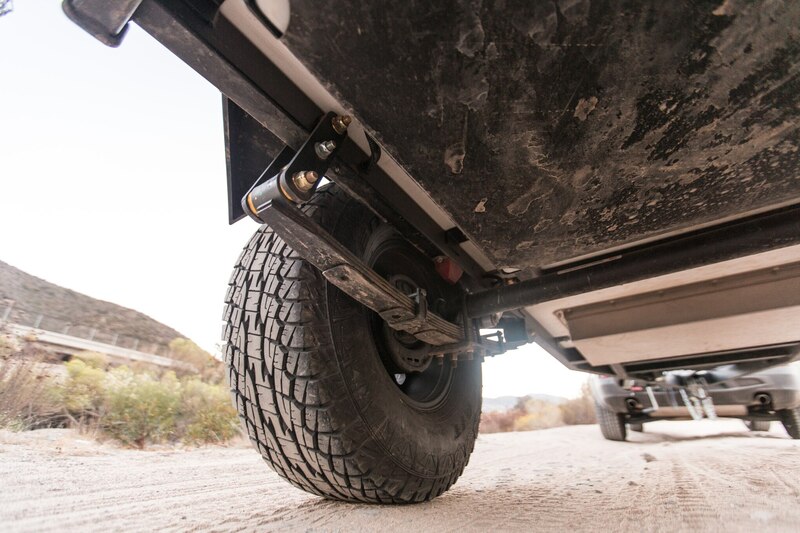 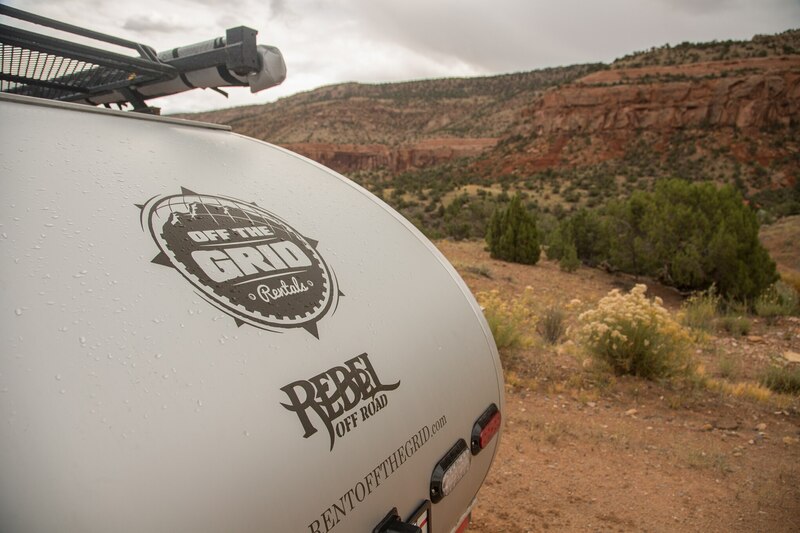 Flared fenders are made from multi-piece aluminum, flanked by unique front and rear bumpers with LED lighting. 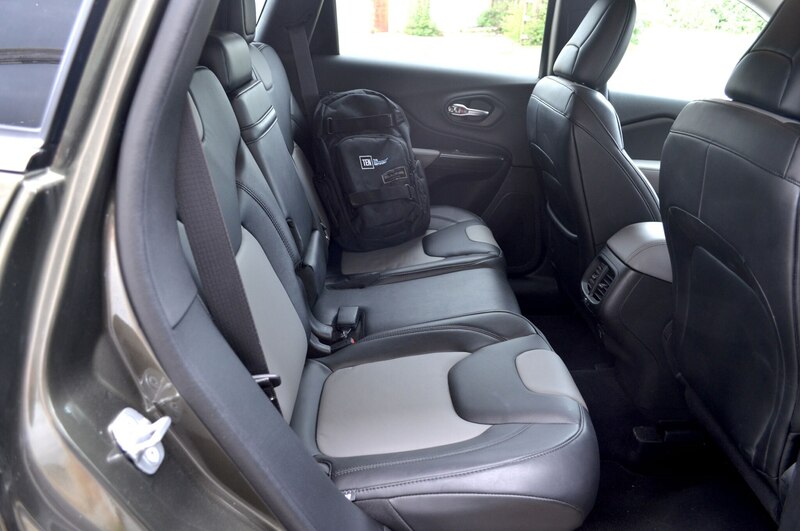 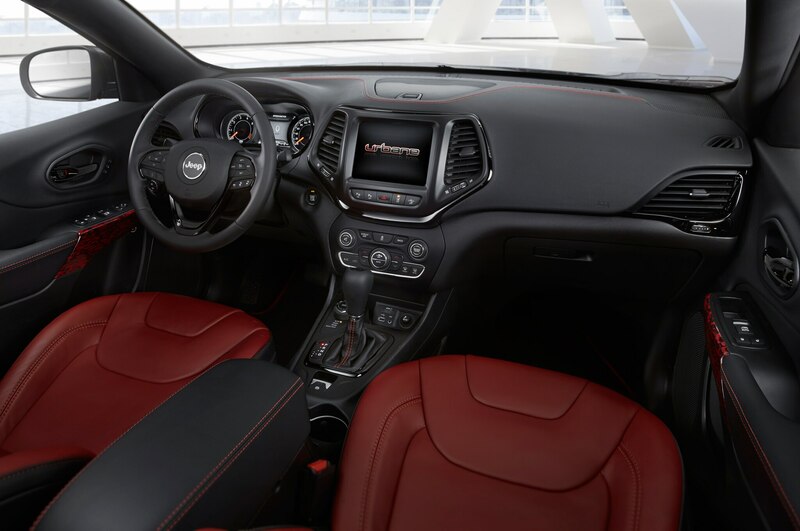 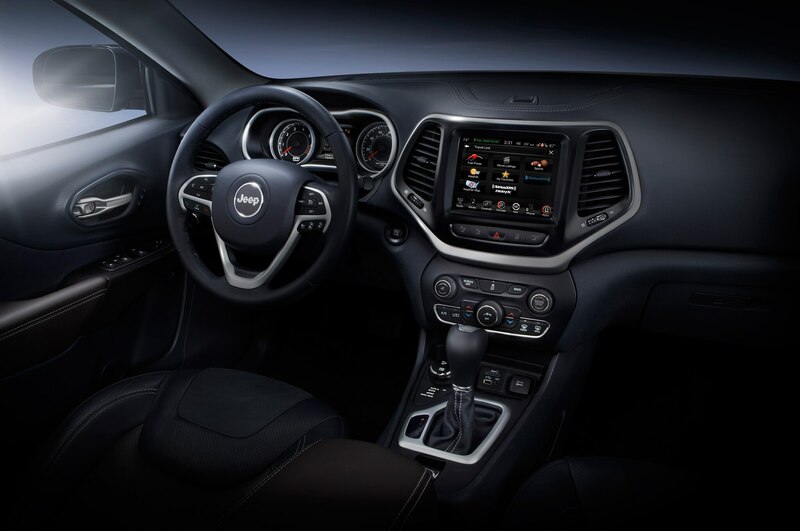 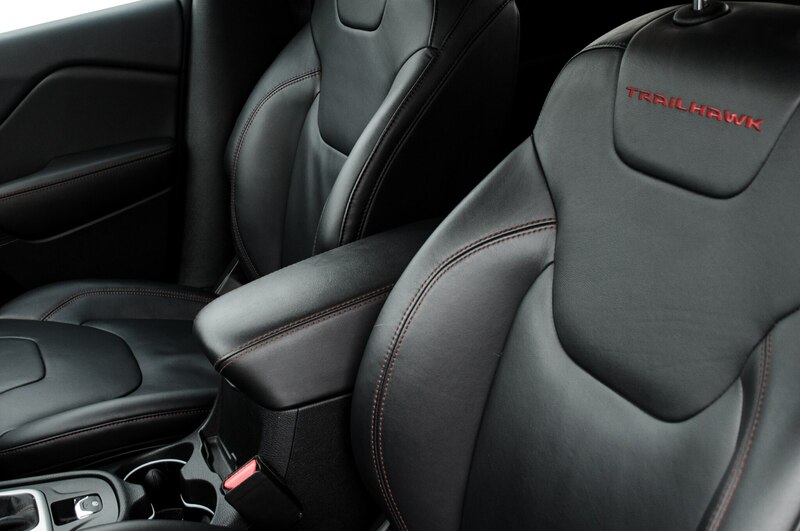 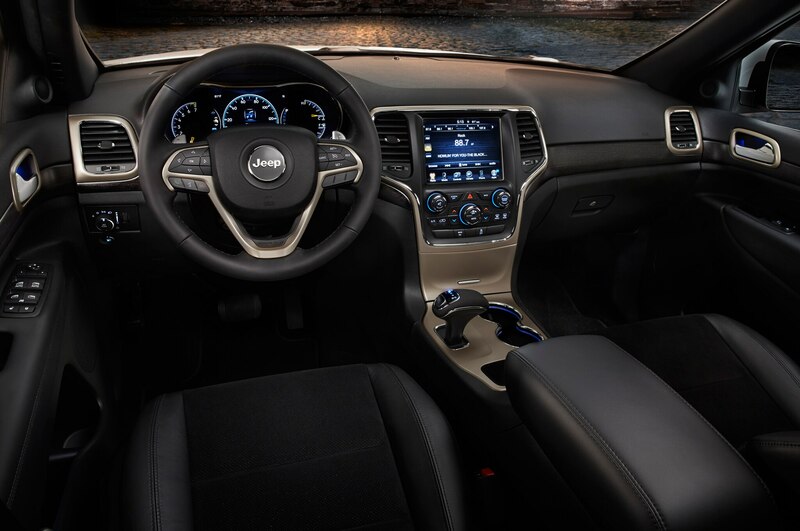 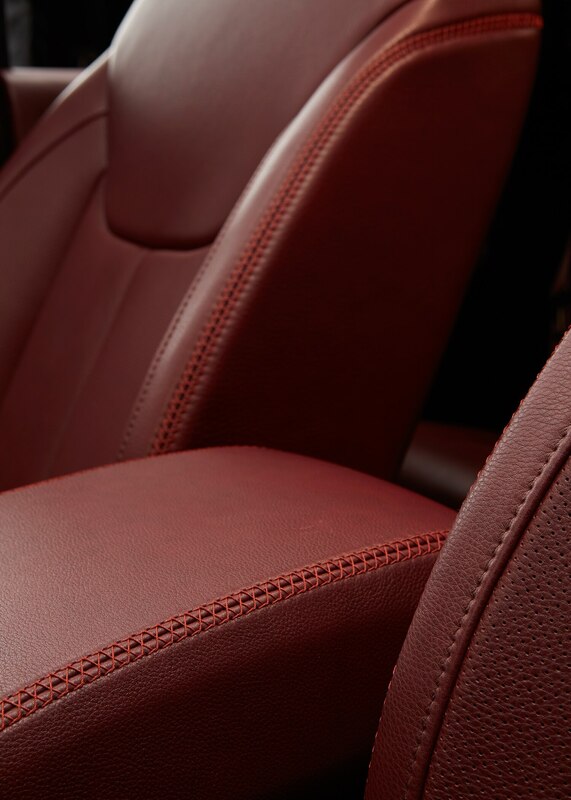 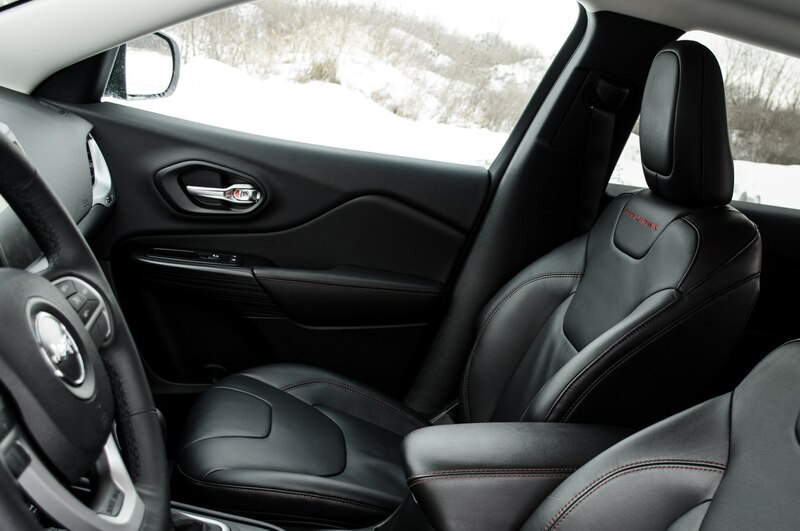 Berry Baltique Semi-Aniline leather seats add a seriously premium flavor, which is enhanced by premium leather trim with hand-sewn stitching. 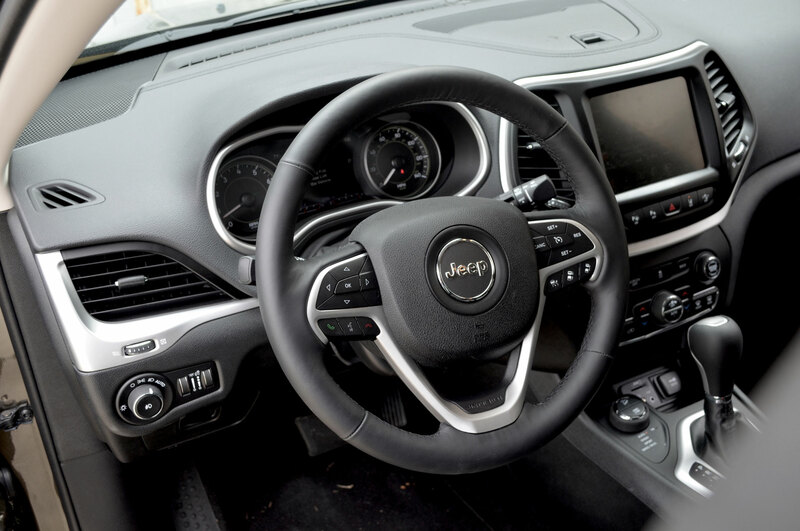 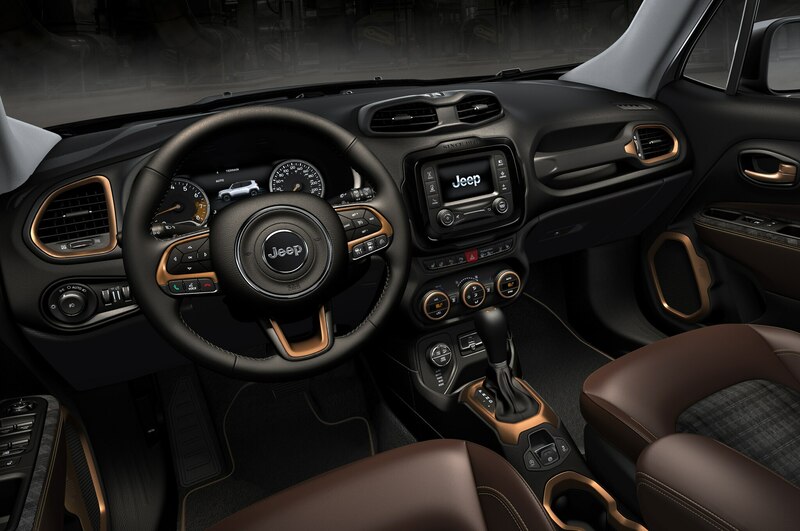 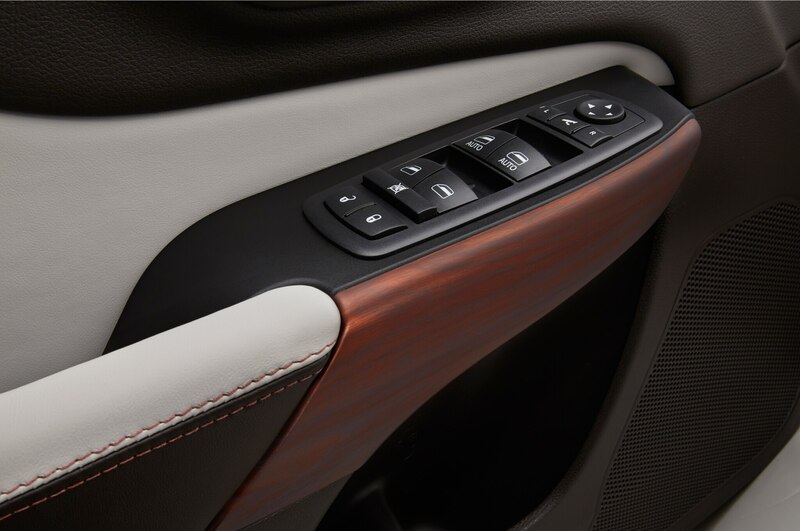 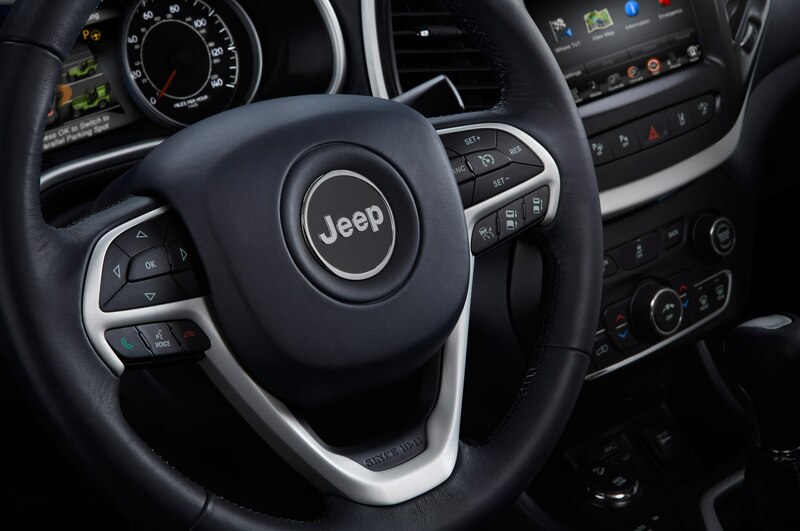 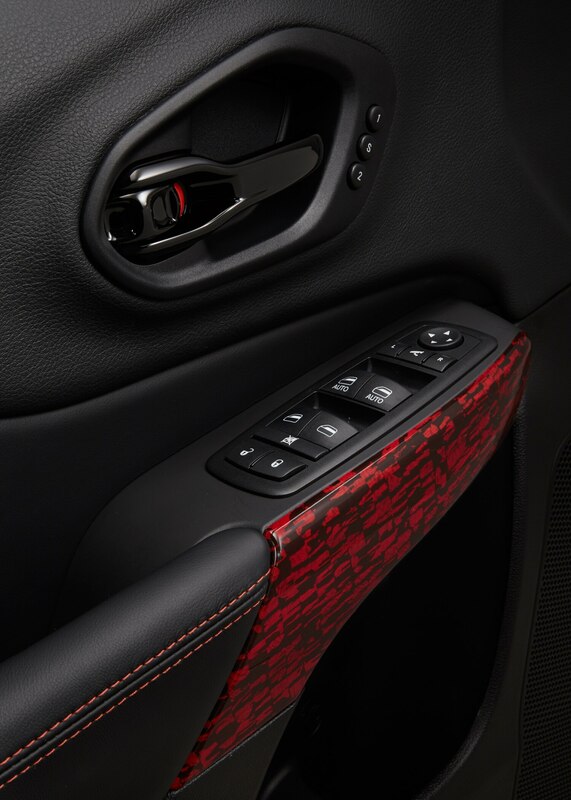 Gold trim continues the sophisticated theme from the Wrangler’s exterior, adorning the steering wheel, door handles, shift knob, grab handle, and sill plates. 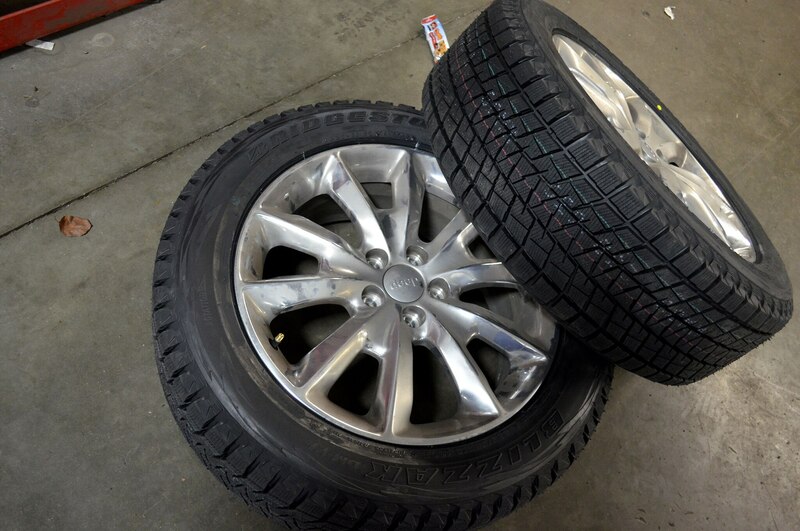 30 / 55 cu. 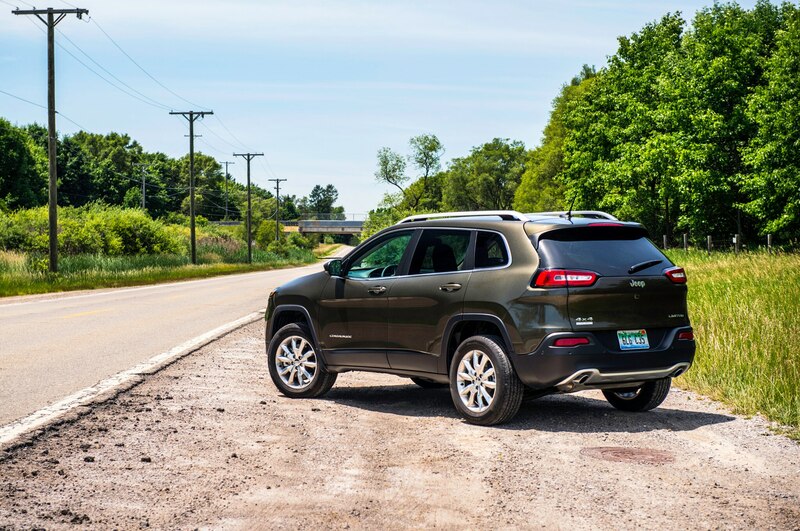 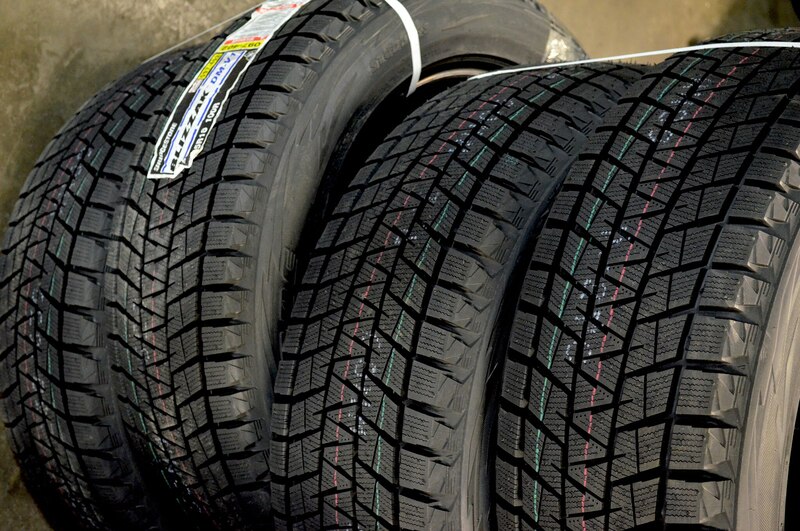 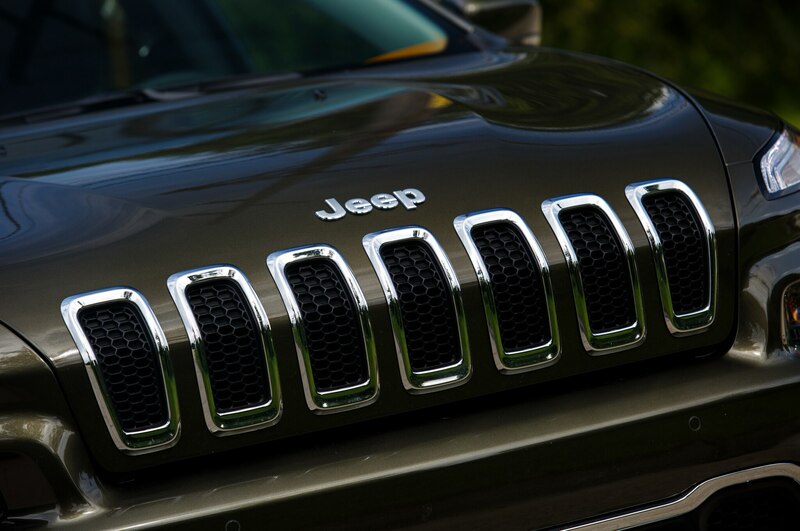 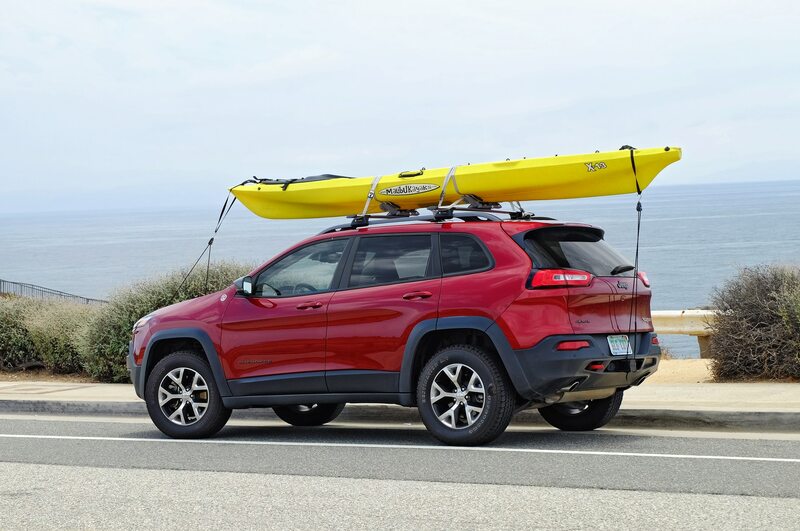 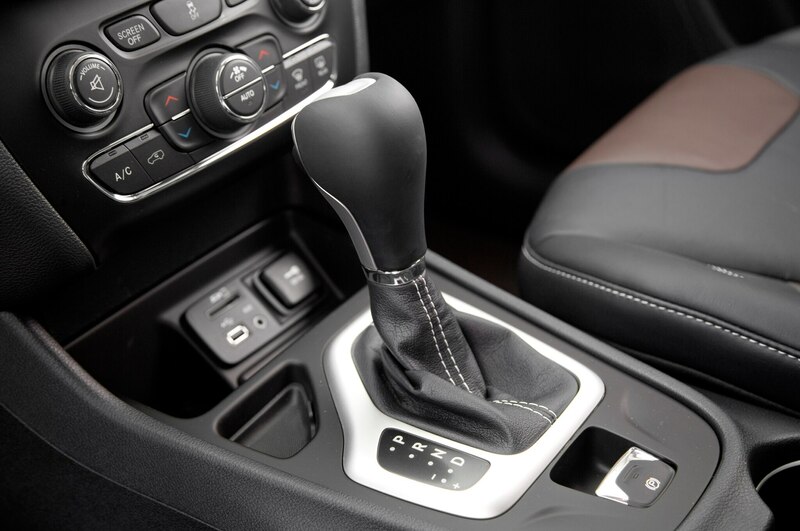 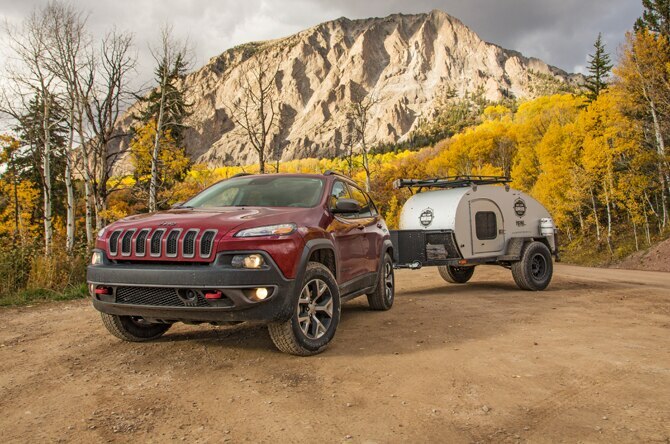 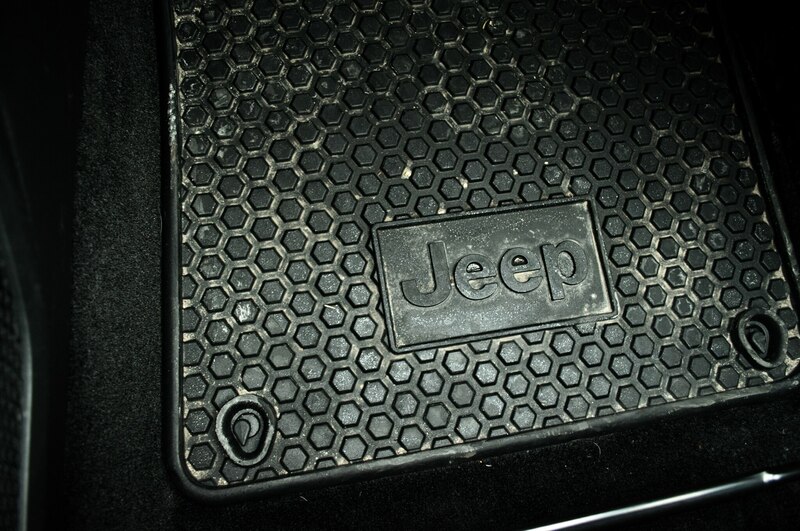 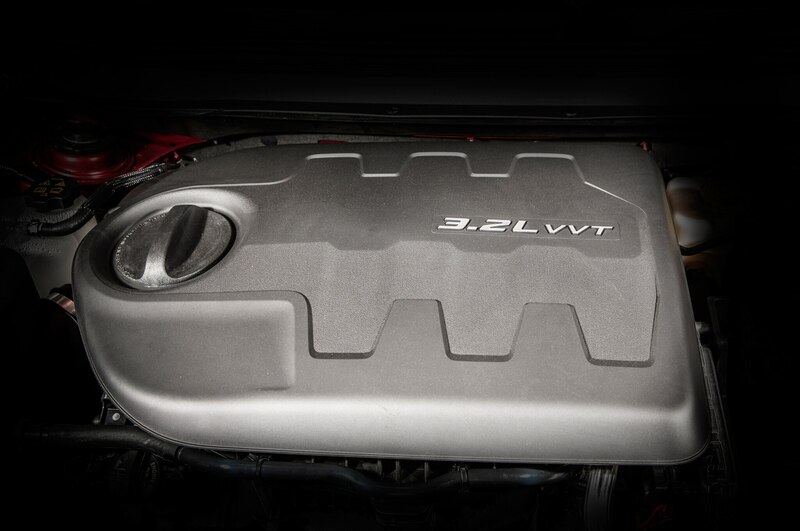 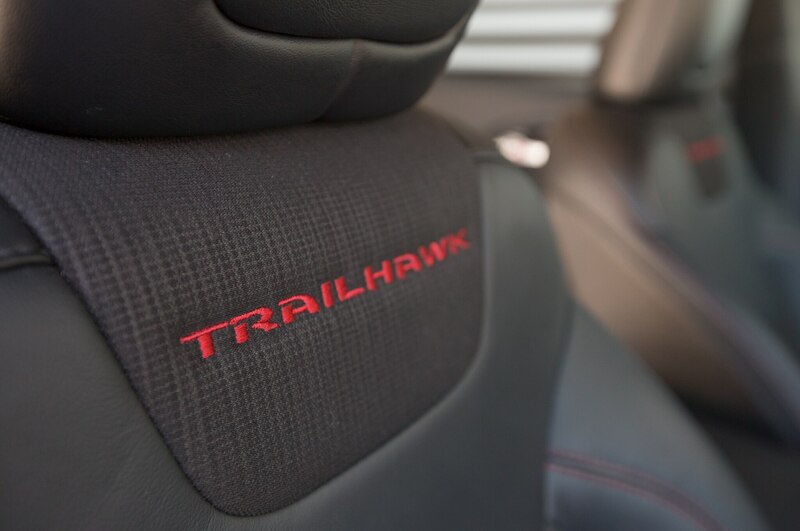 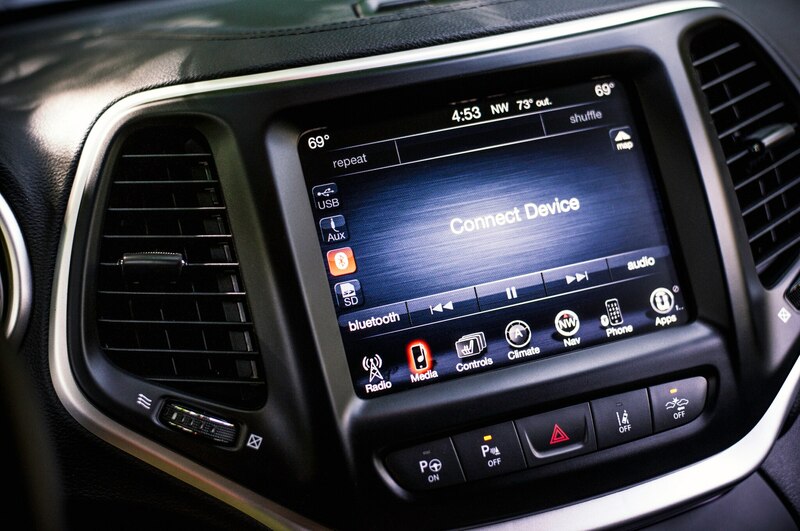 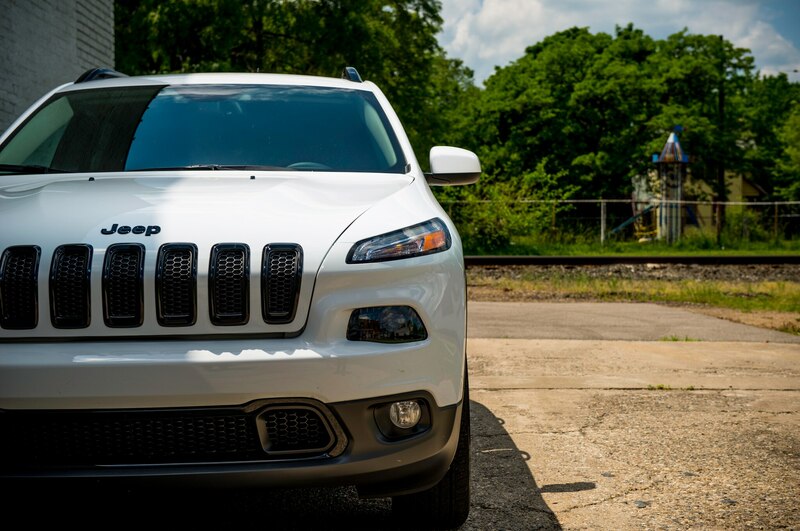 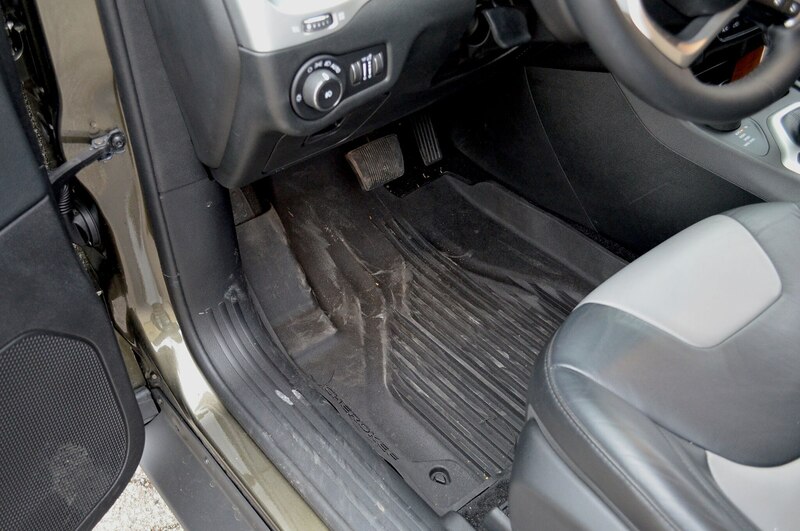 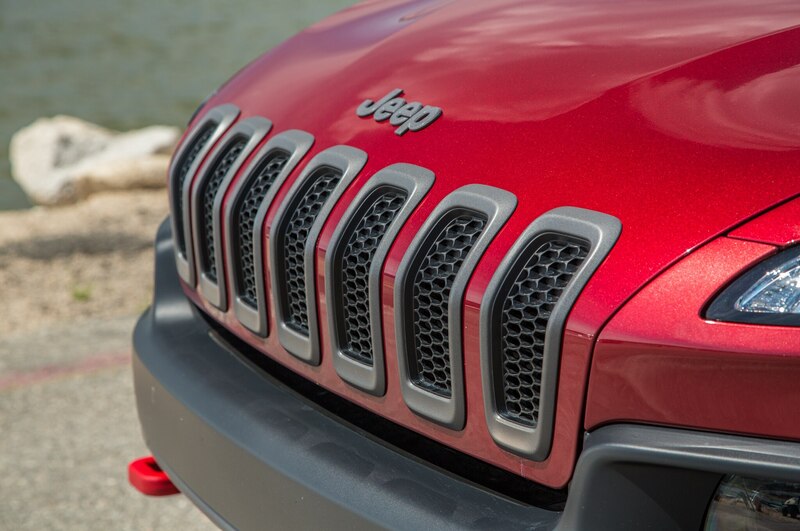 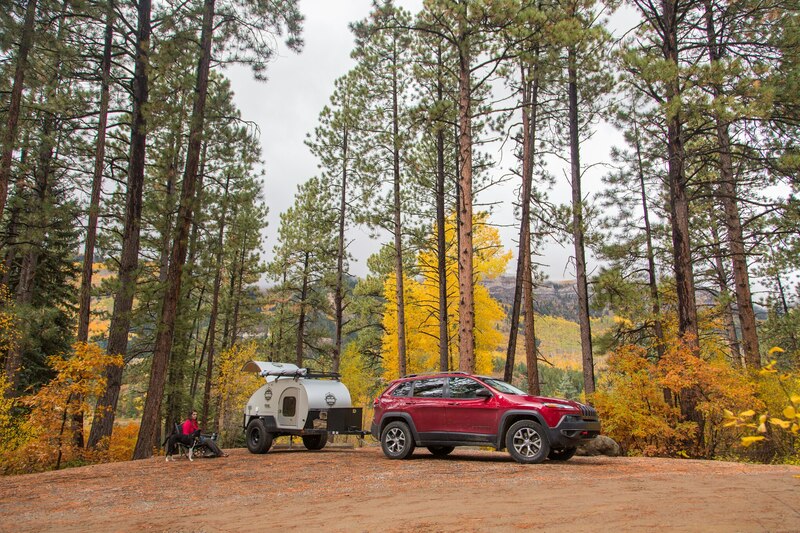 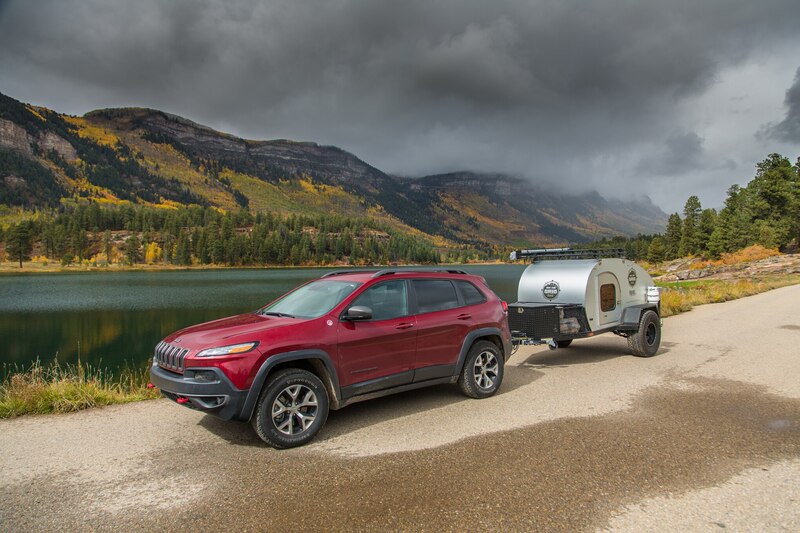 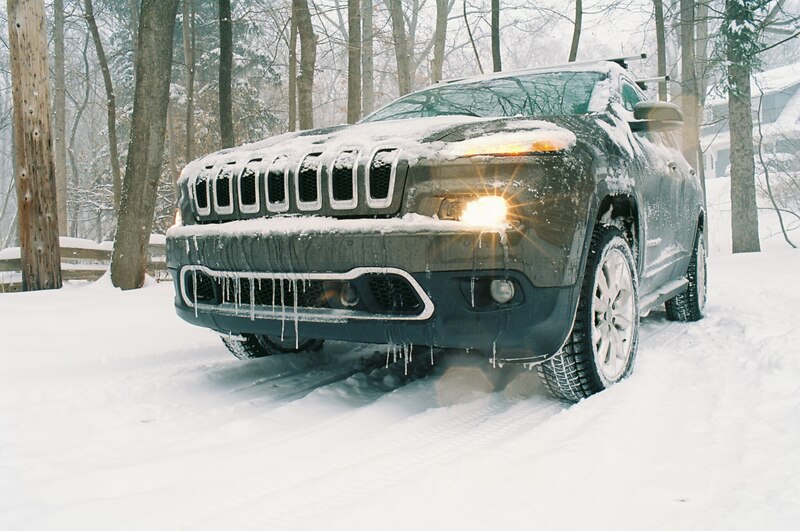 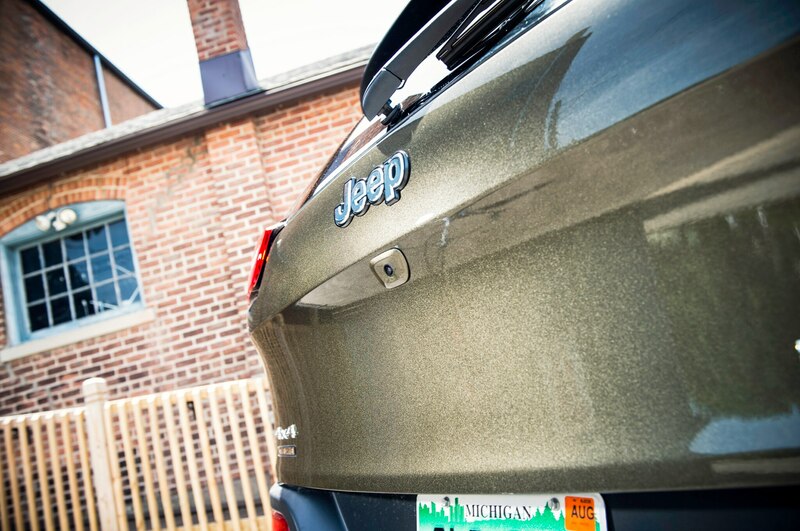 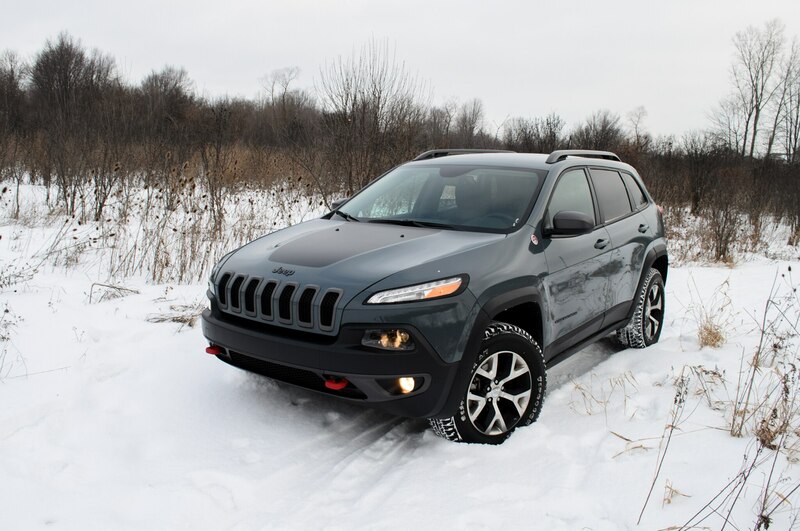 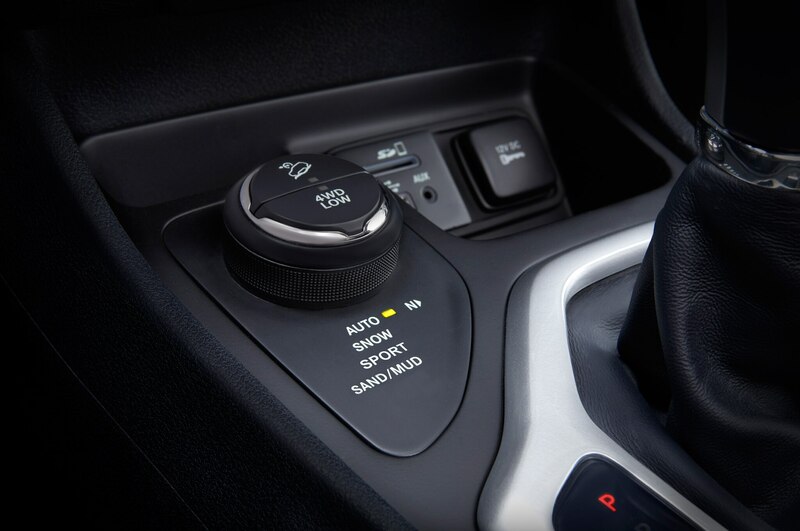 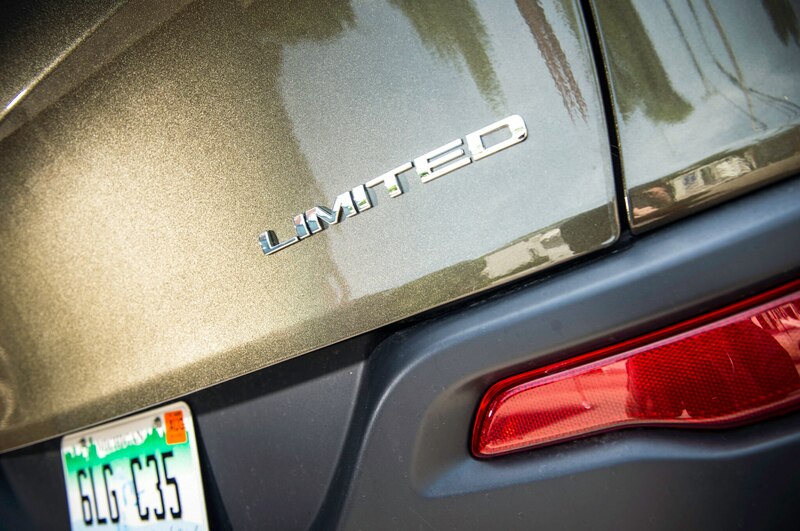 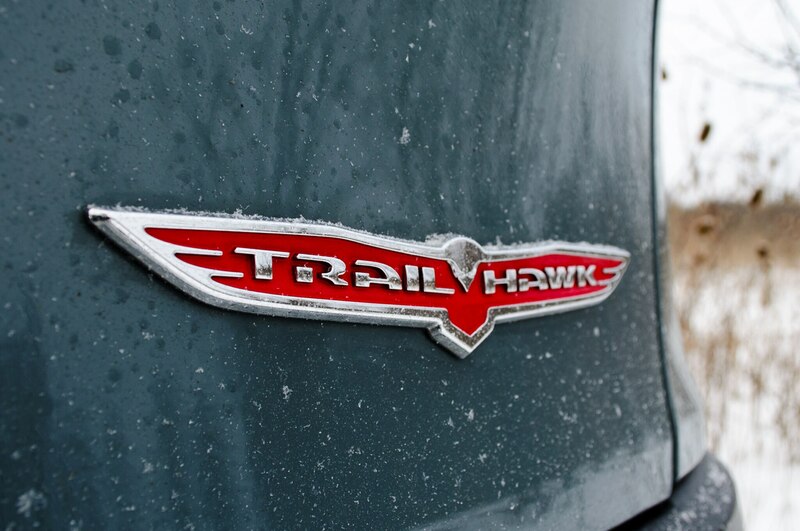 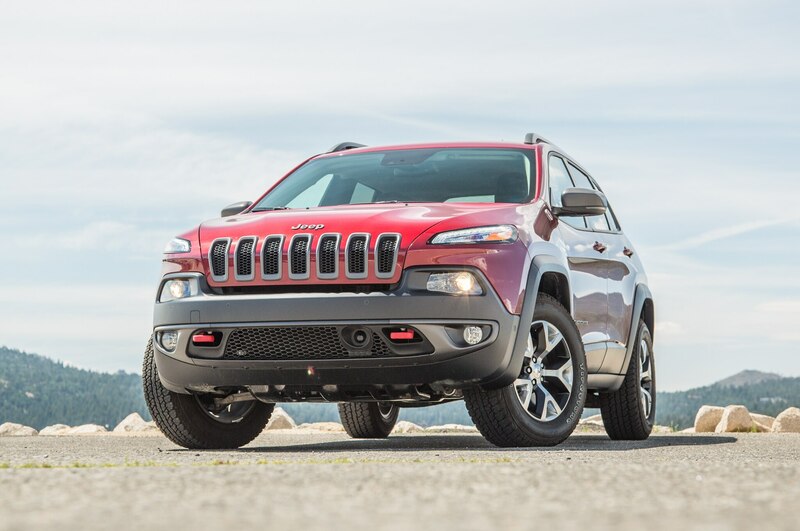 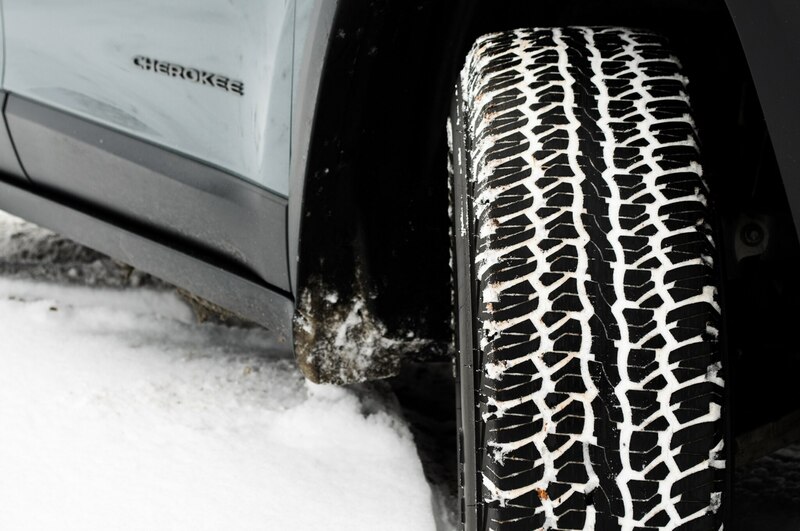 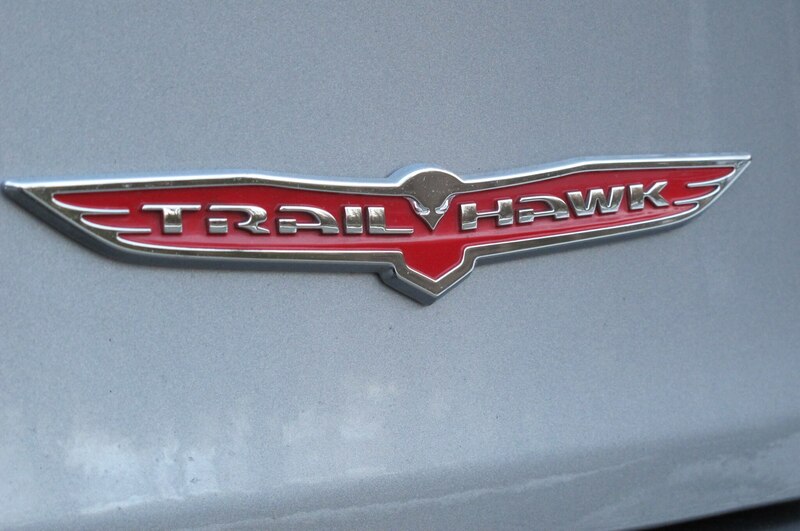 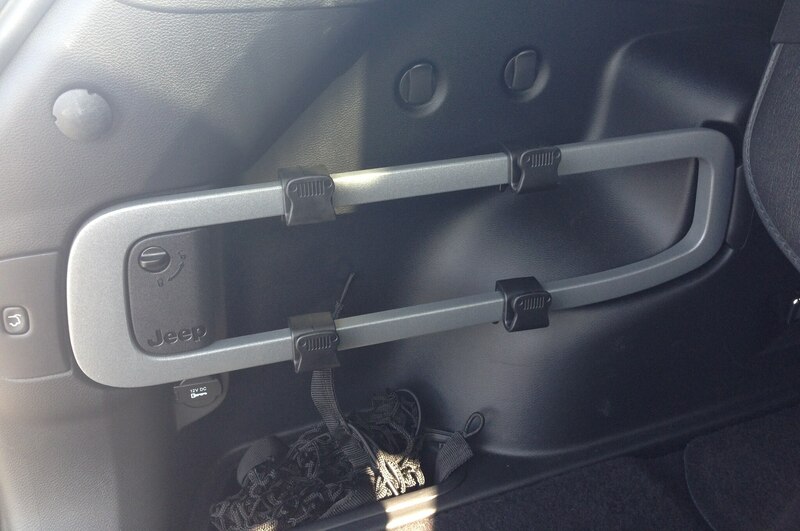 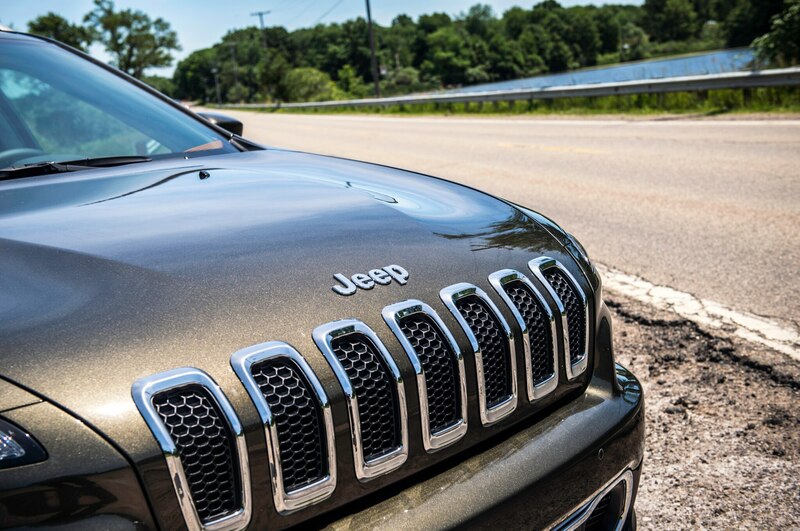 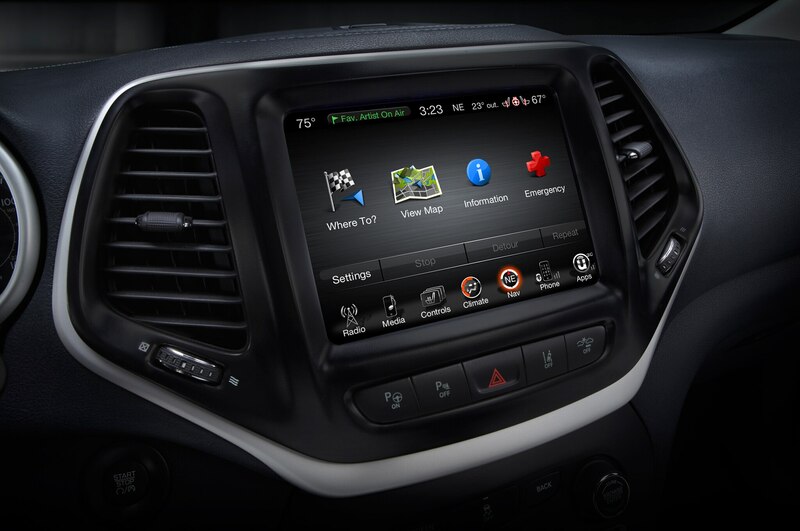 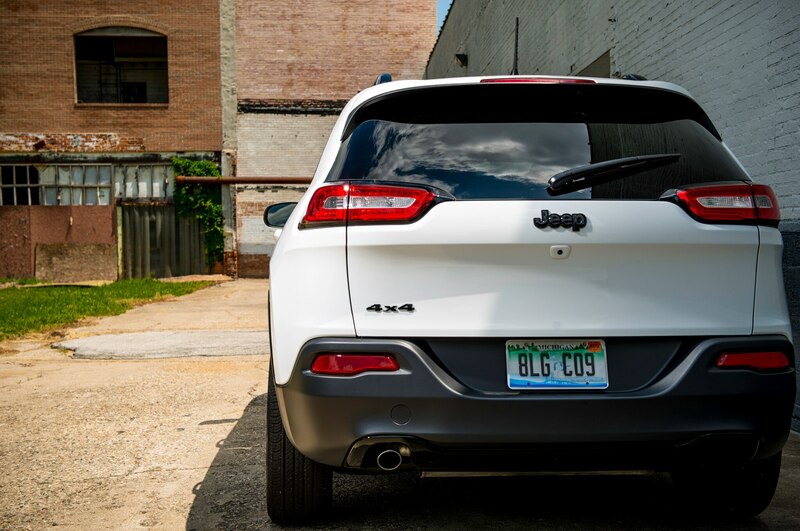 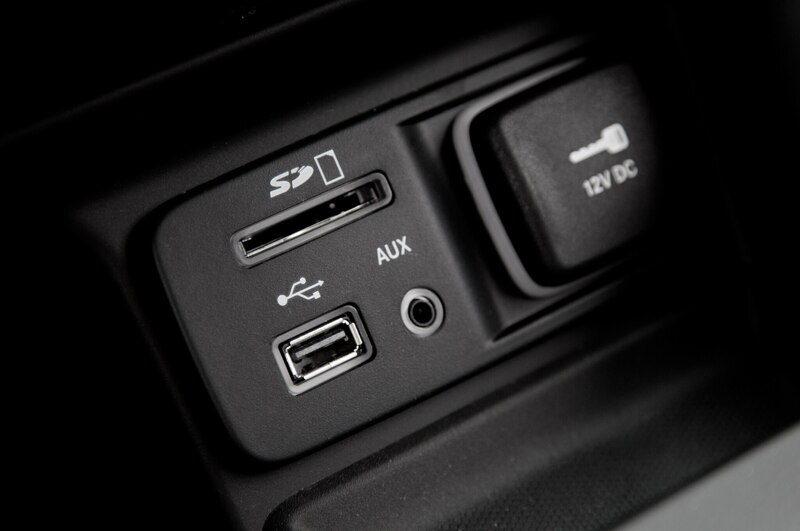 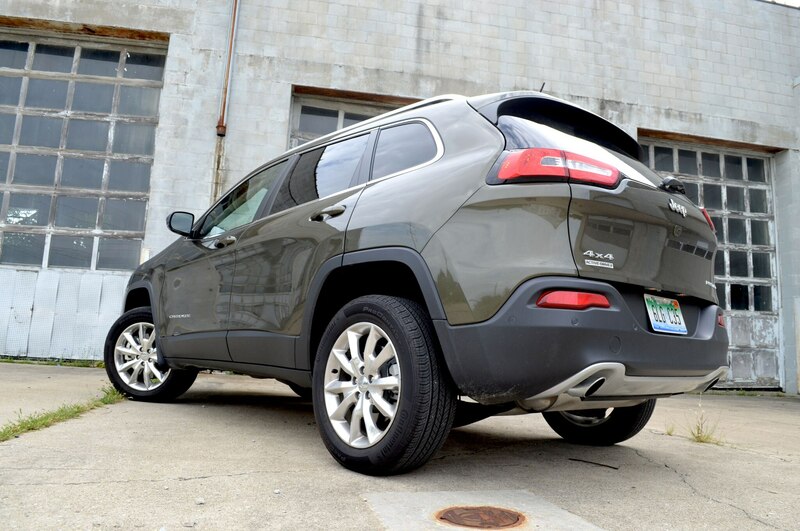 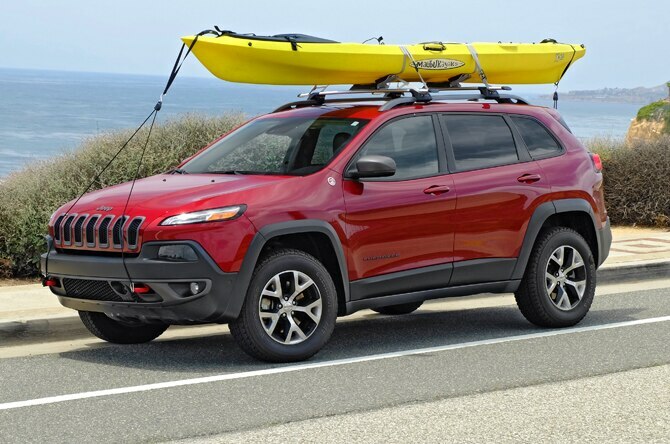 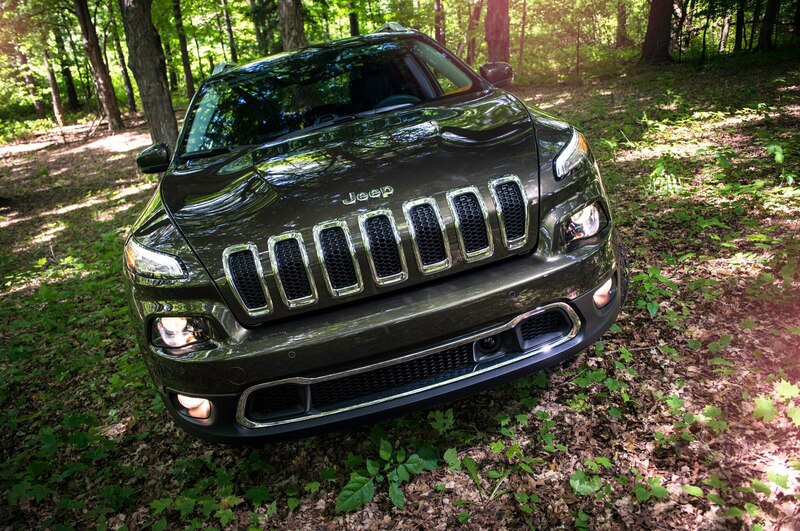 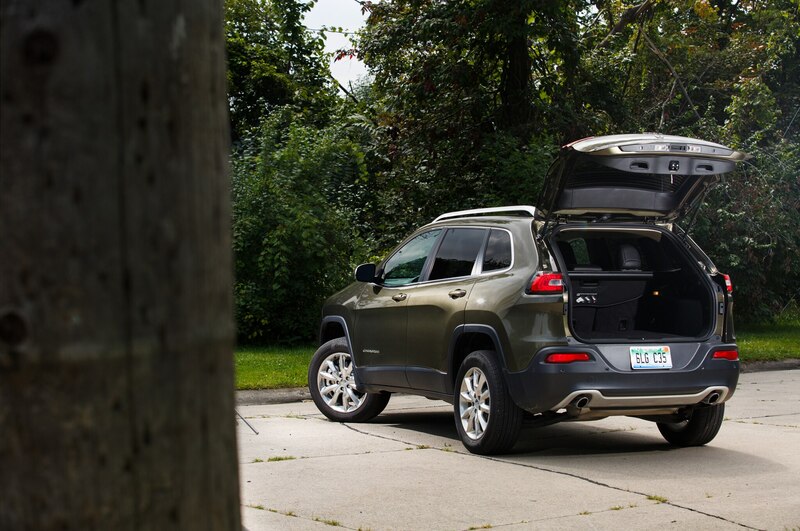 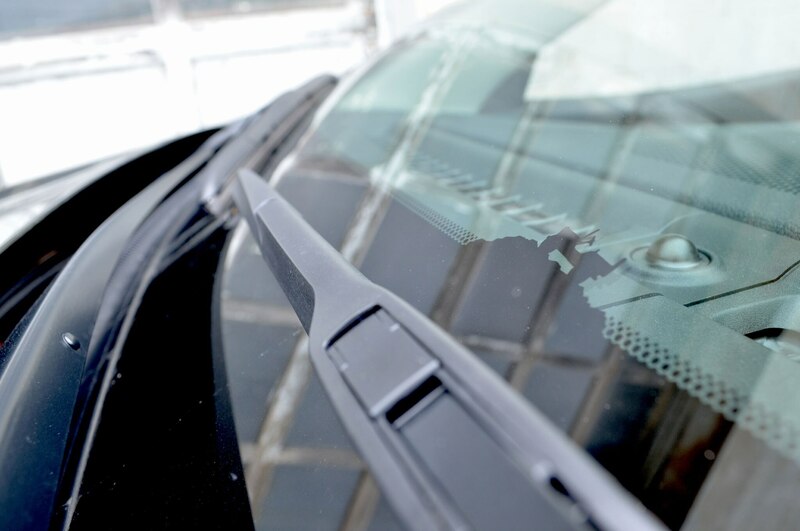 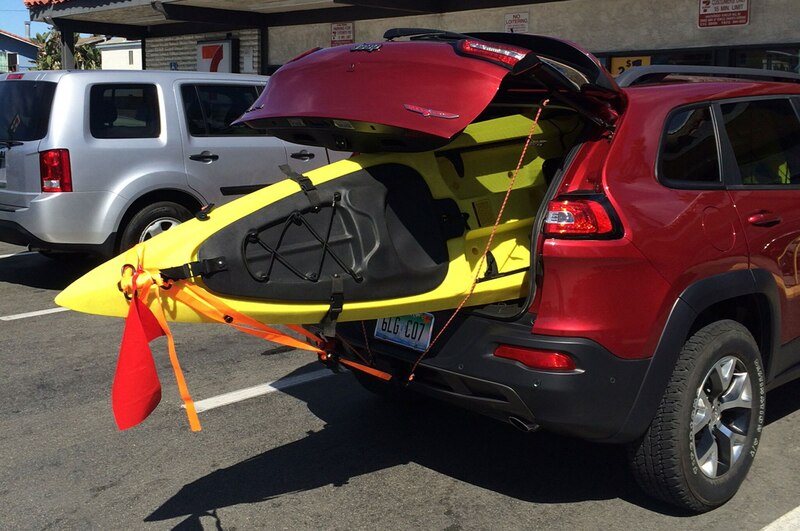 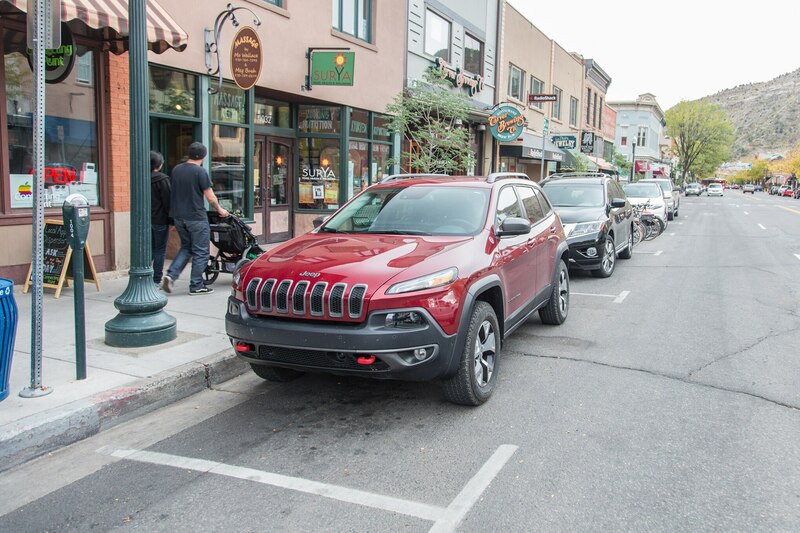 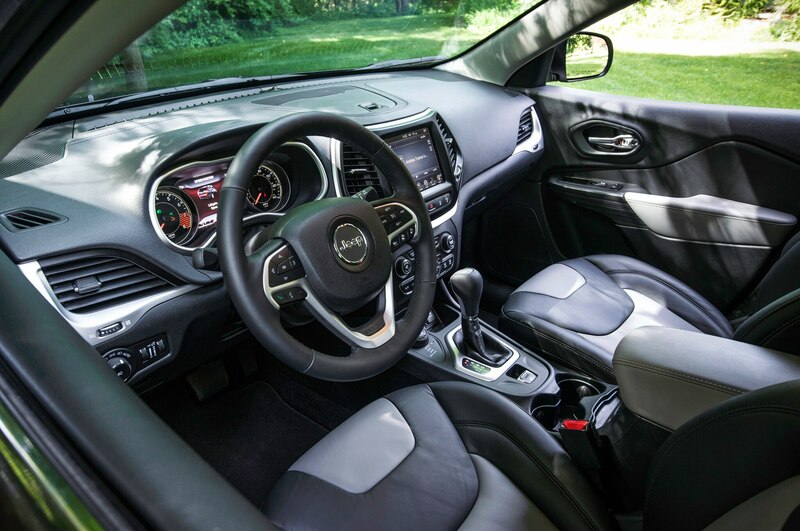 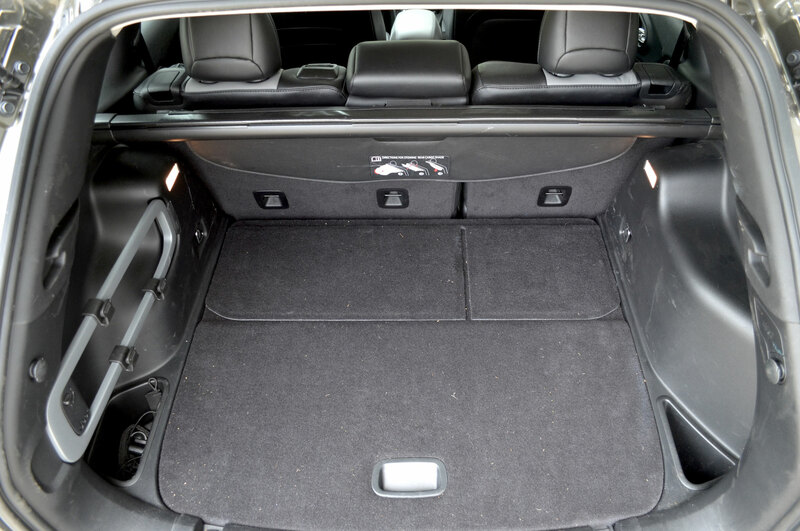 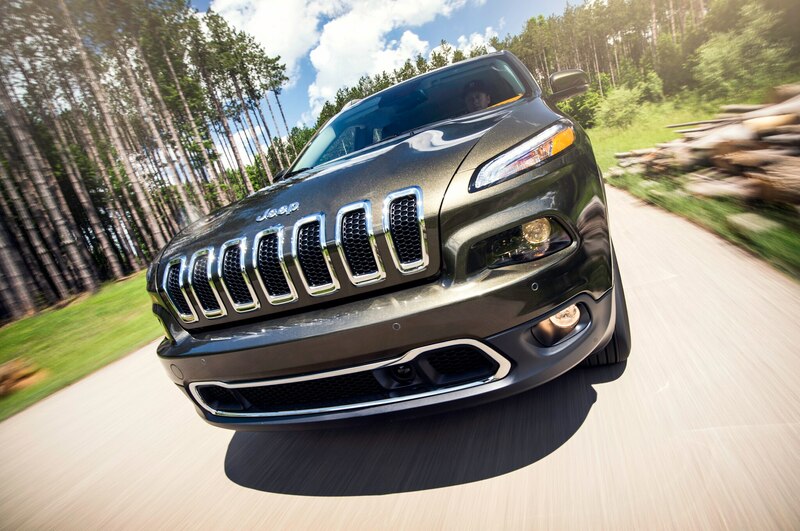 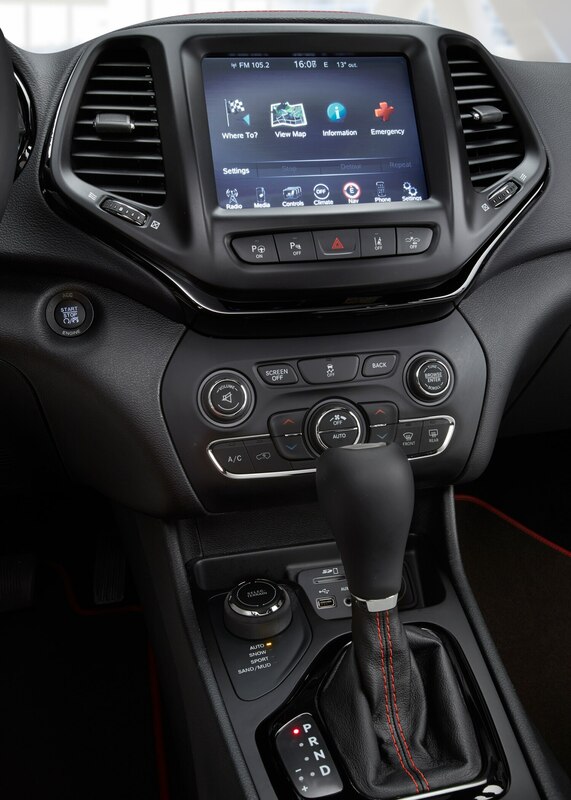 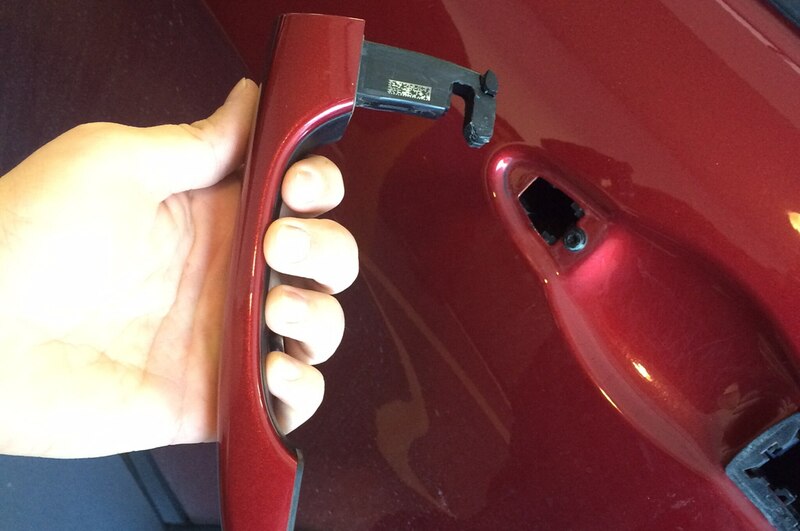 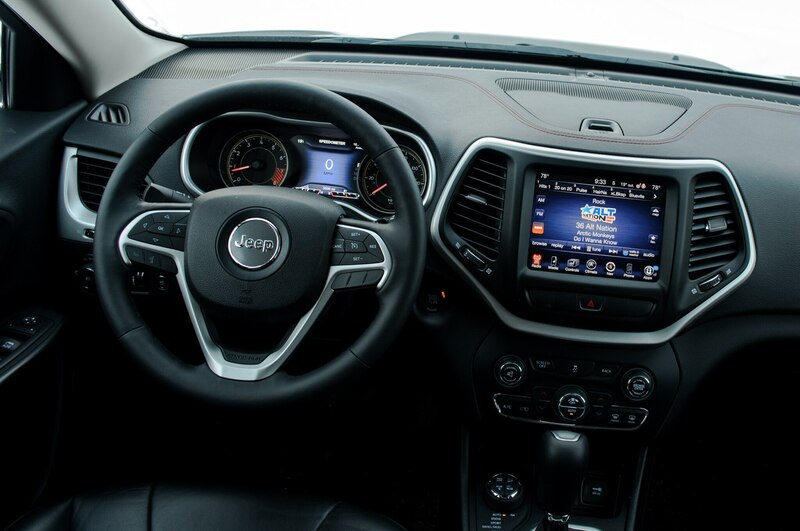 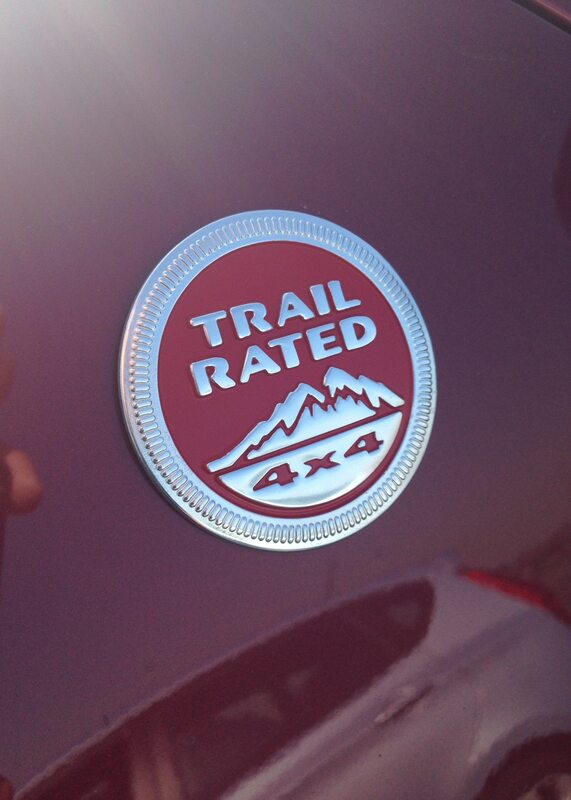 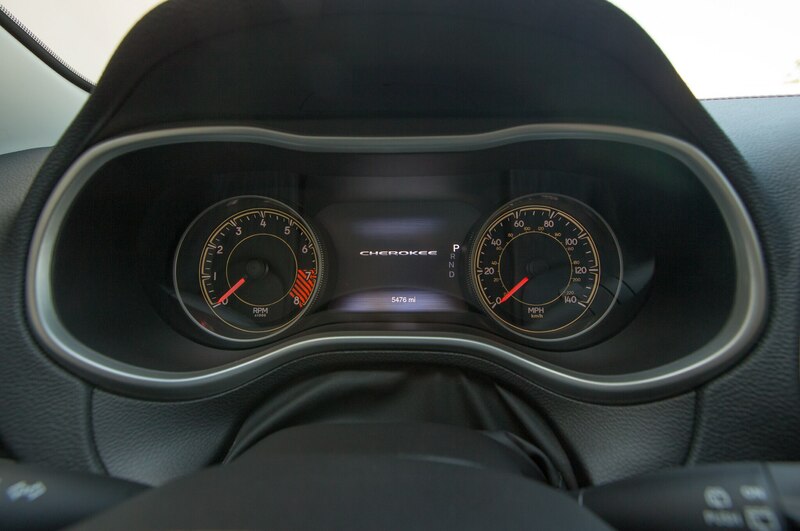 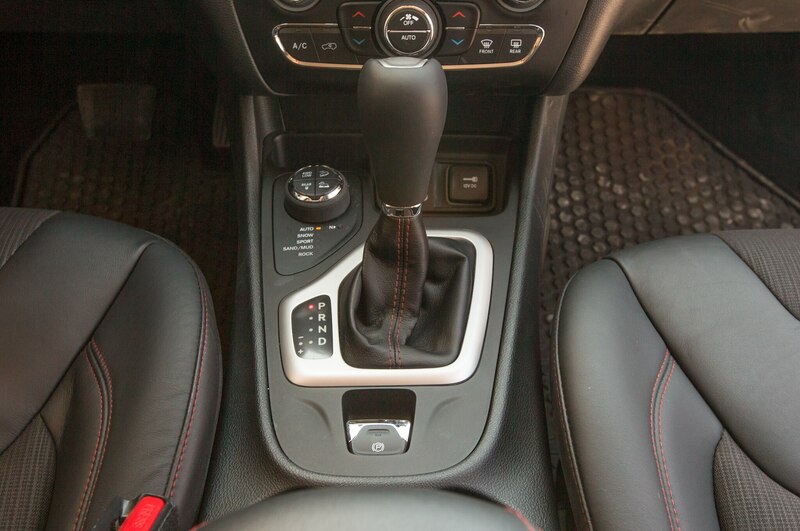 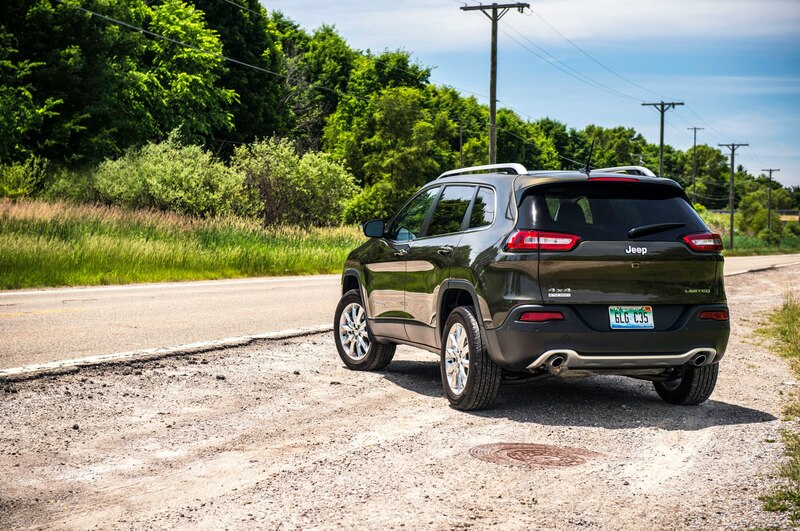 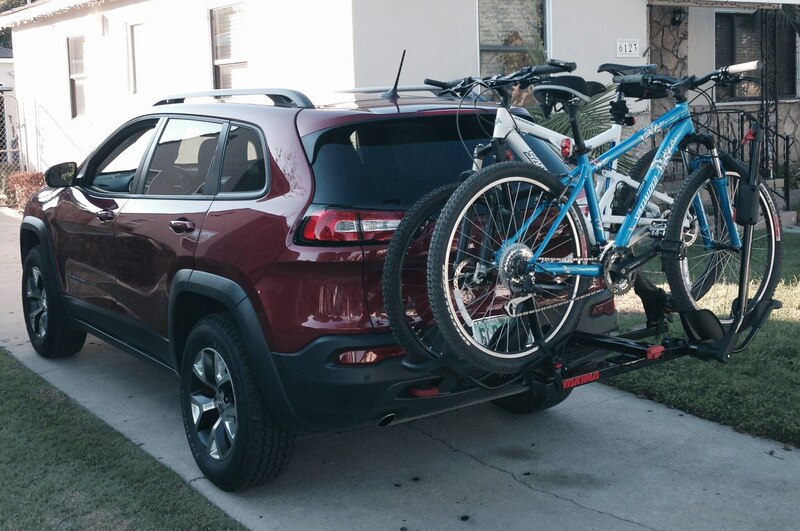 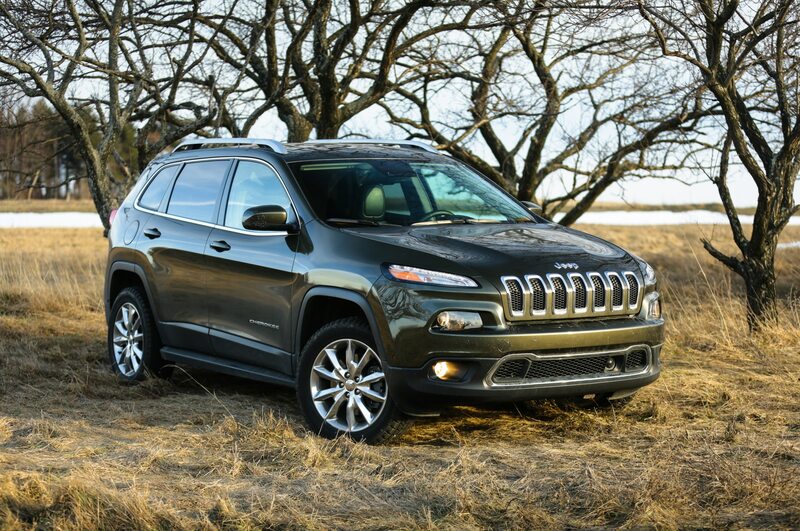 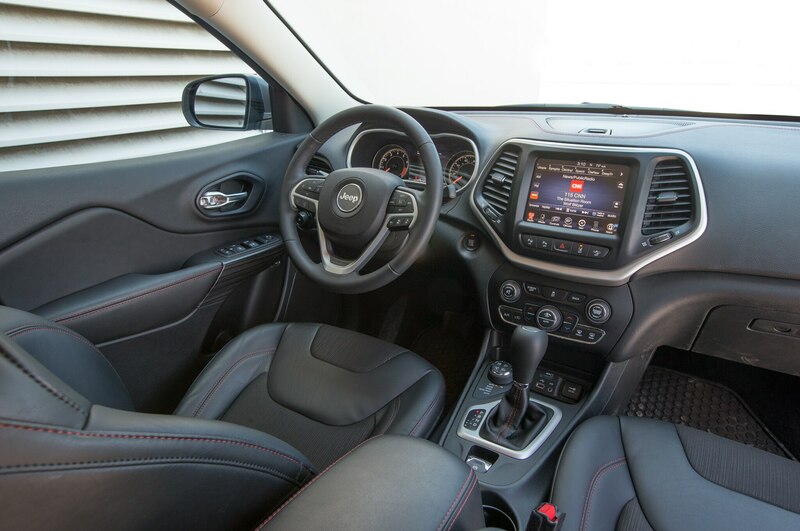 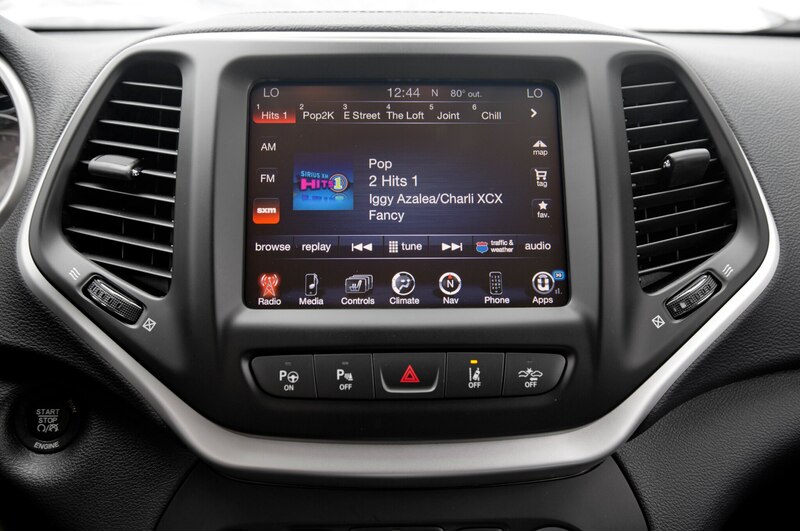 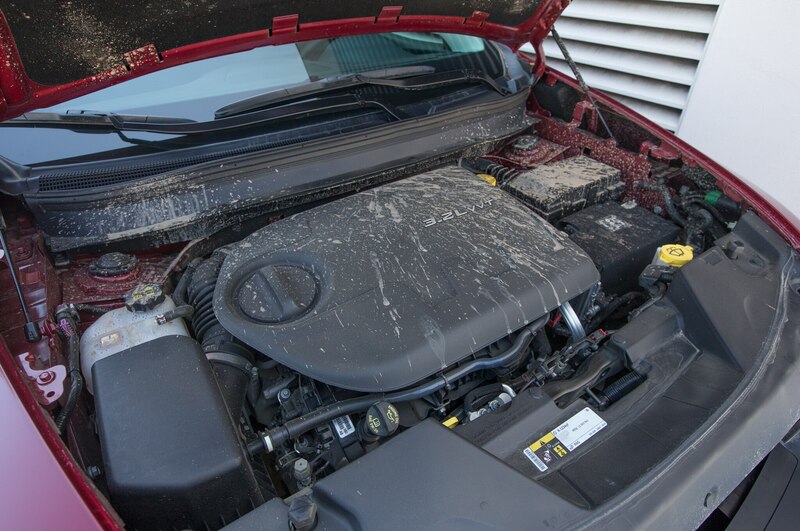 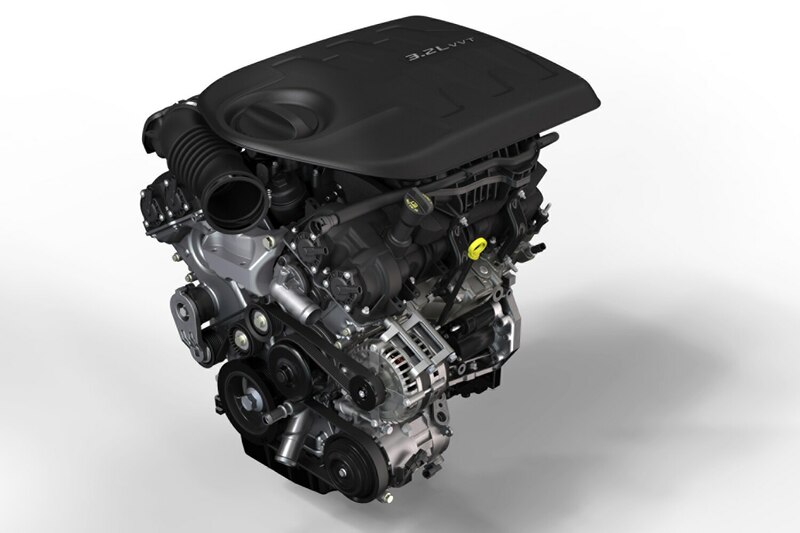 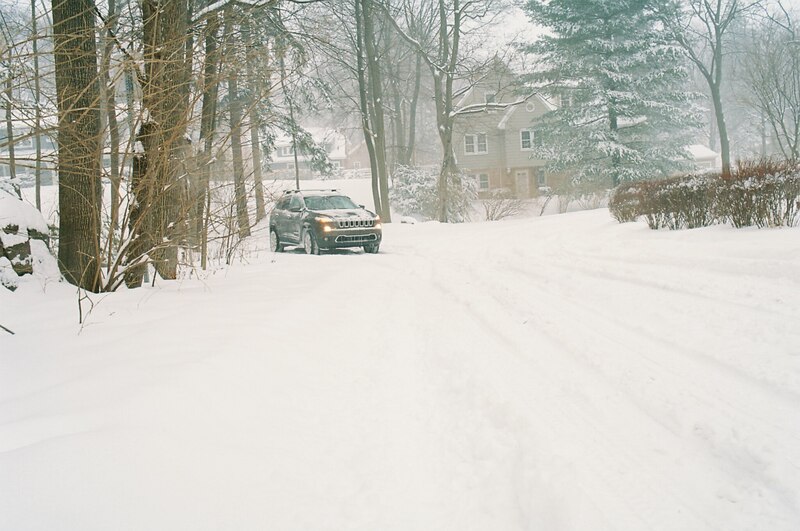 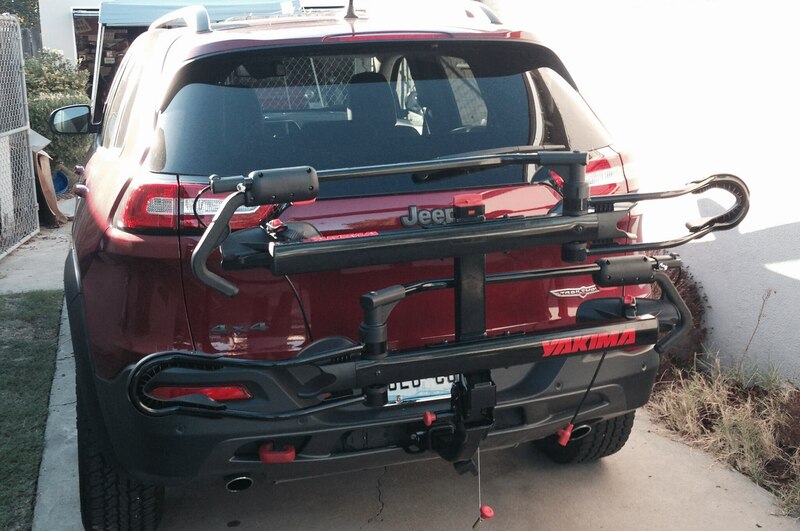 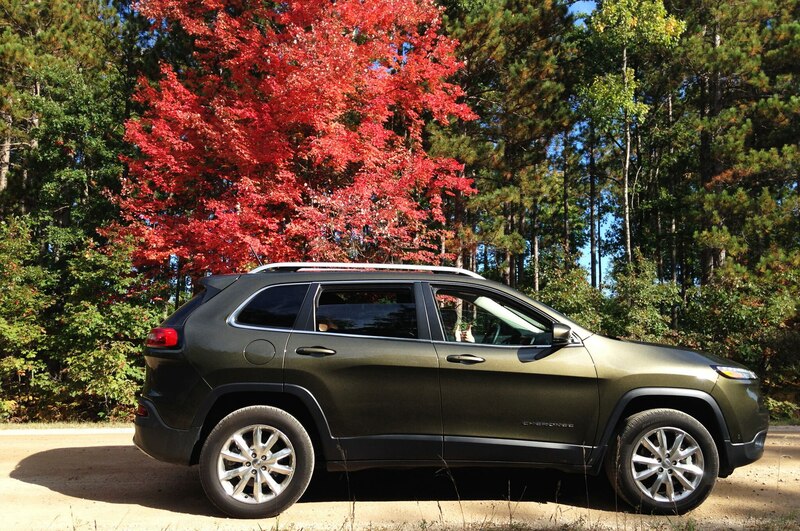 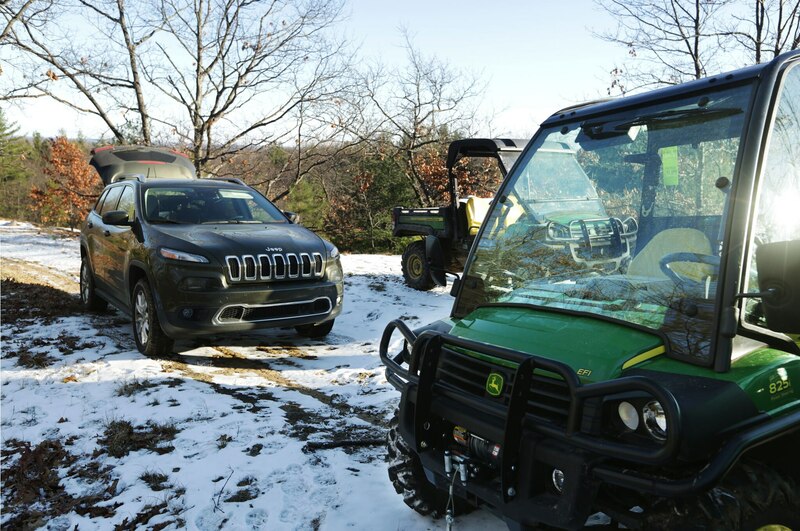 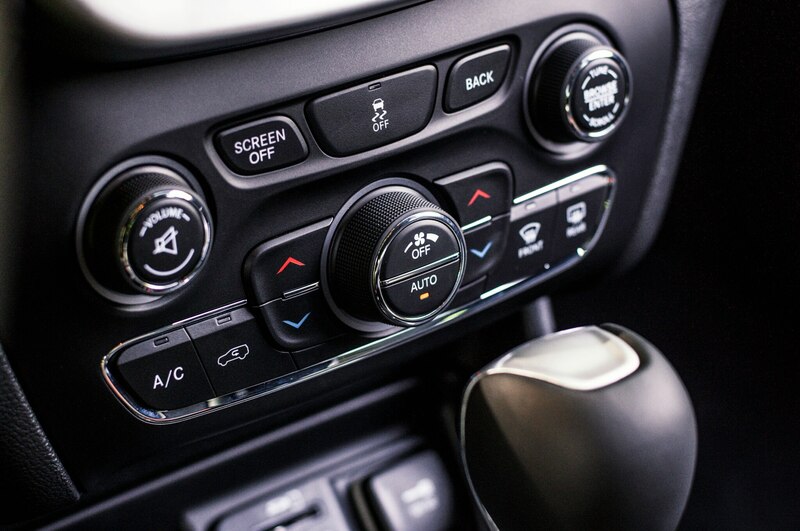 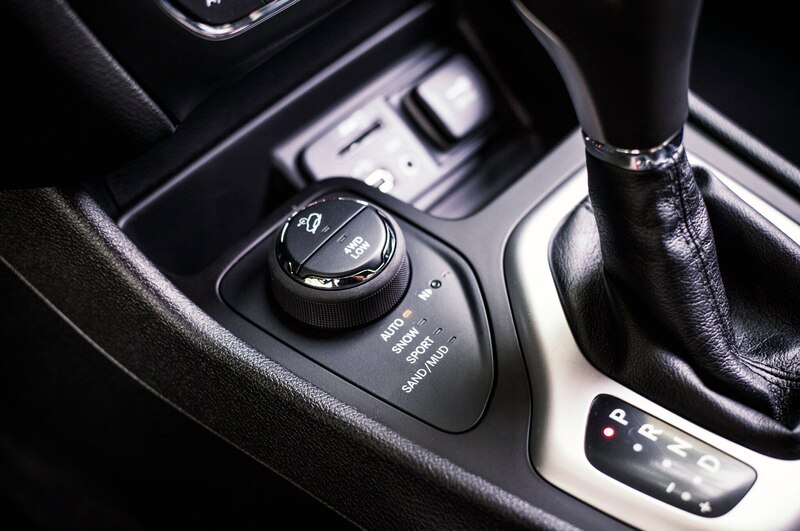 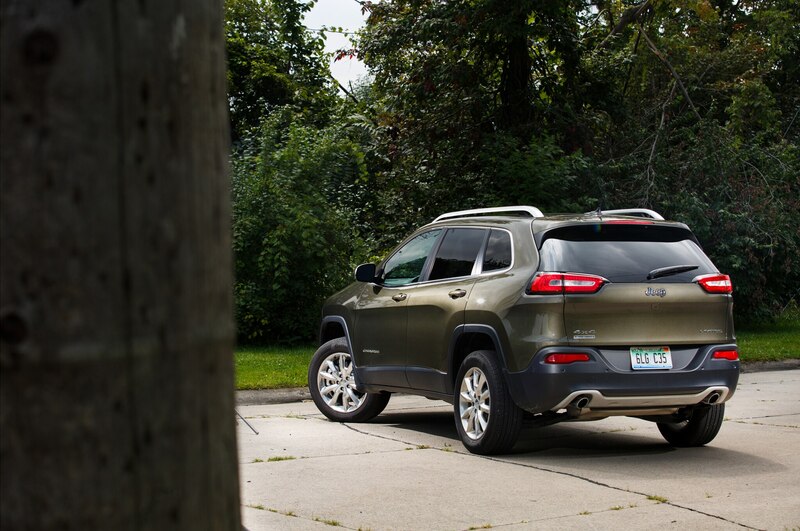 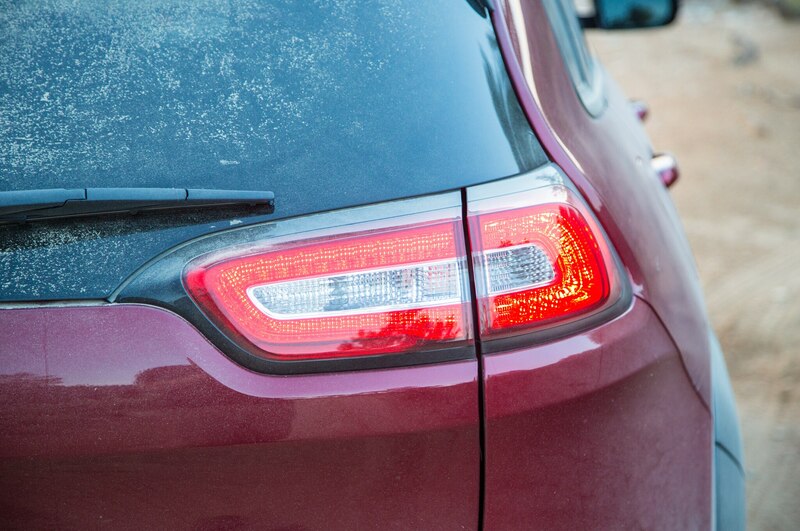 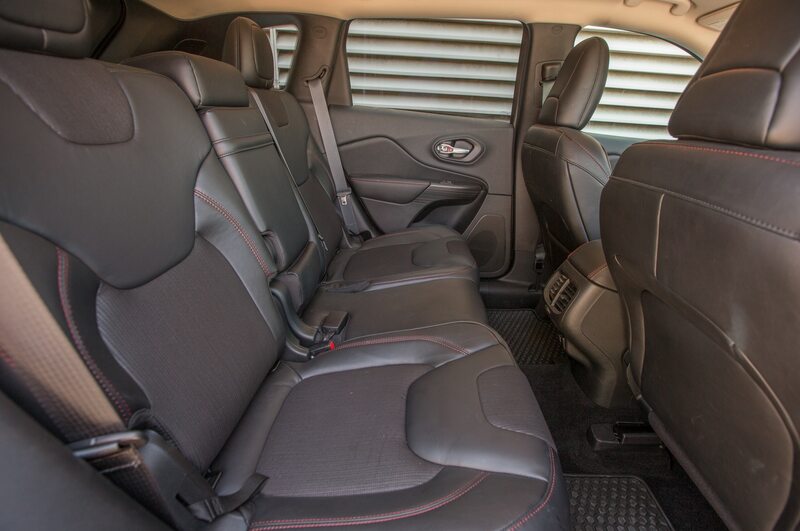 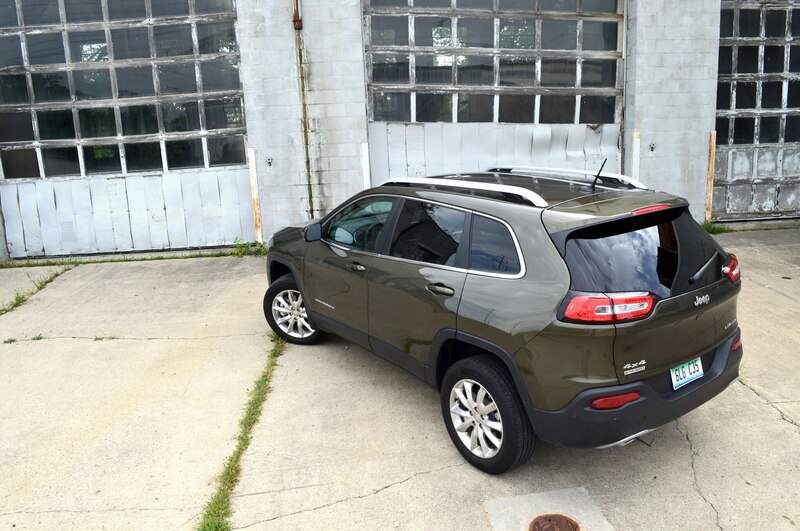 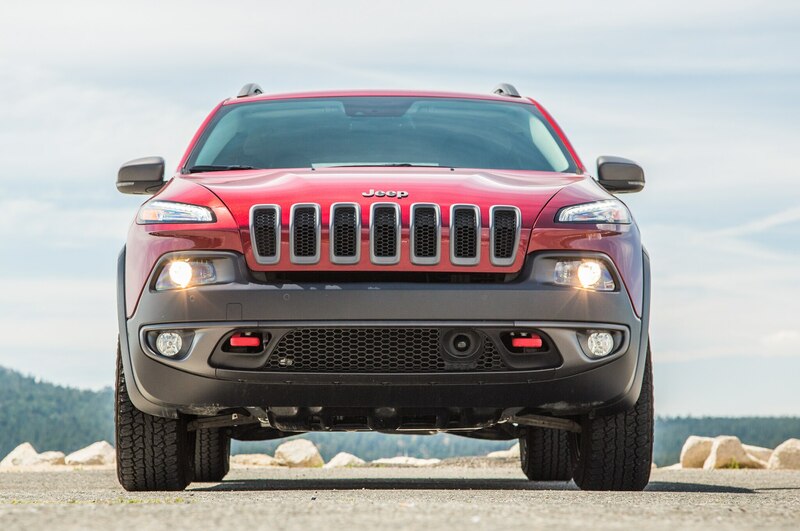 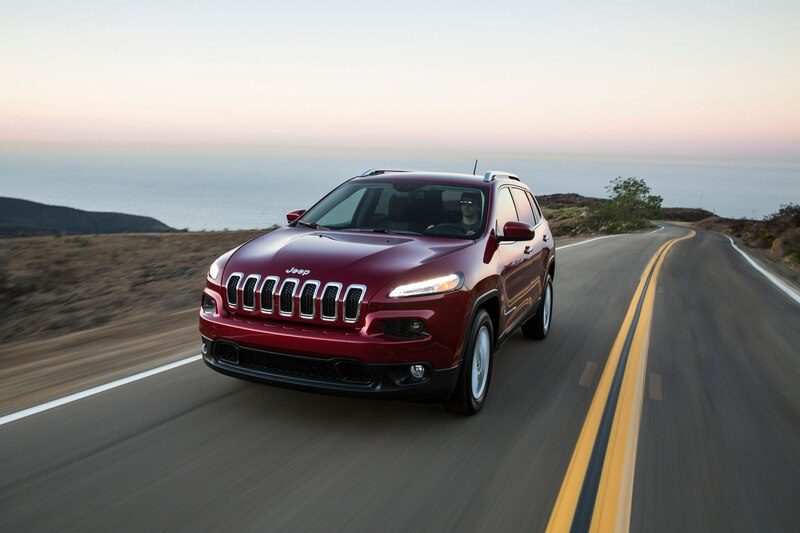 ft.
2014 Jeep Cherokee Limited – Should We Have Picked the Trailhawk? 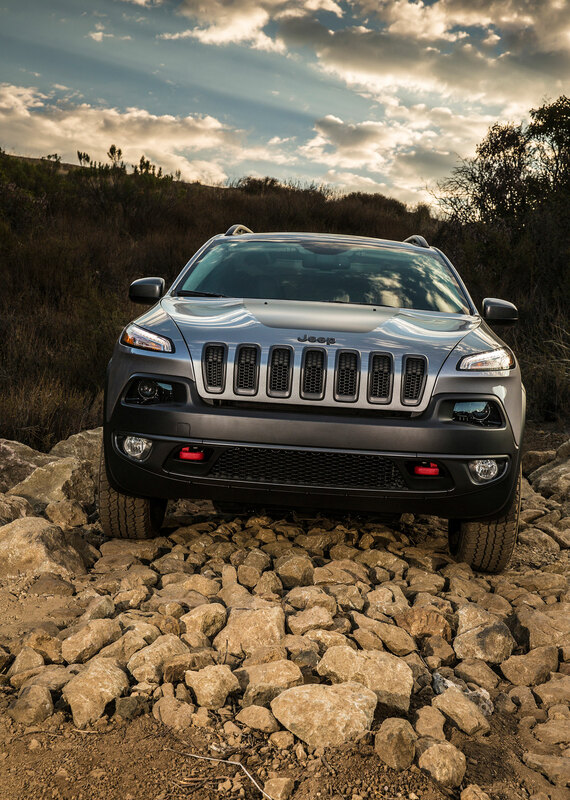 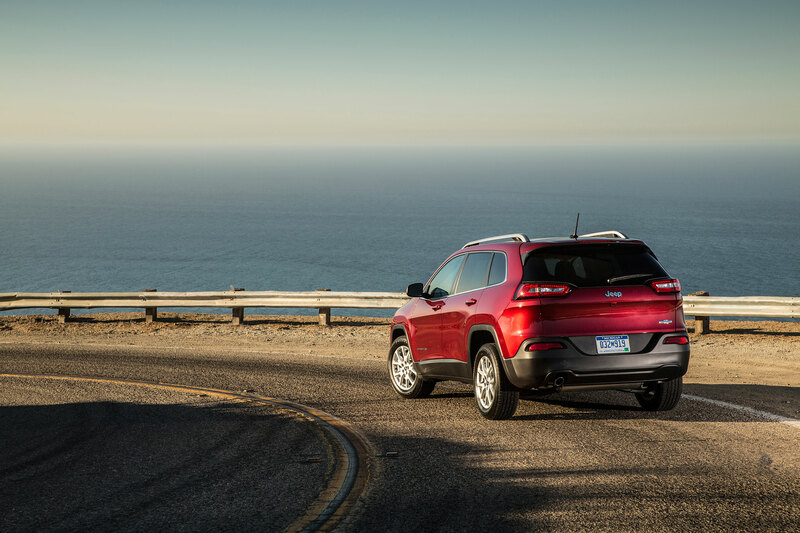 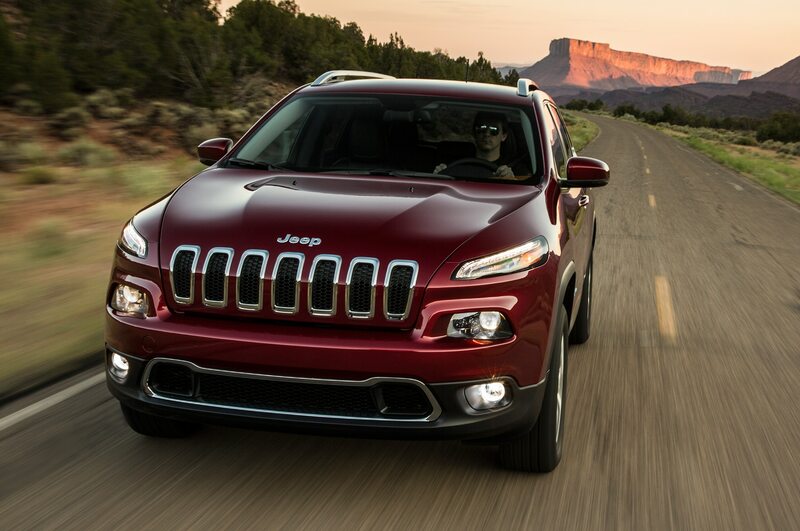 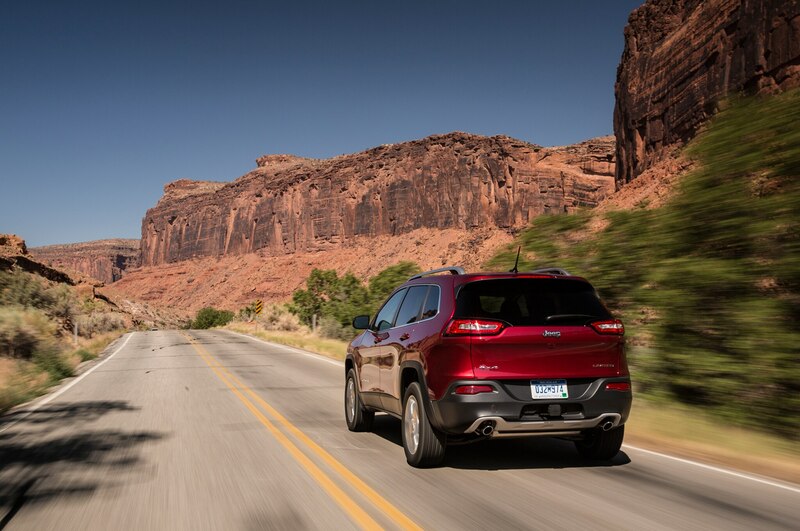 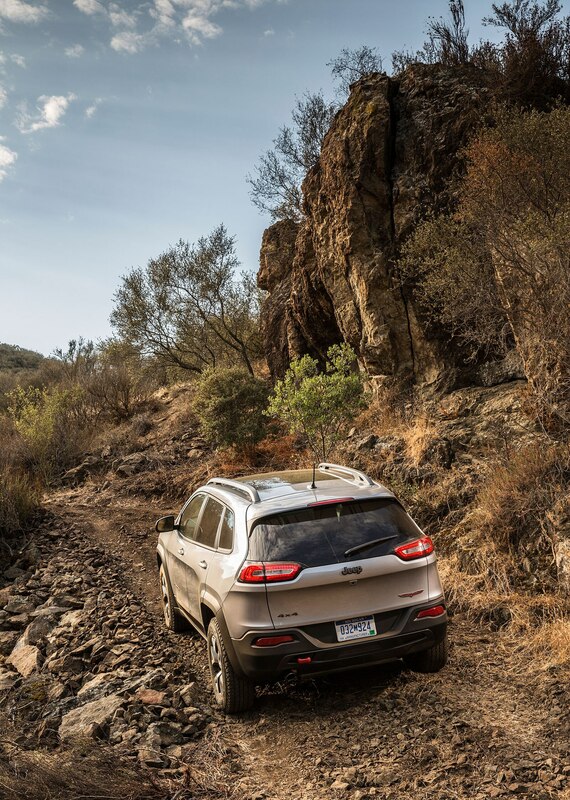 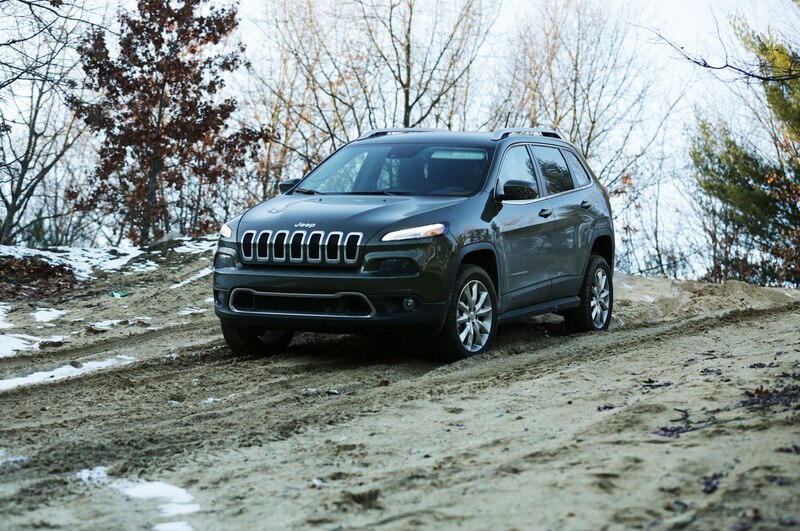 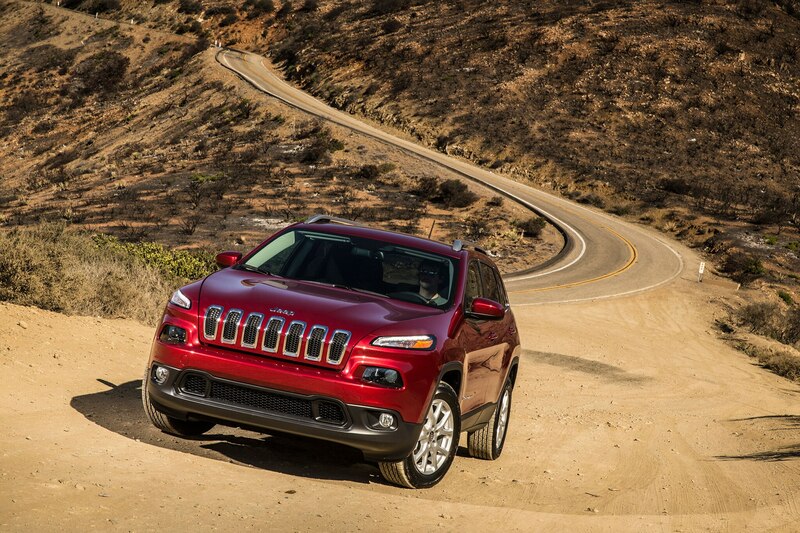 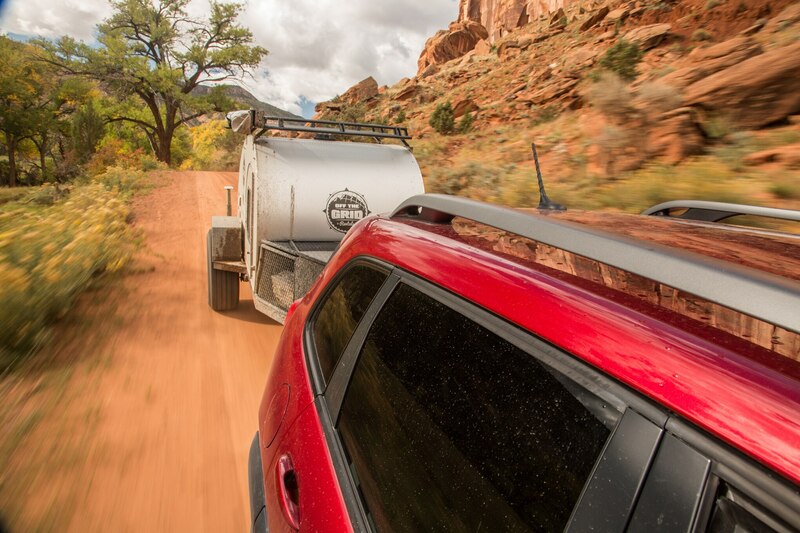 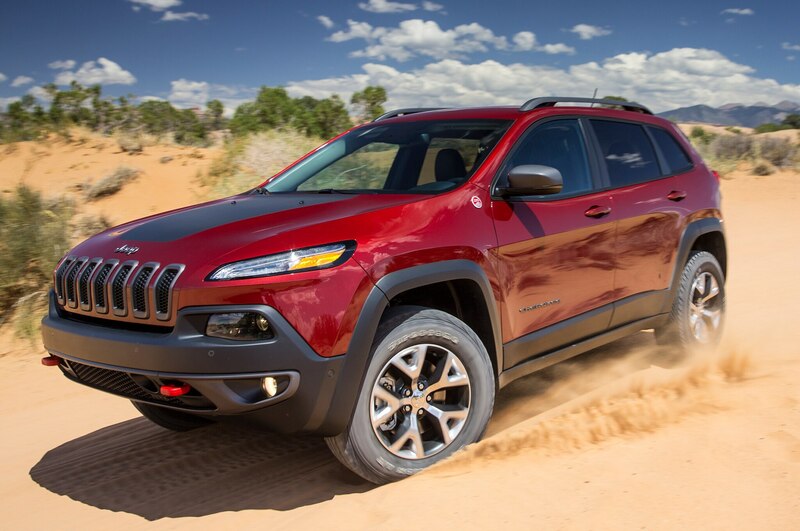 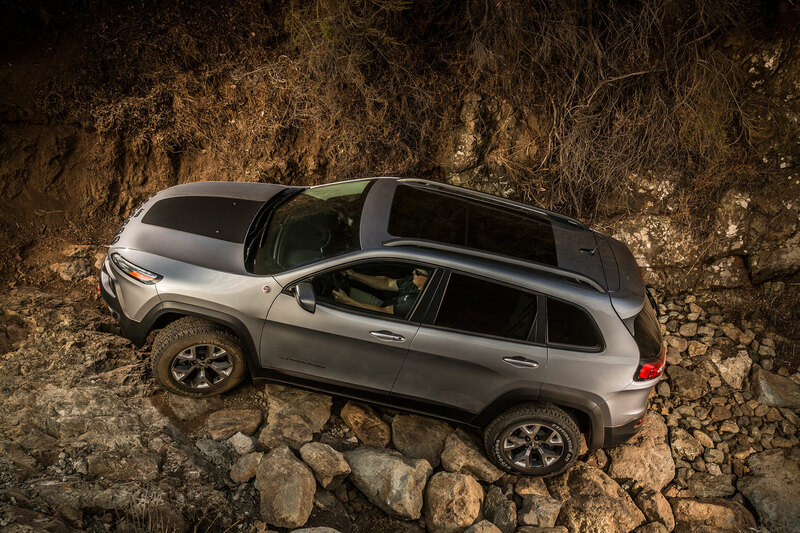 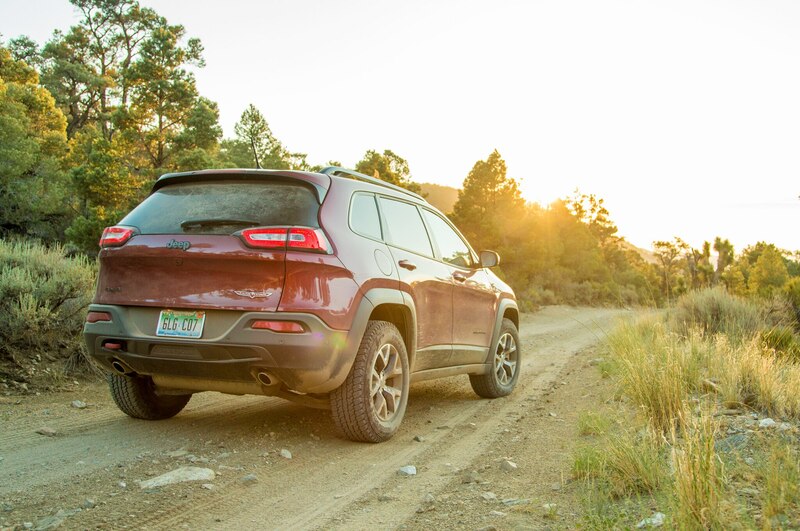 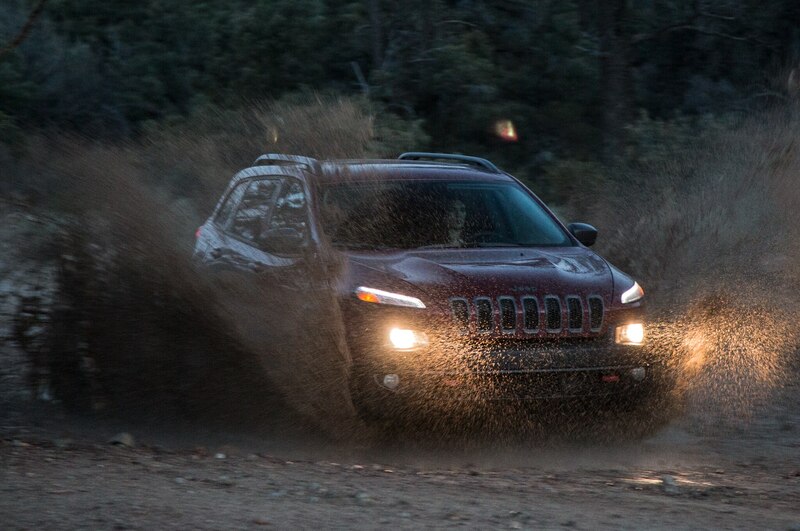 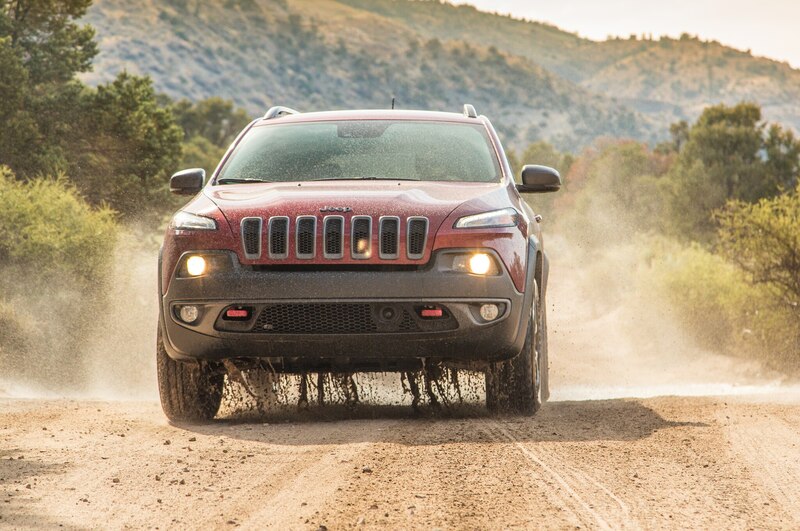 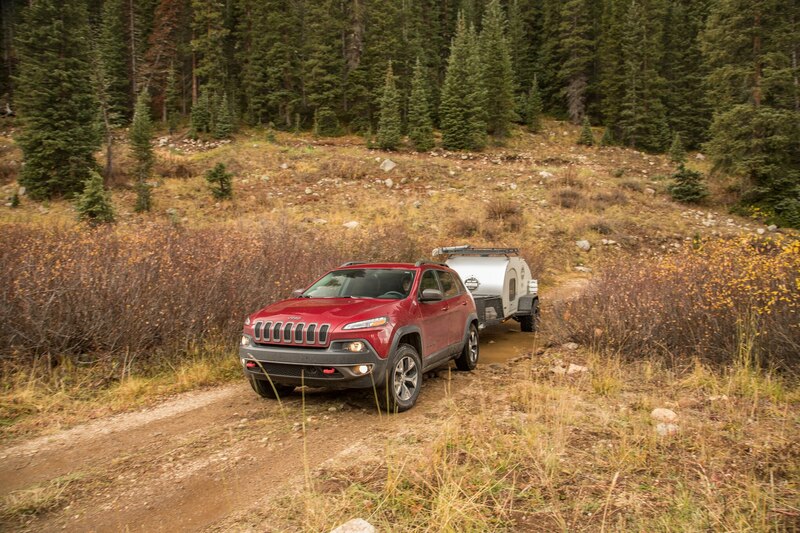 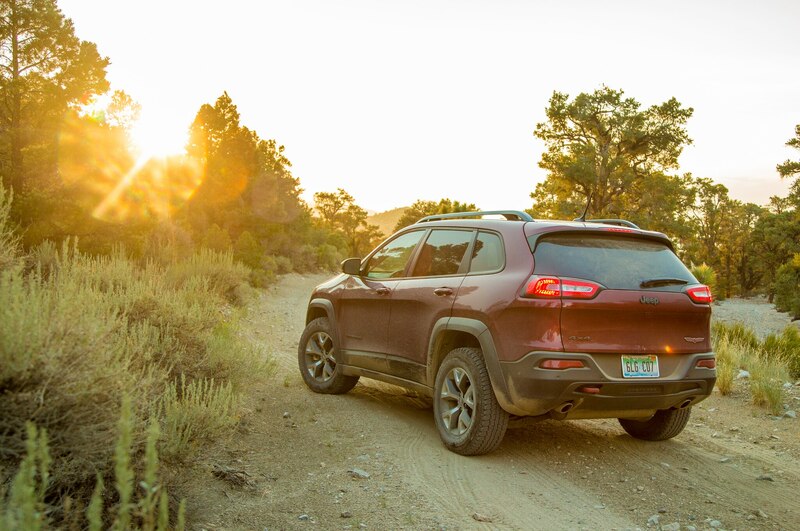 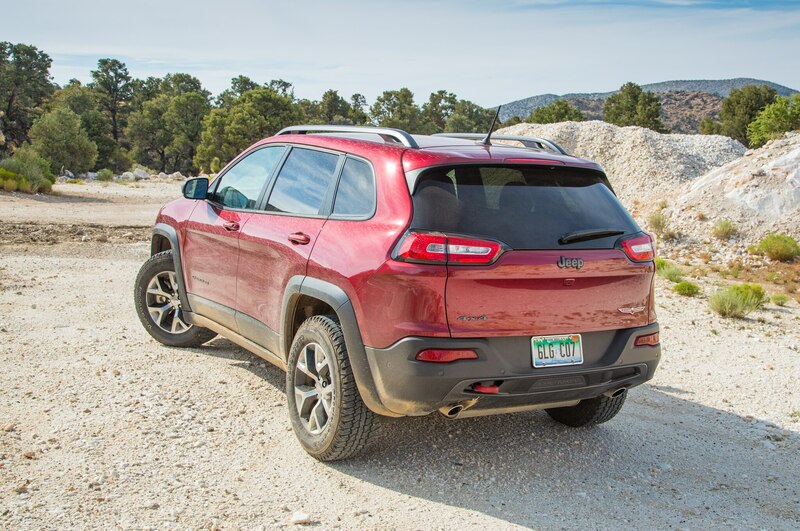 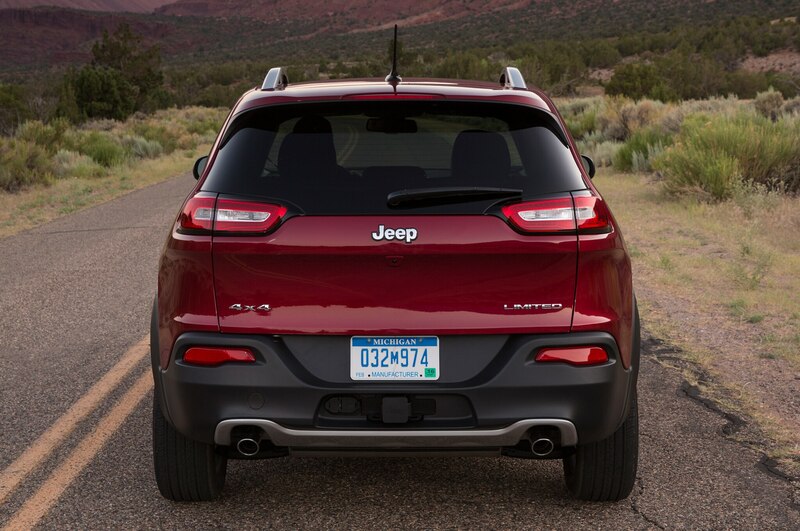 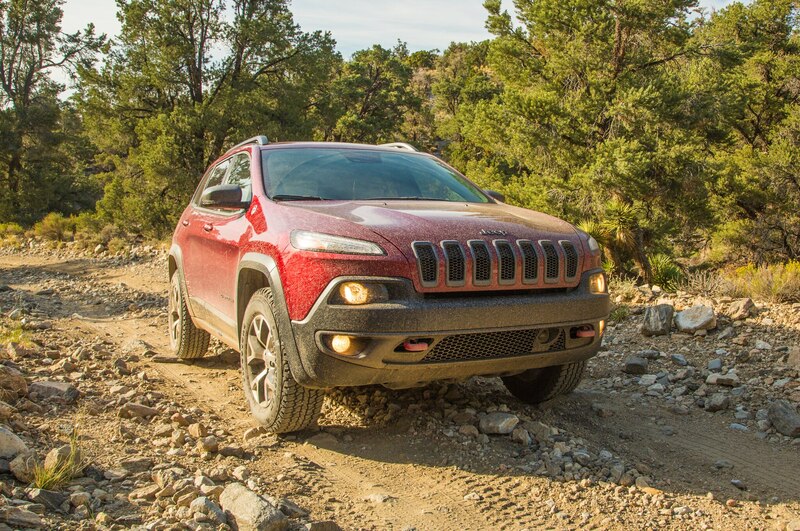 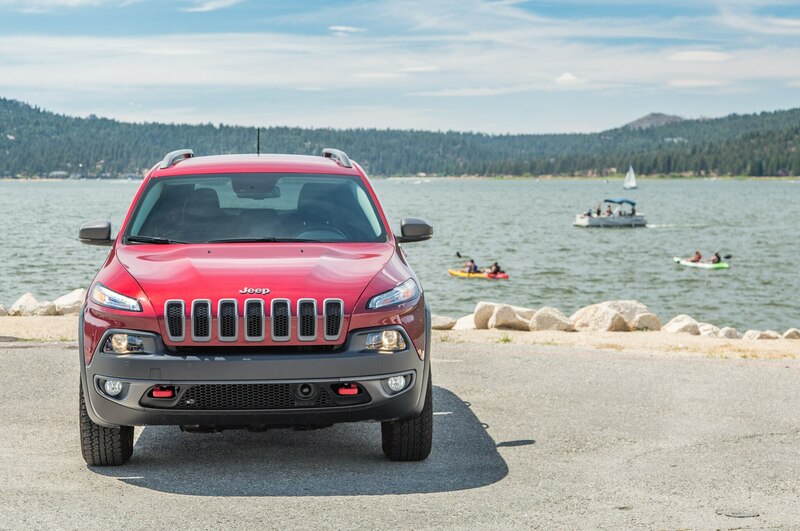 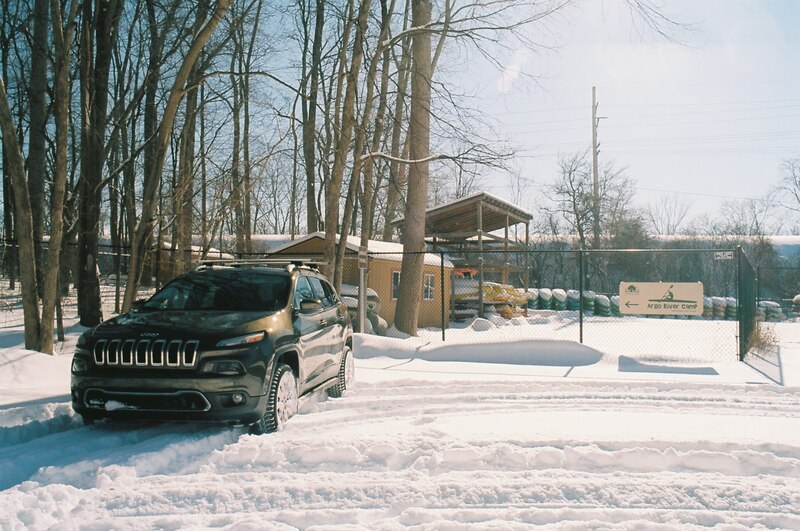 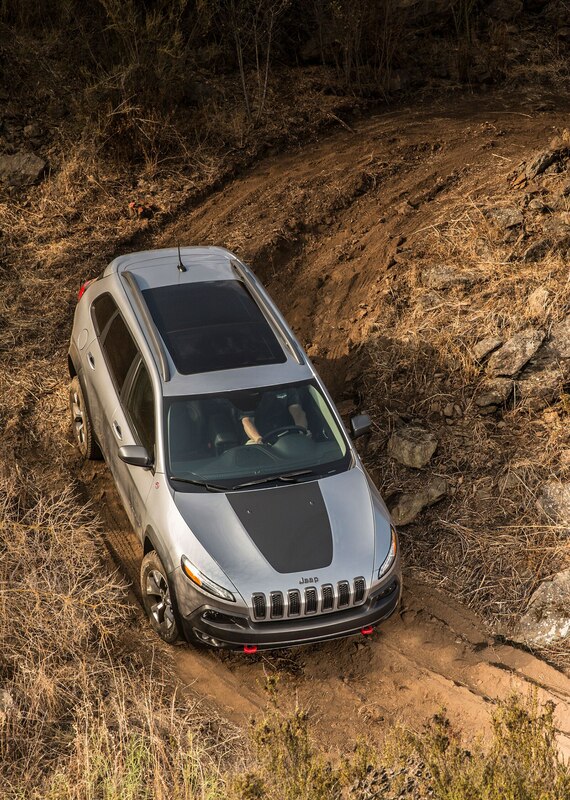 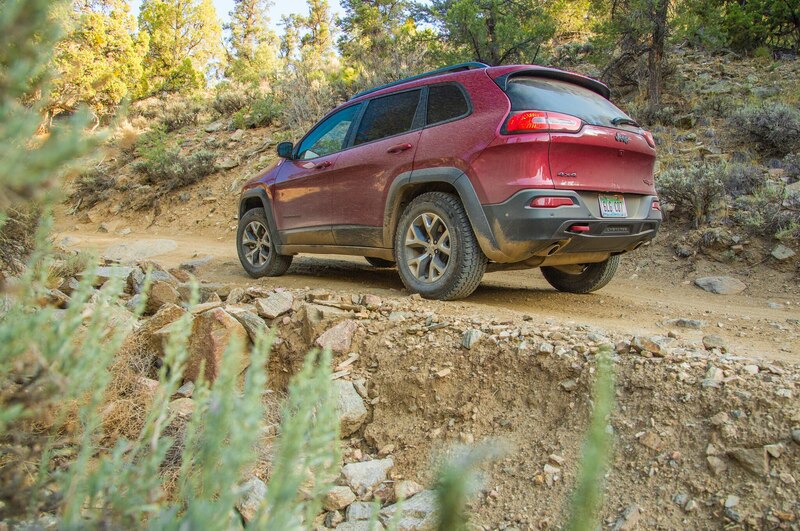 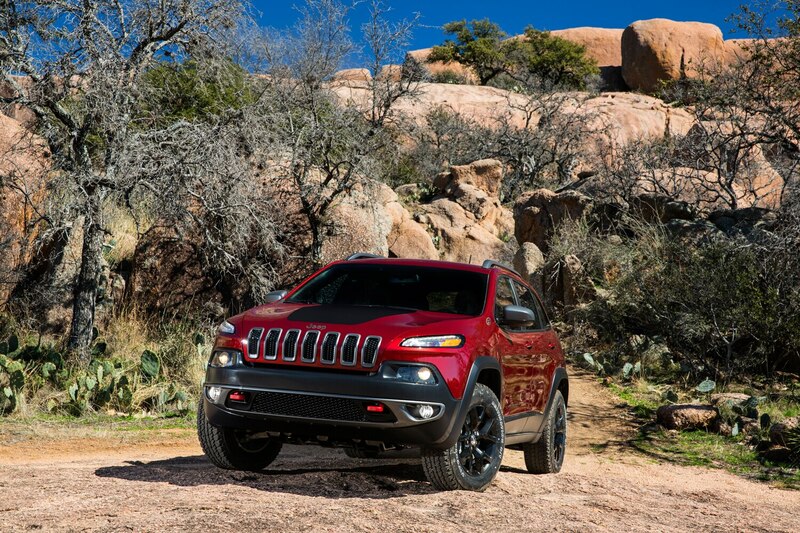 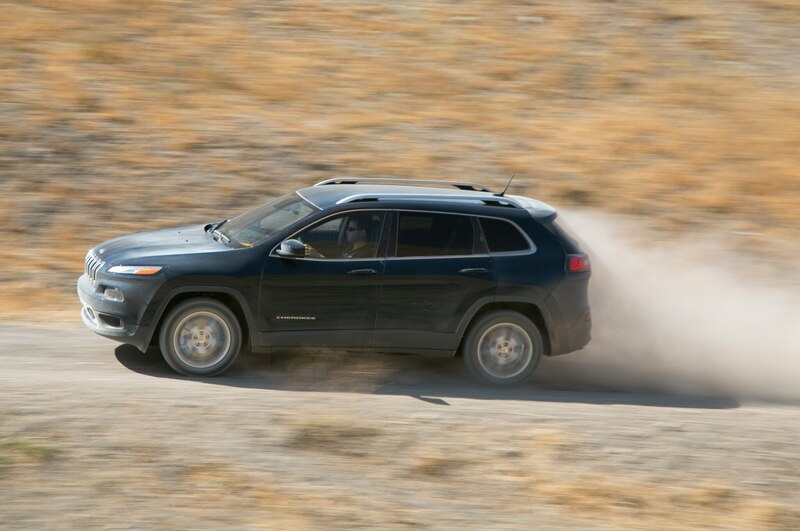 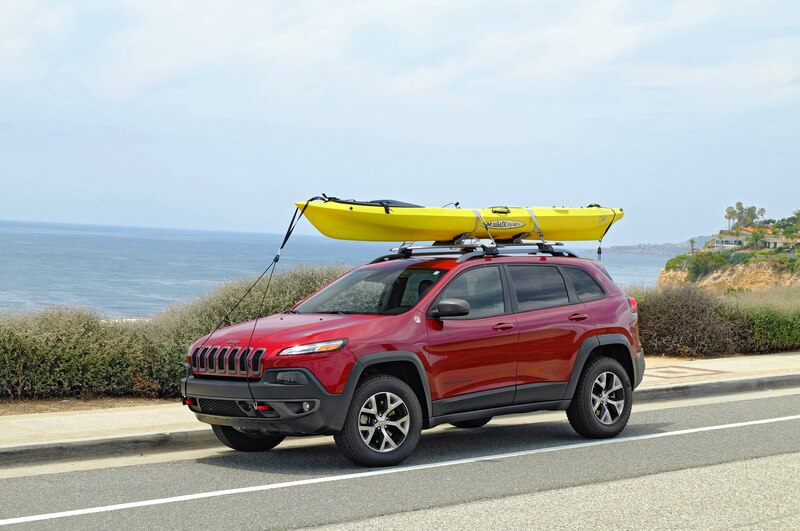 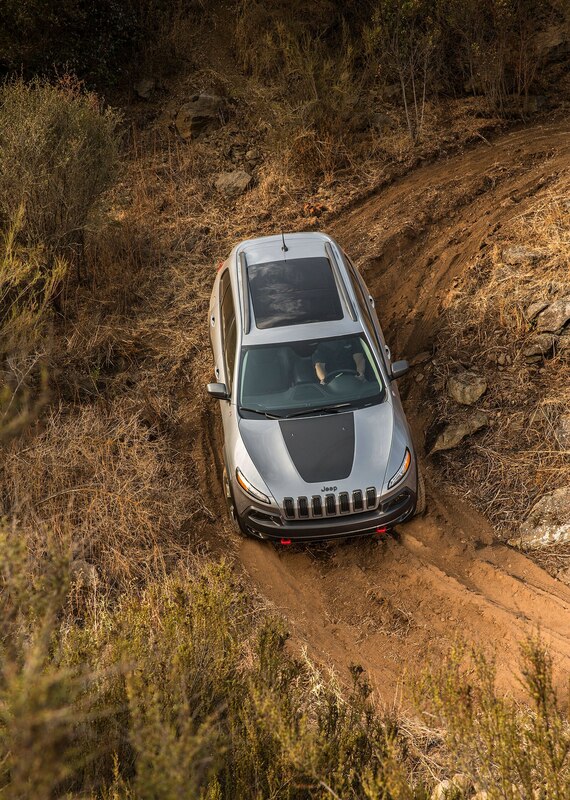 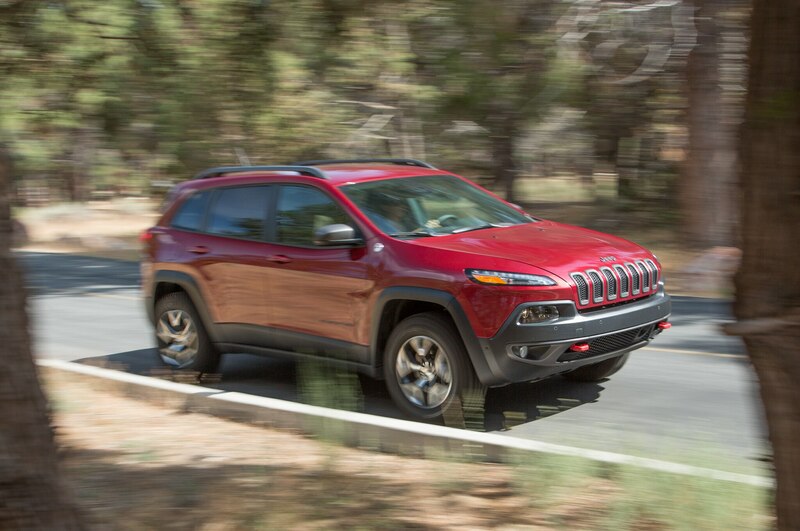 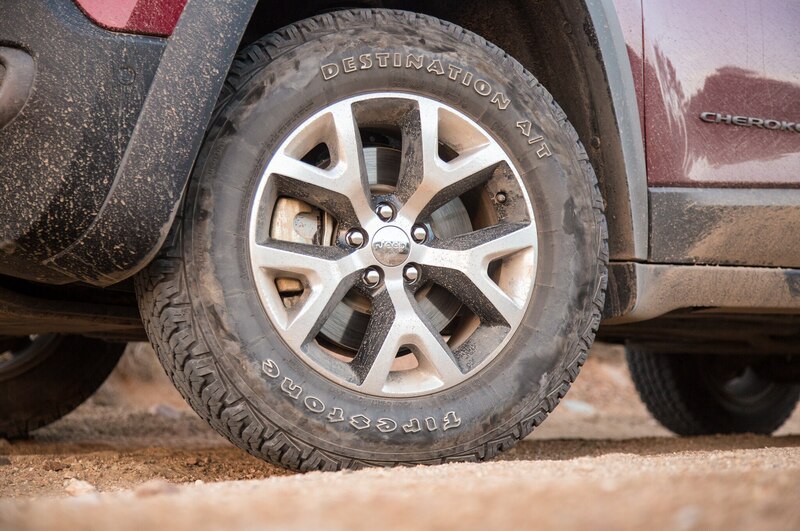 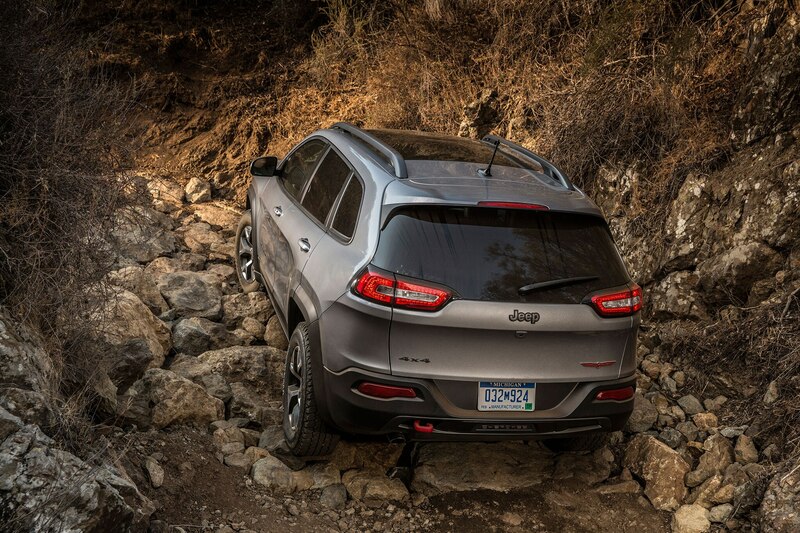 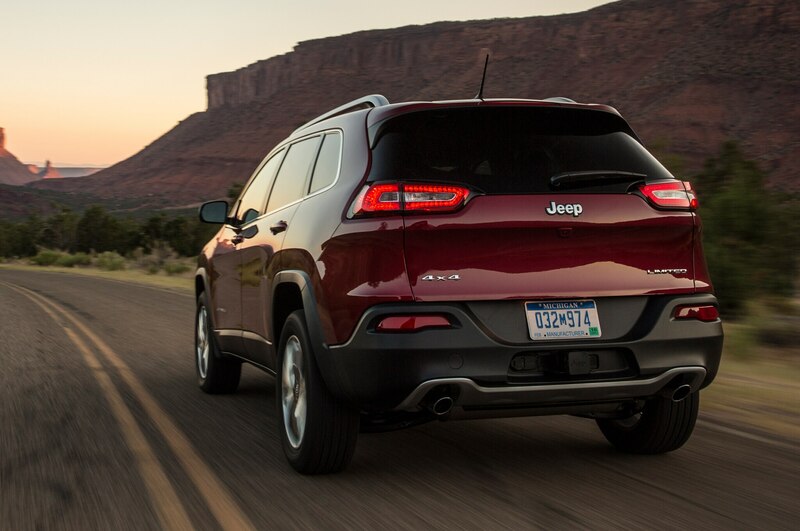 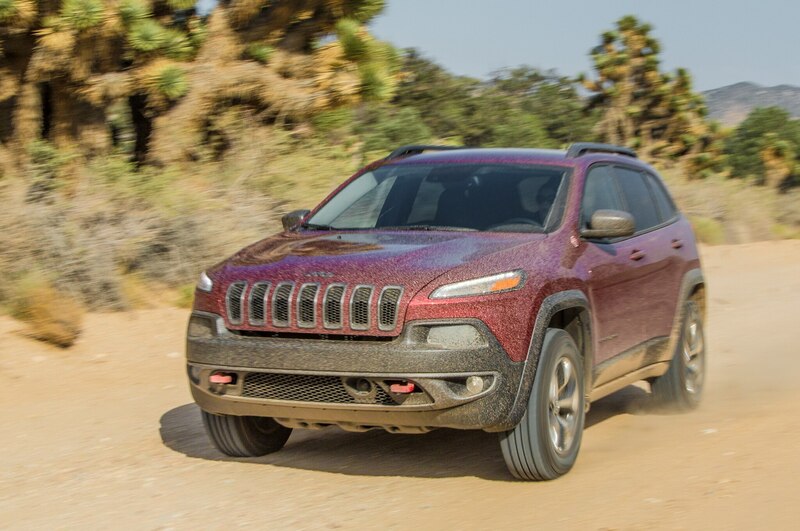 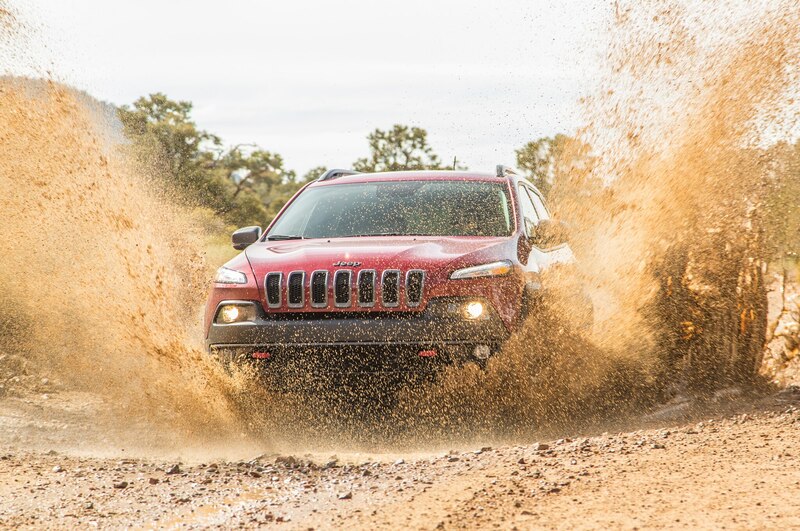 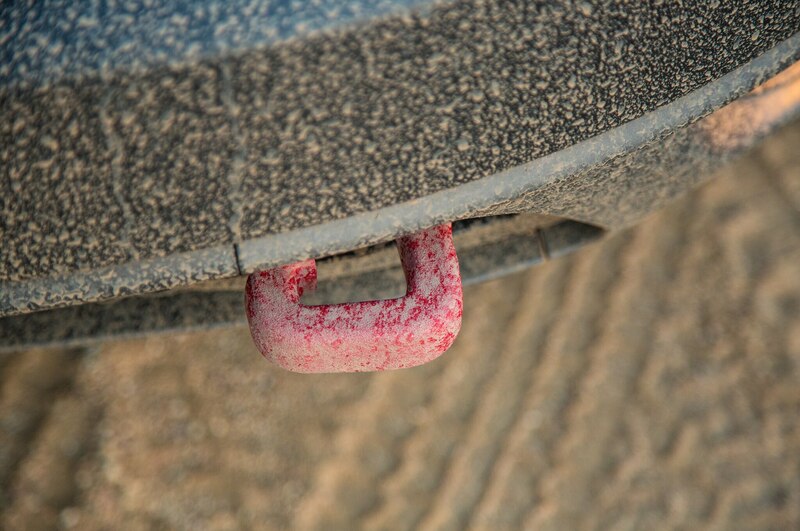 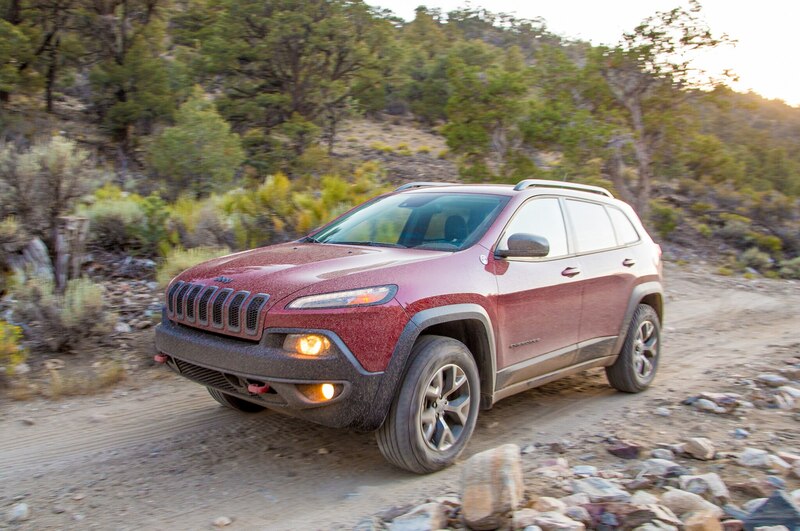 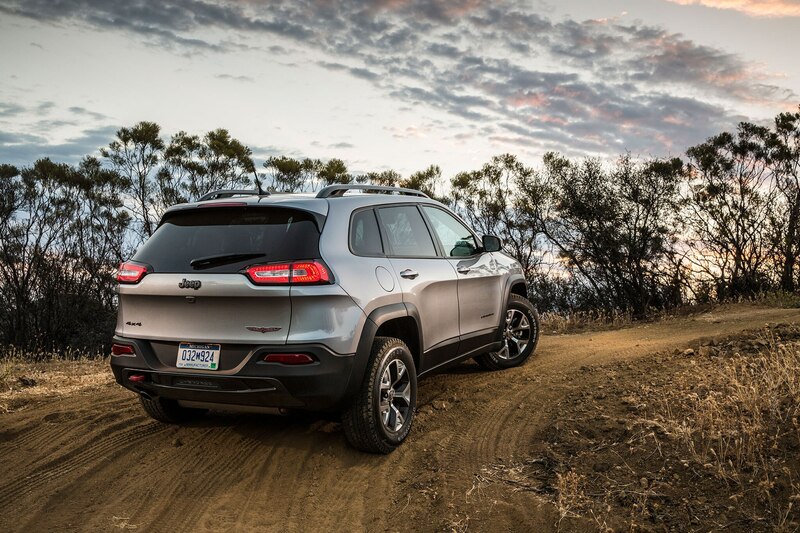 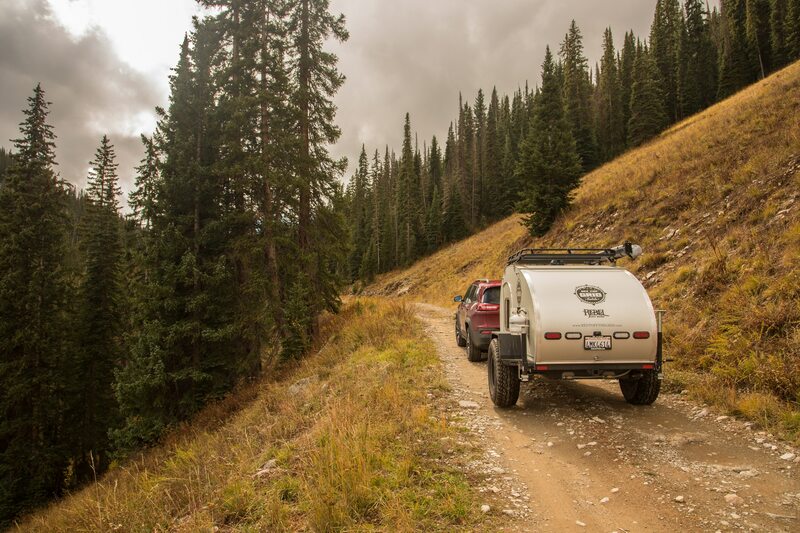 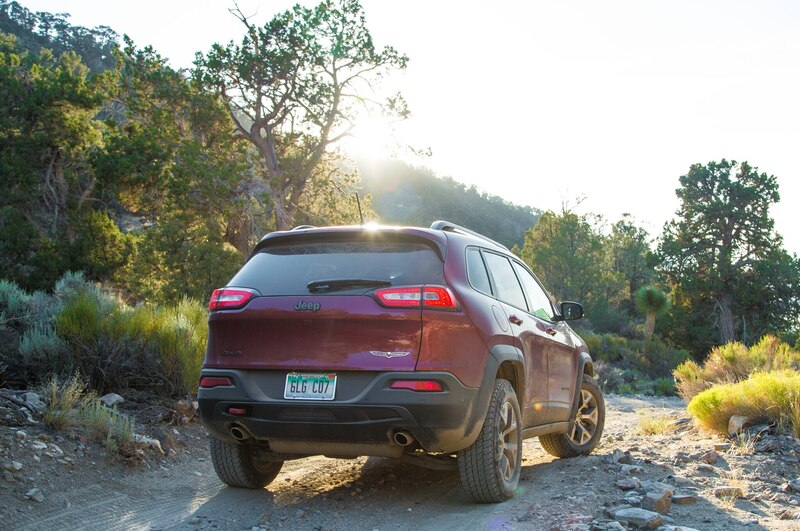 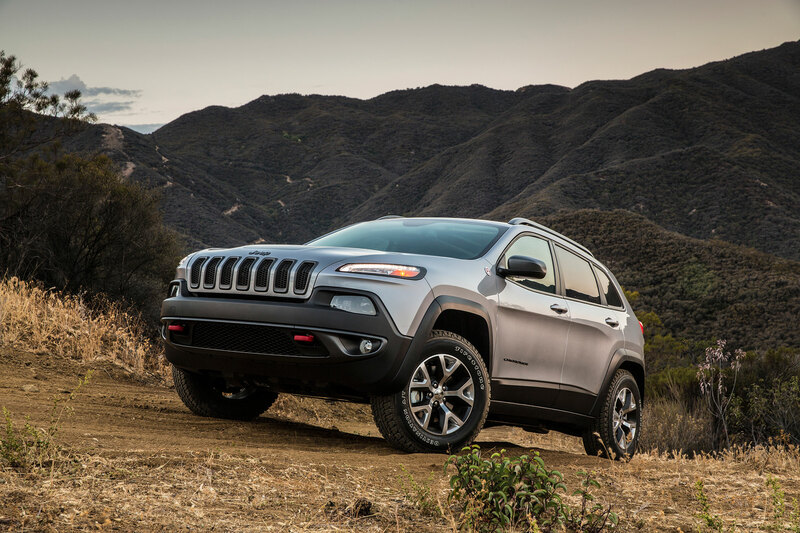 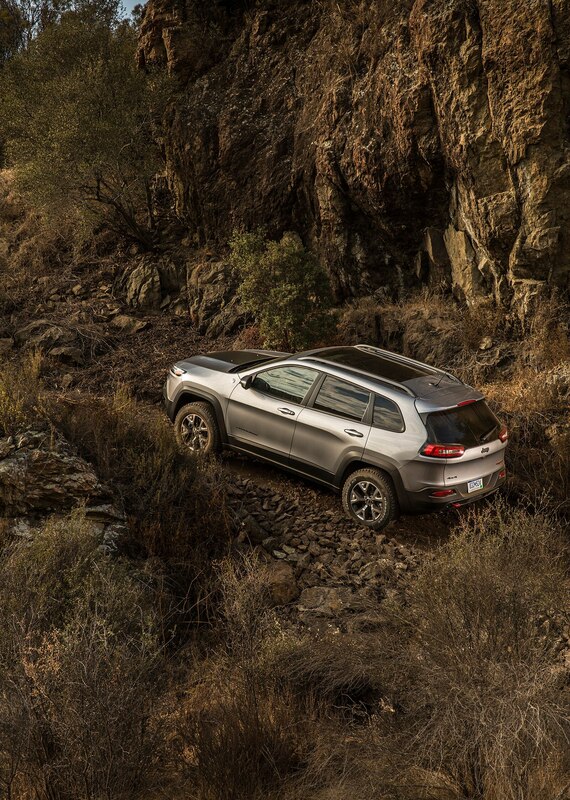 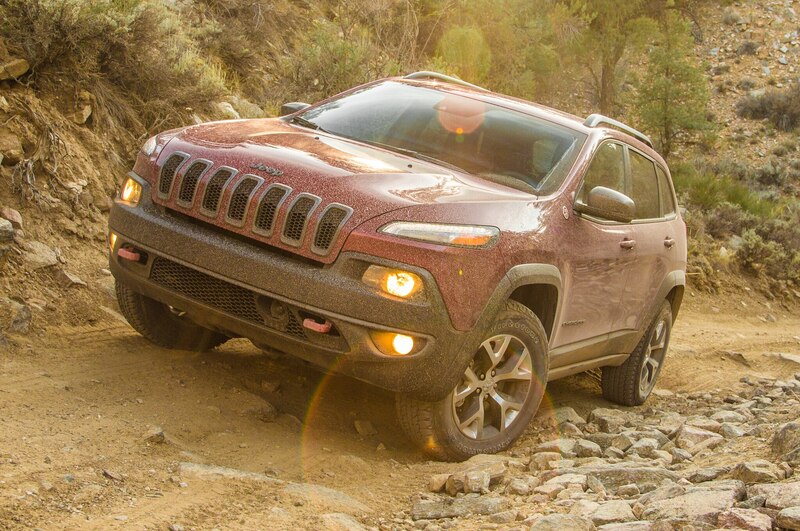 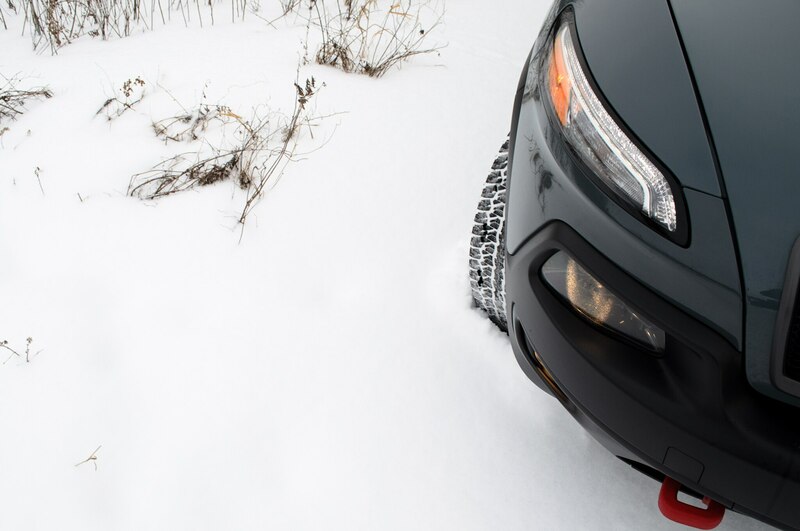 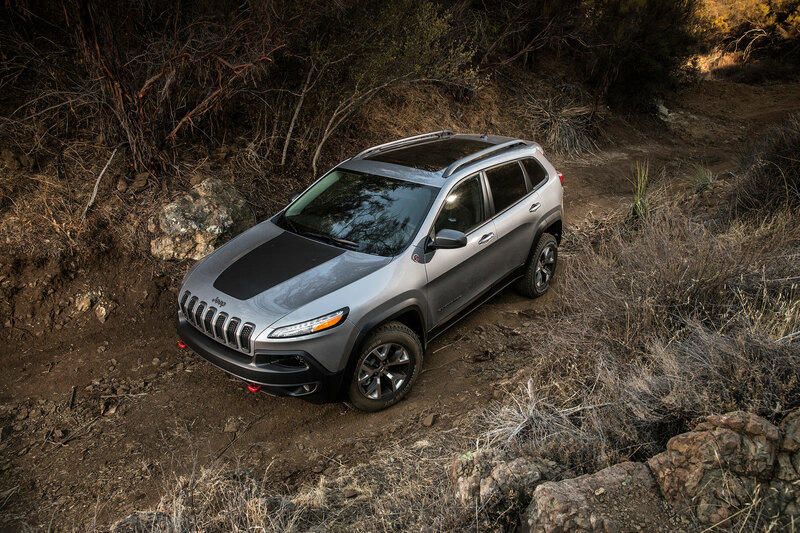 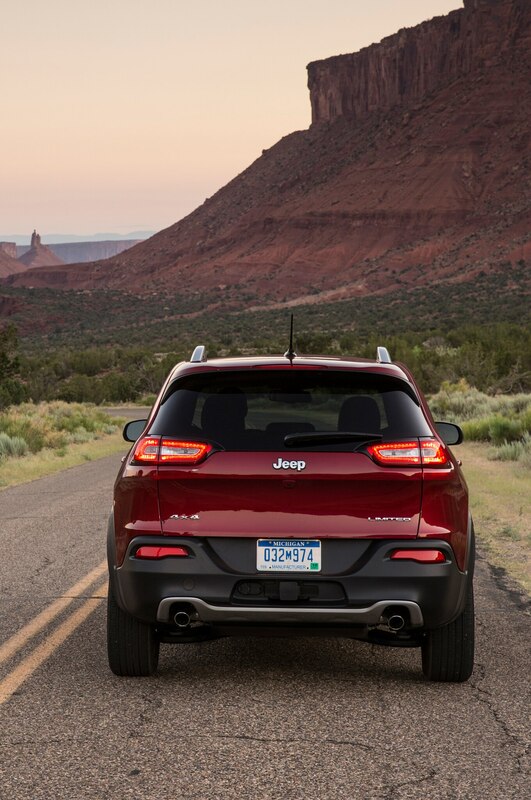 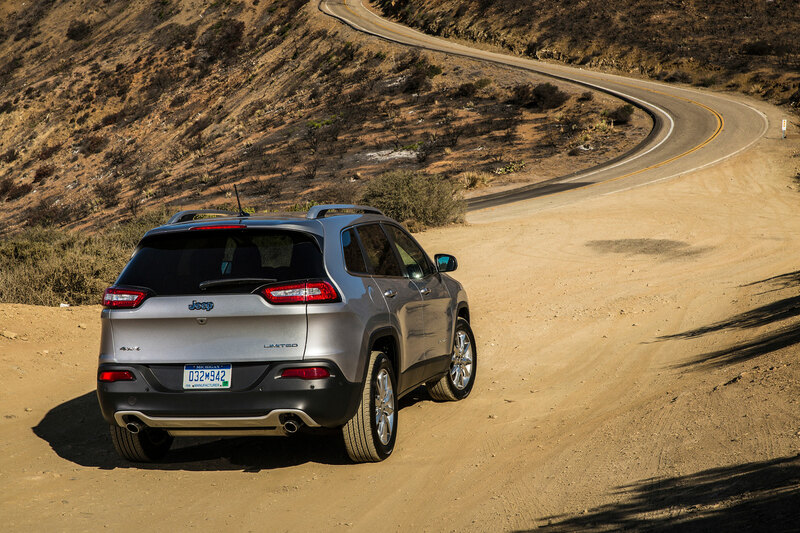 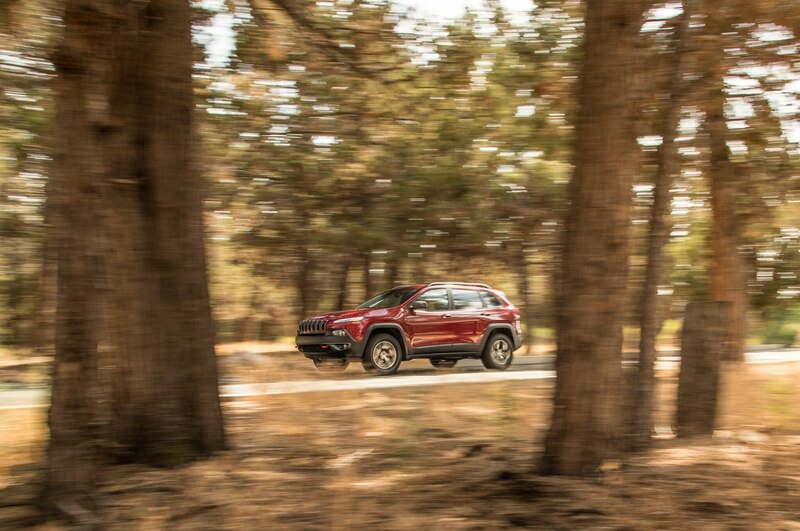 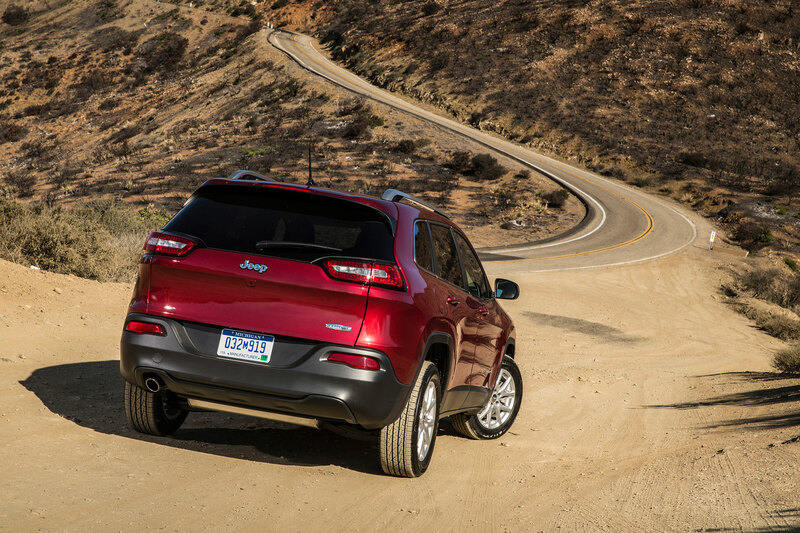 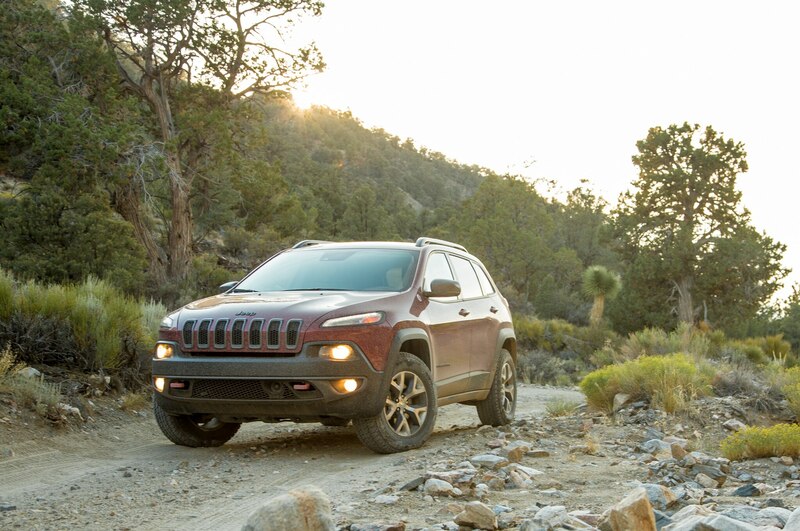 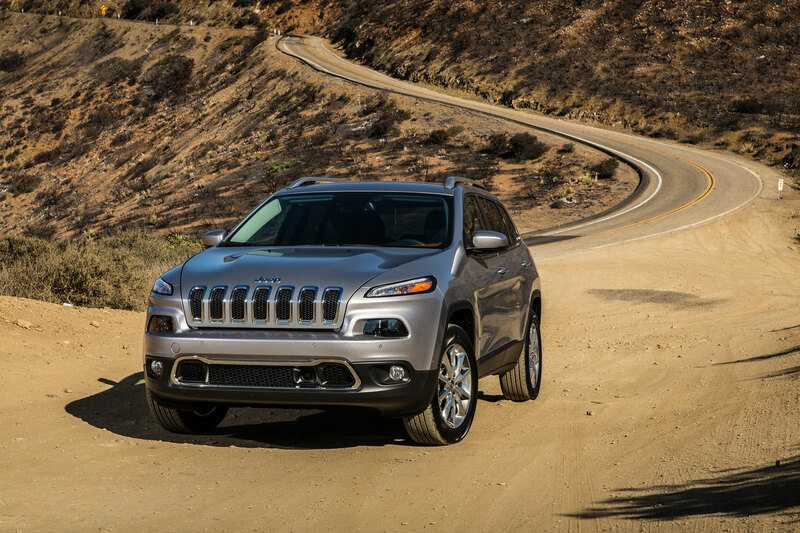 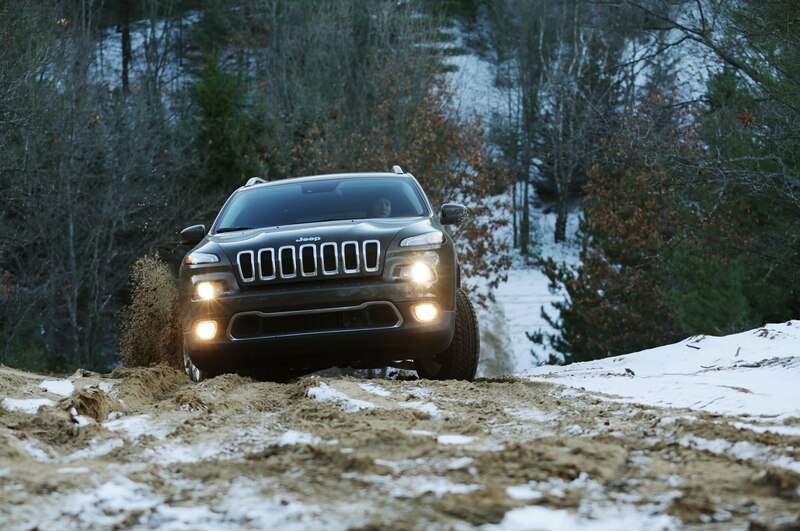 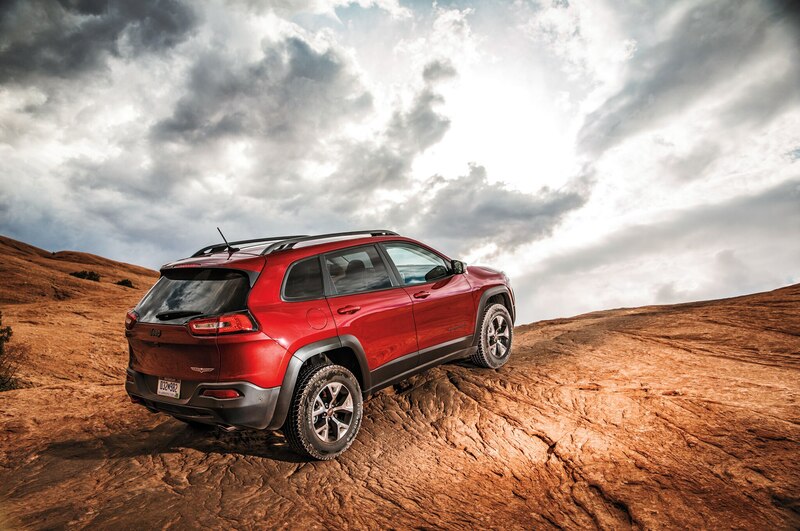 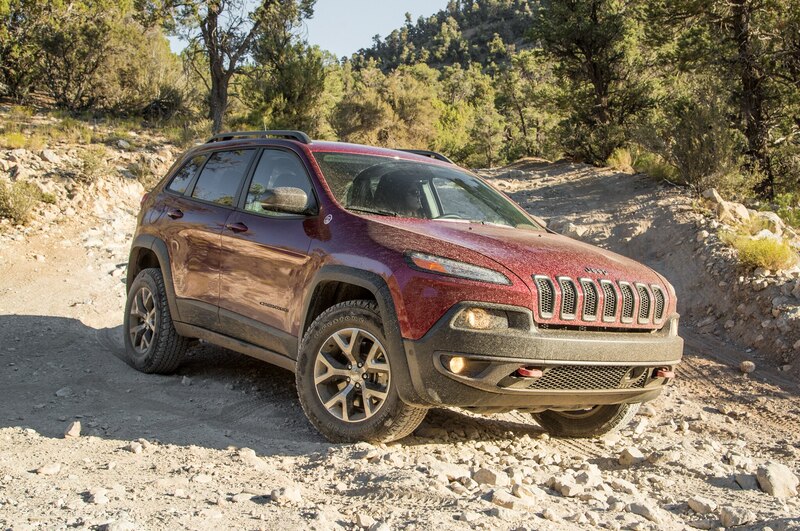 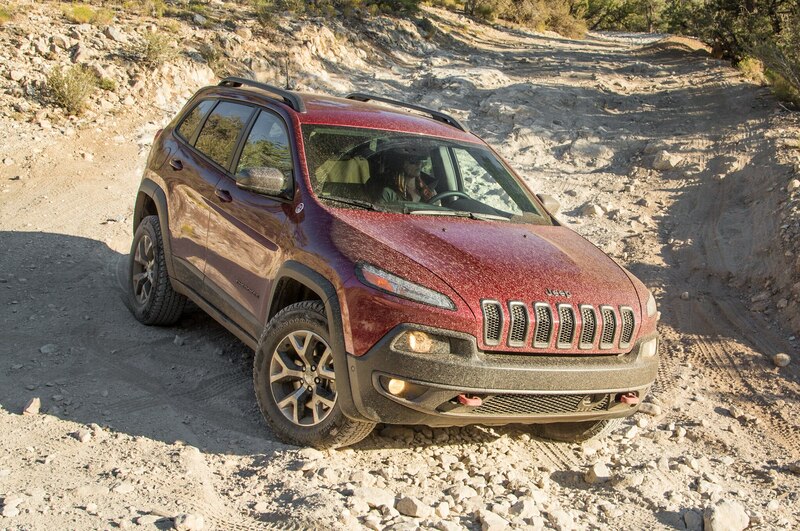 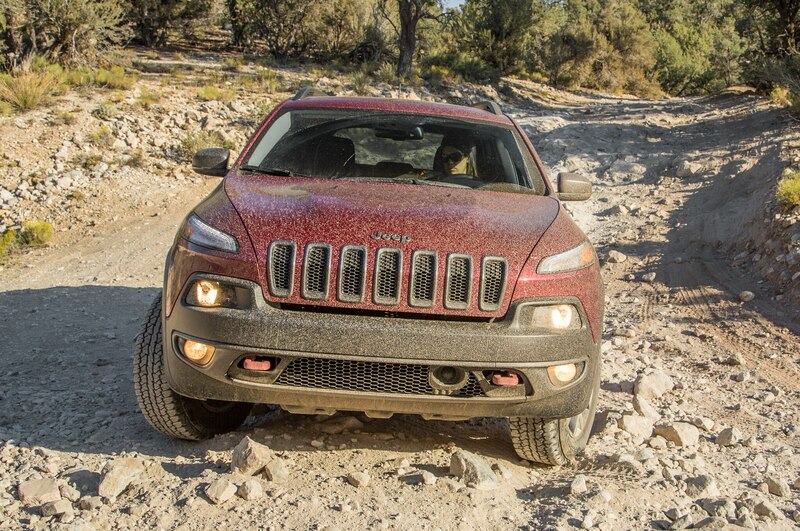 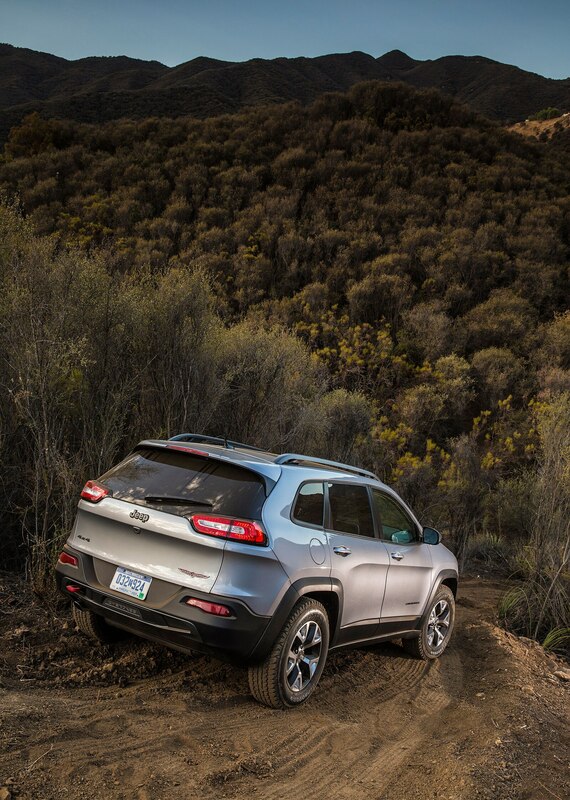 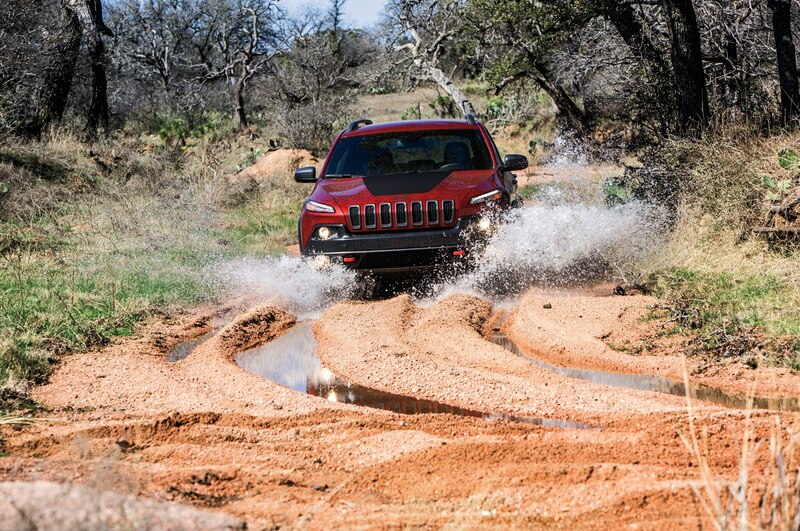 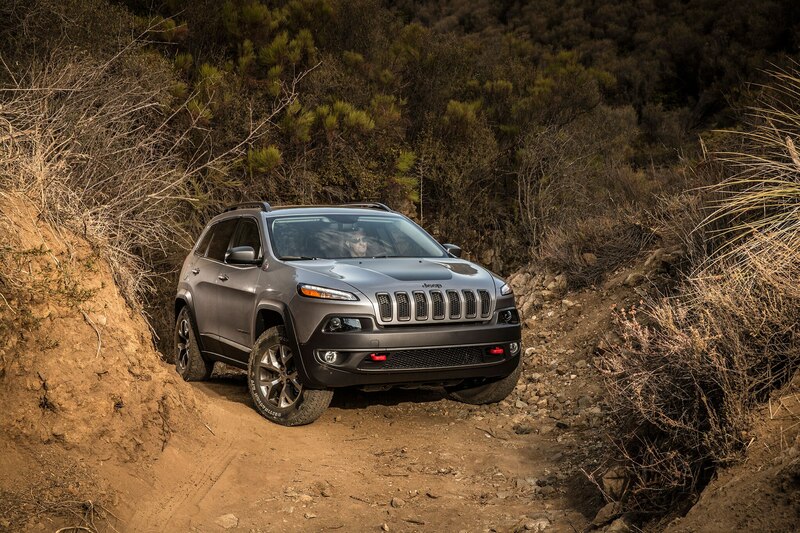 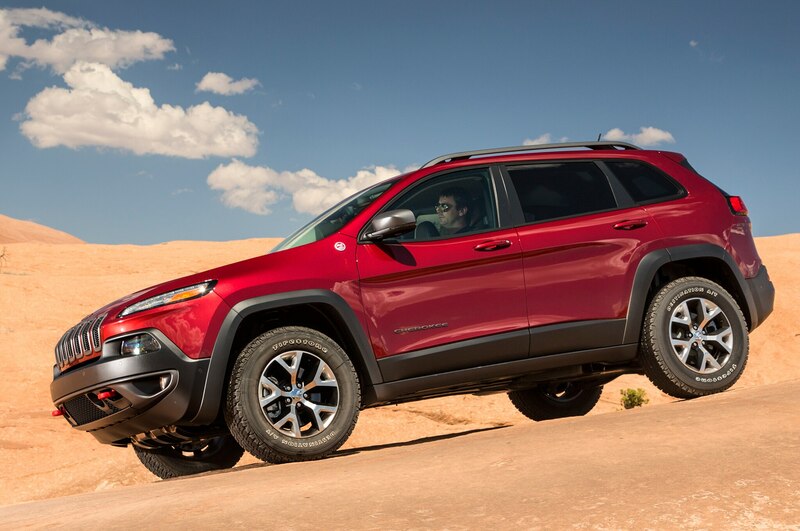 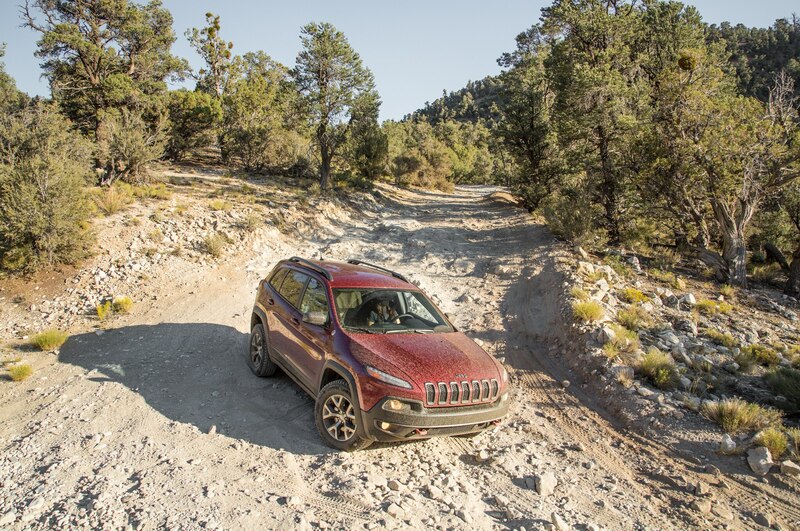 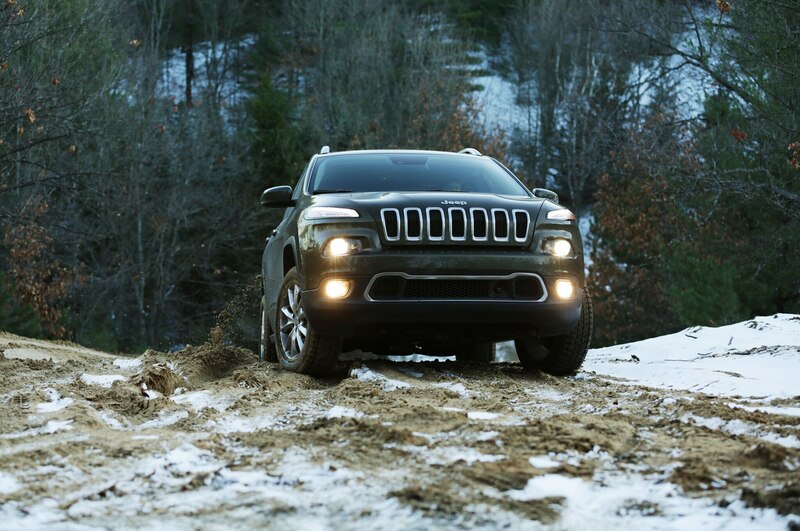 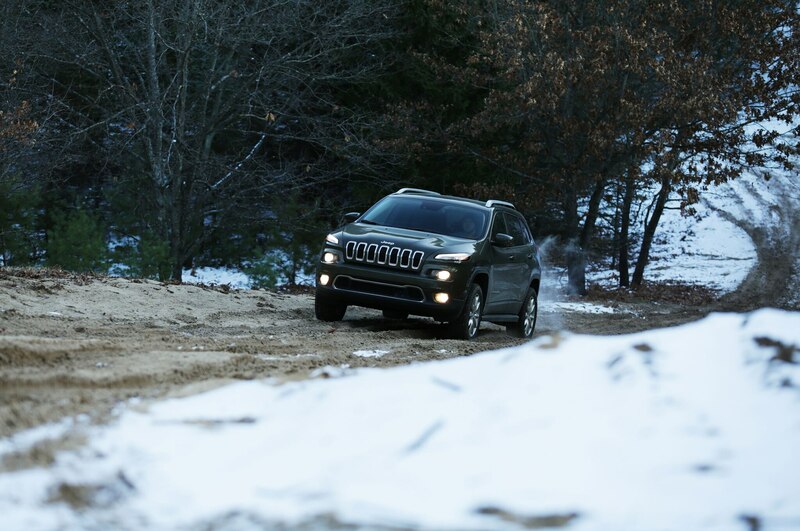 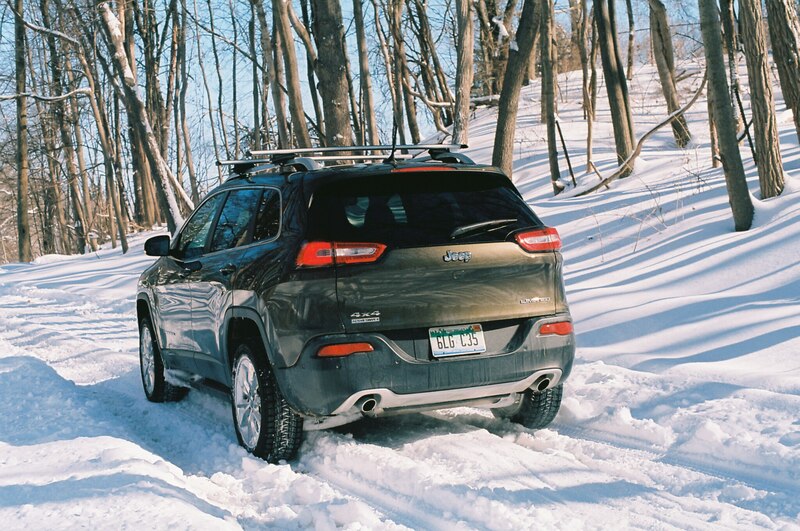 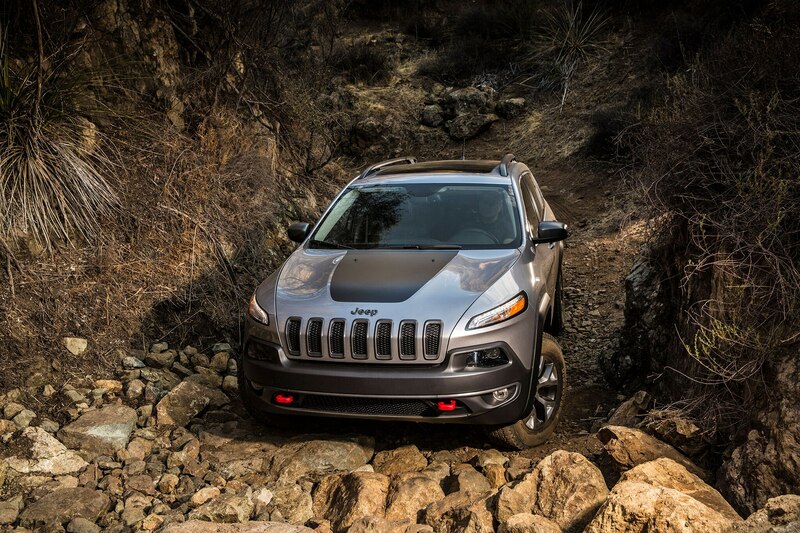 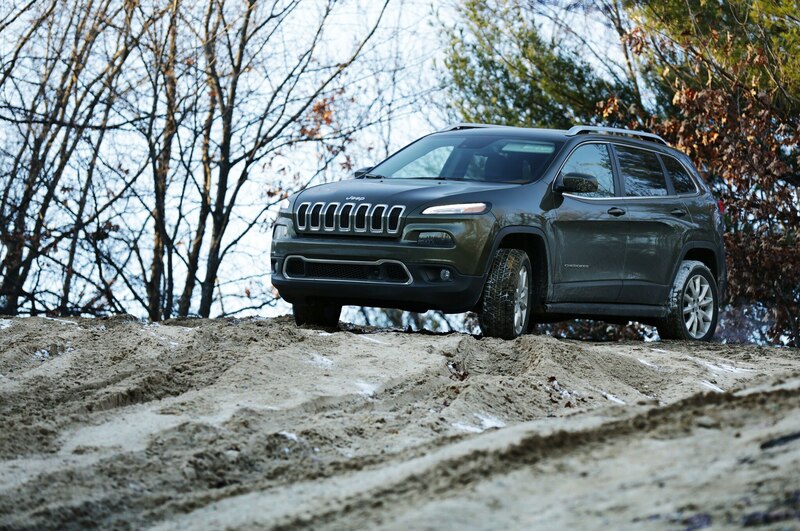 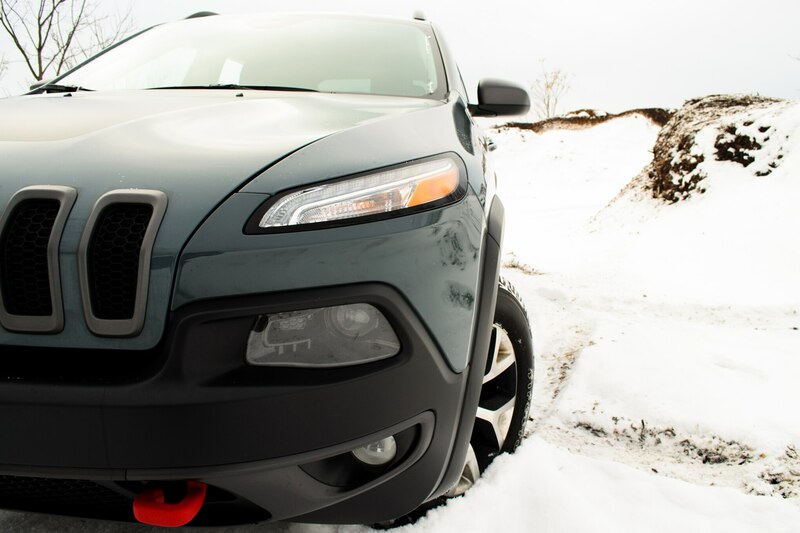 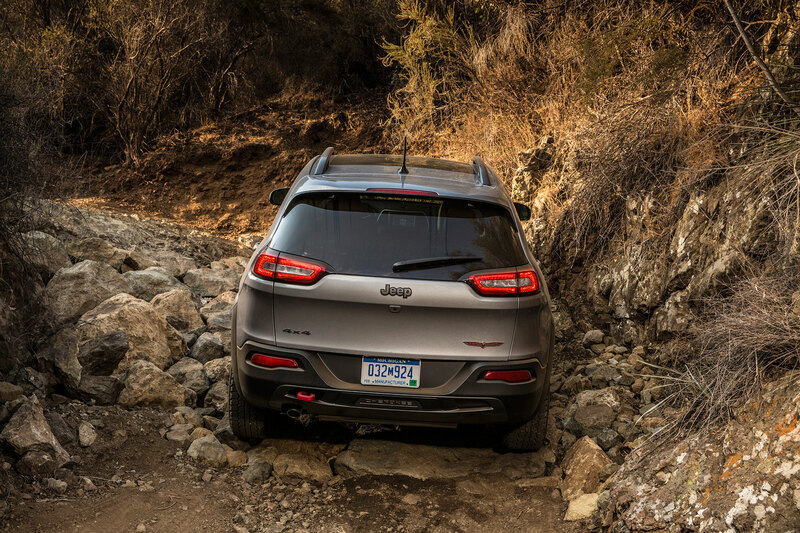 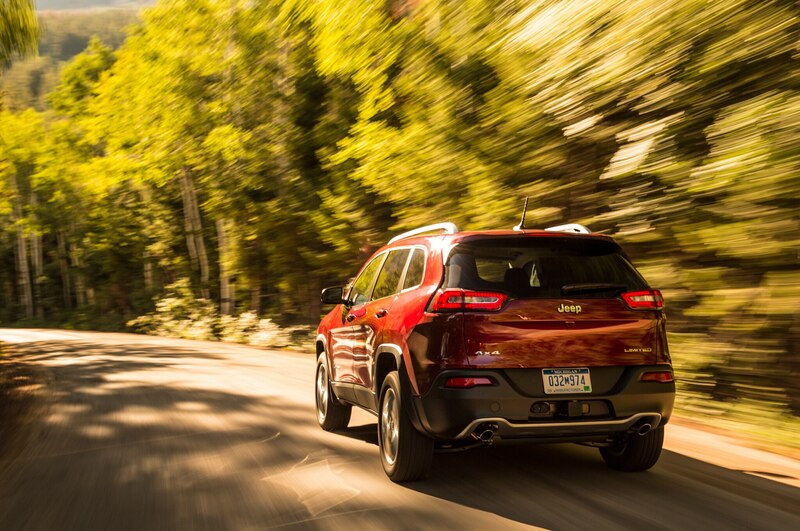 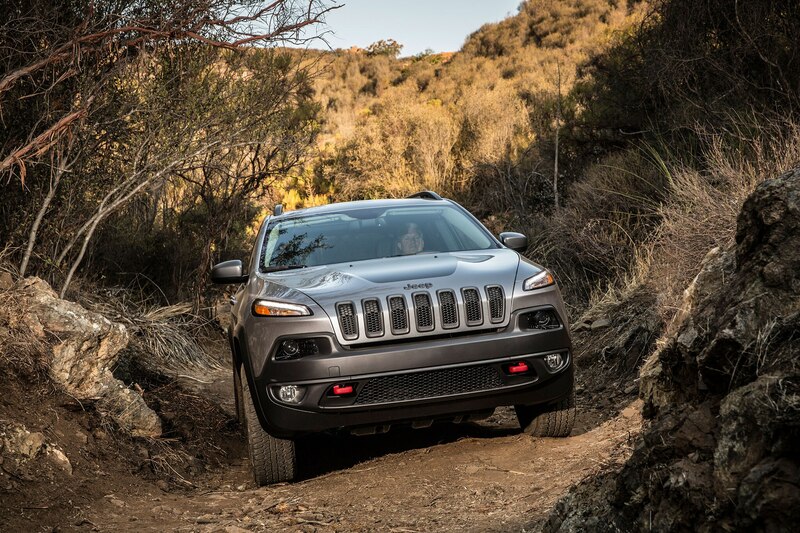 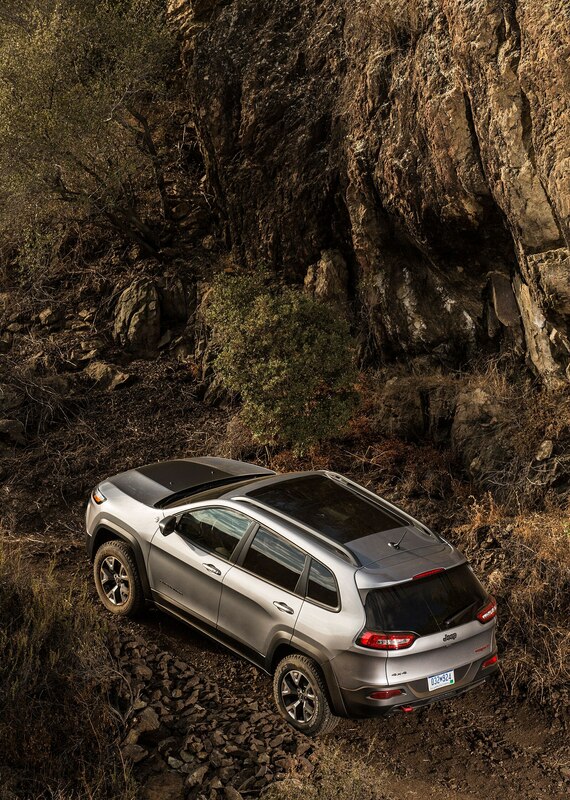 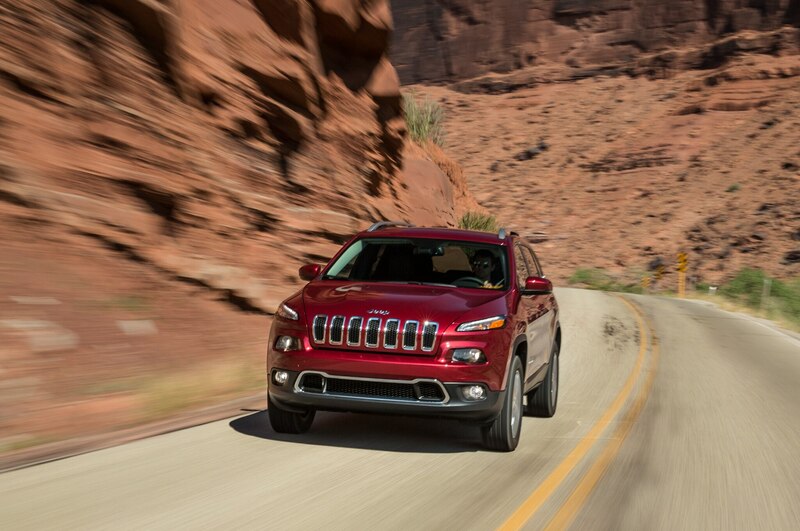 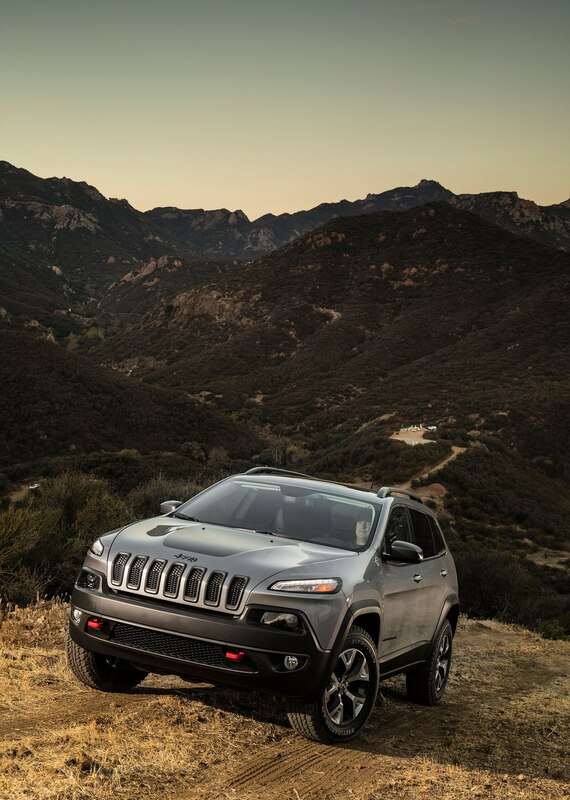 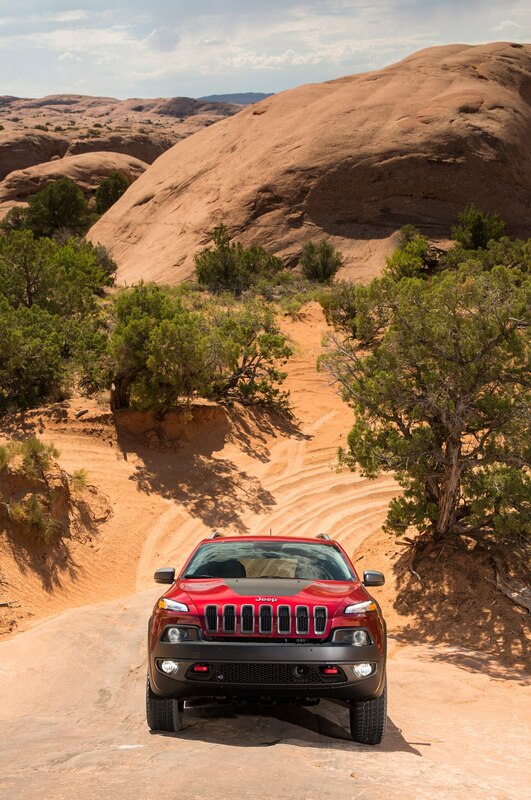 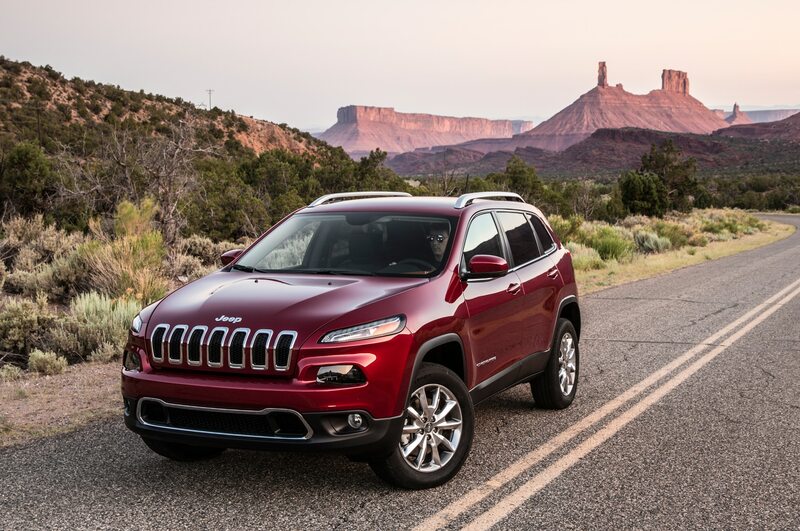 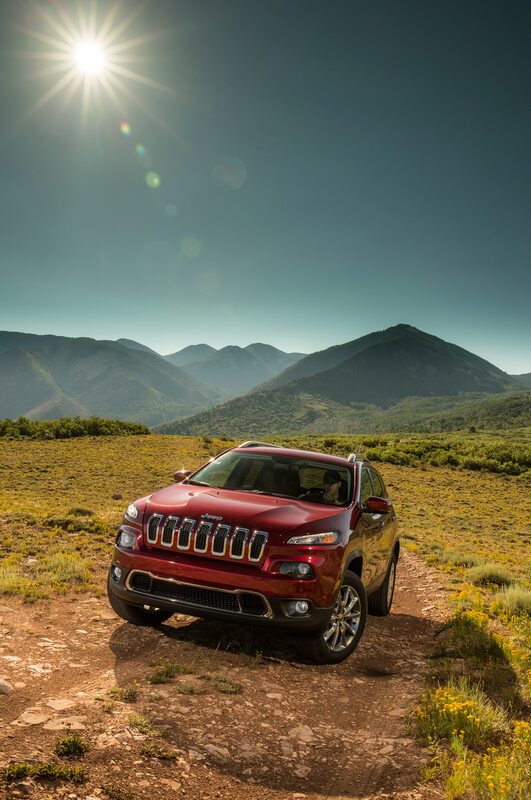 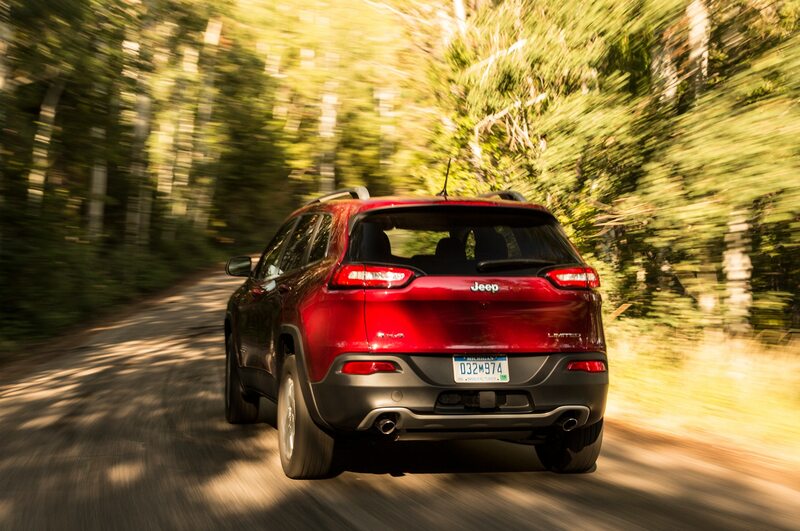 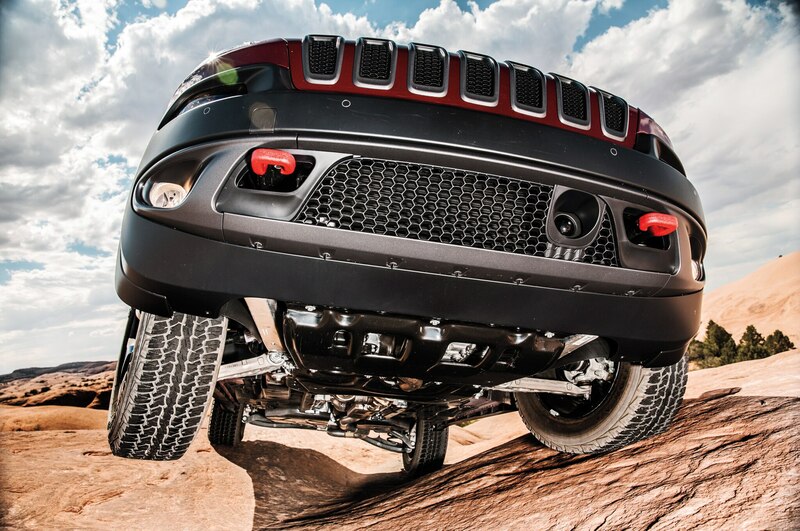 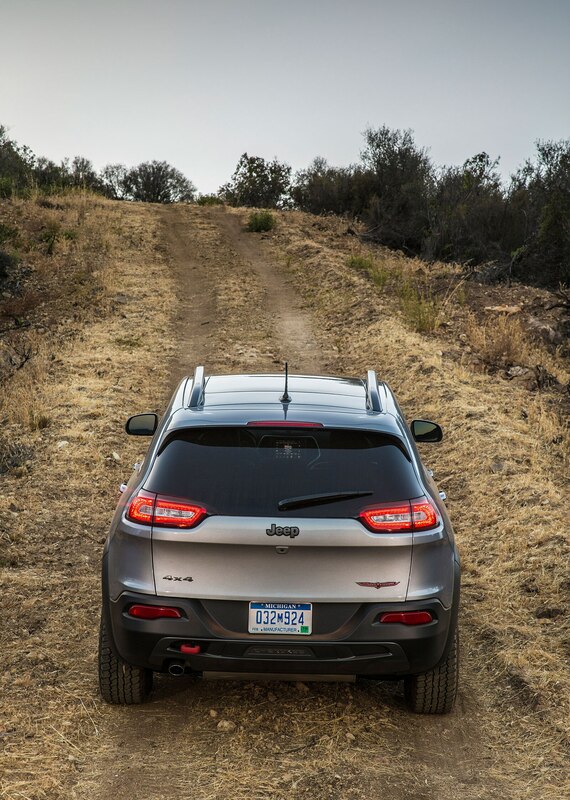 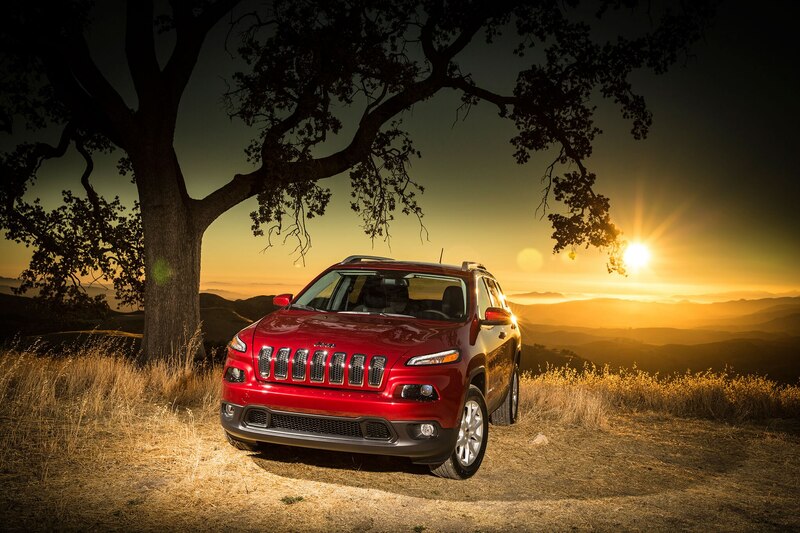 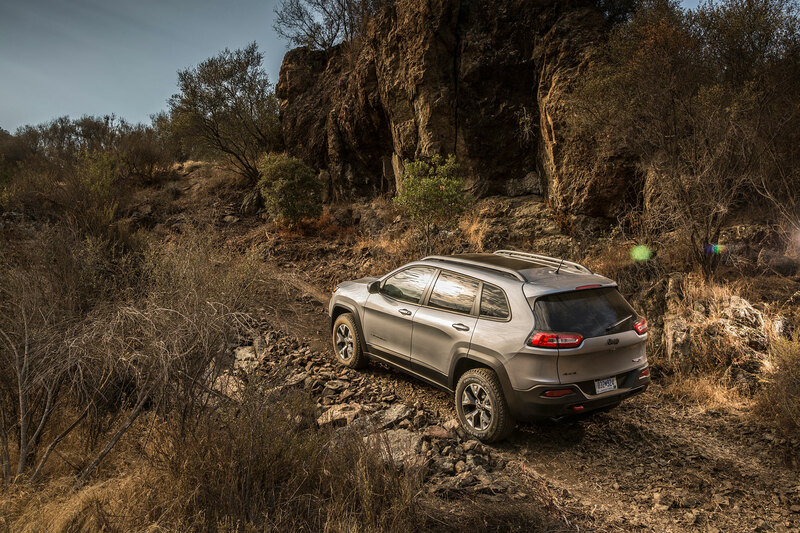 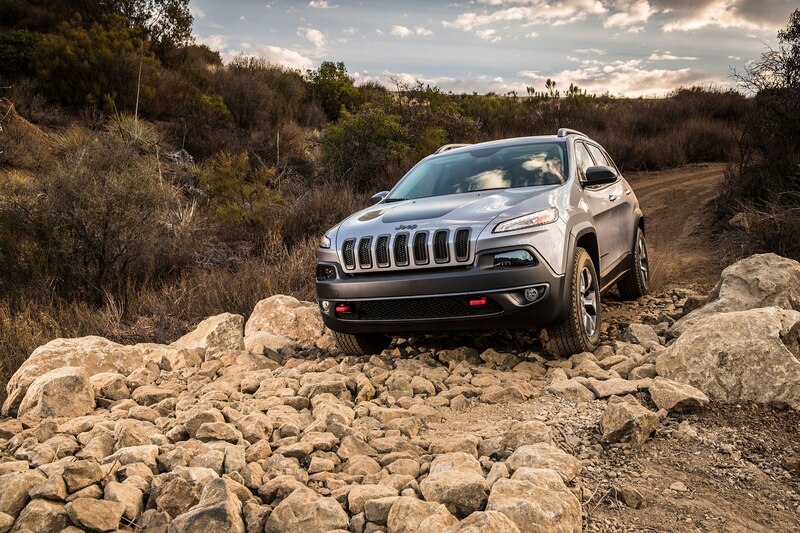 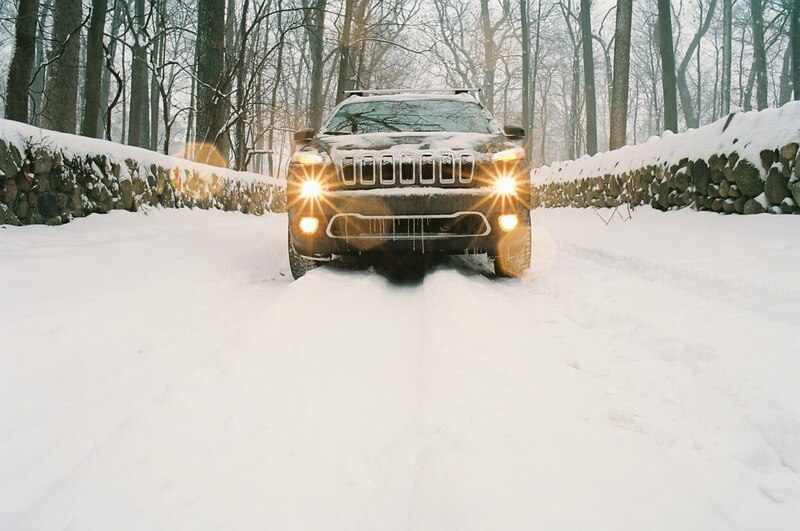 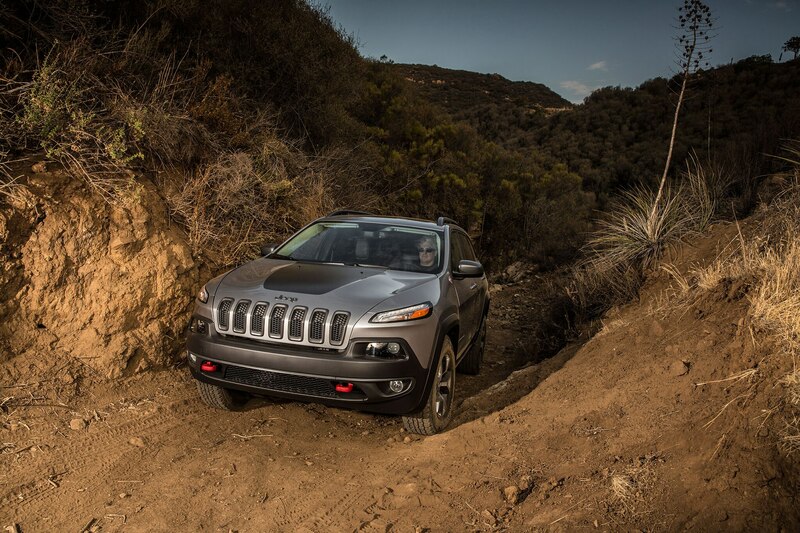 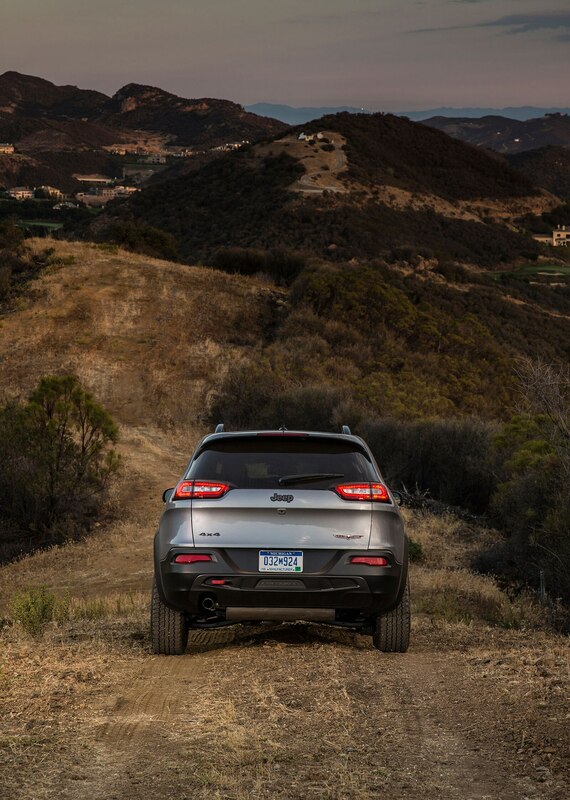 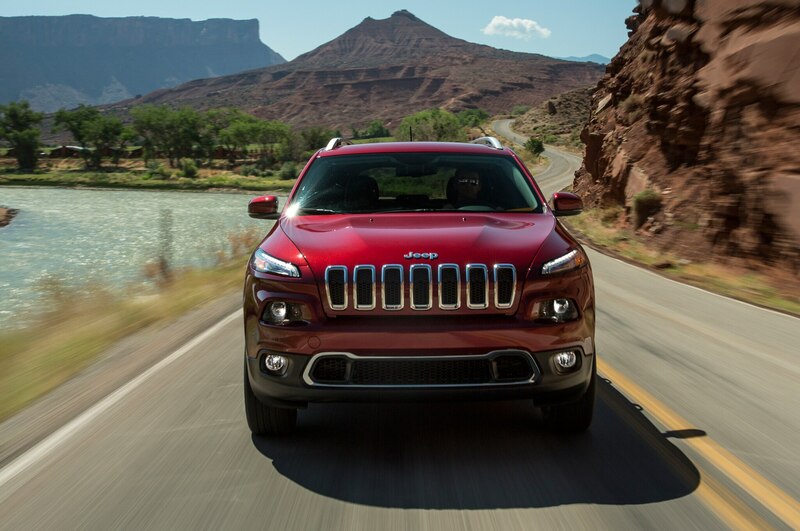 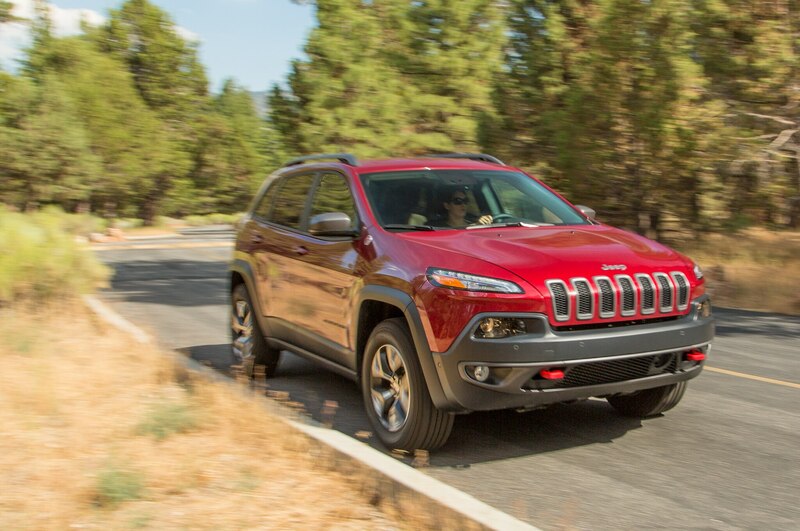 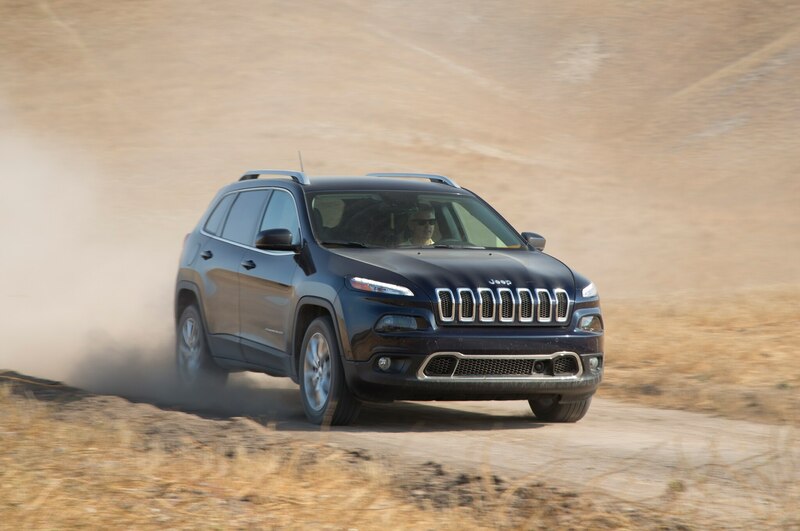 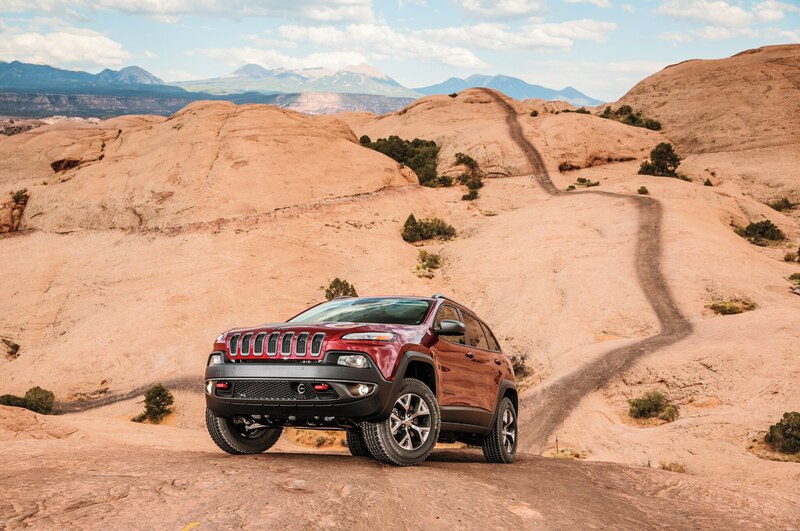 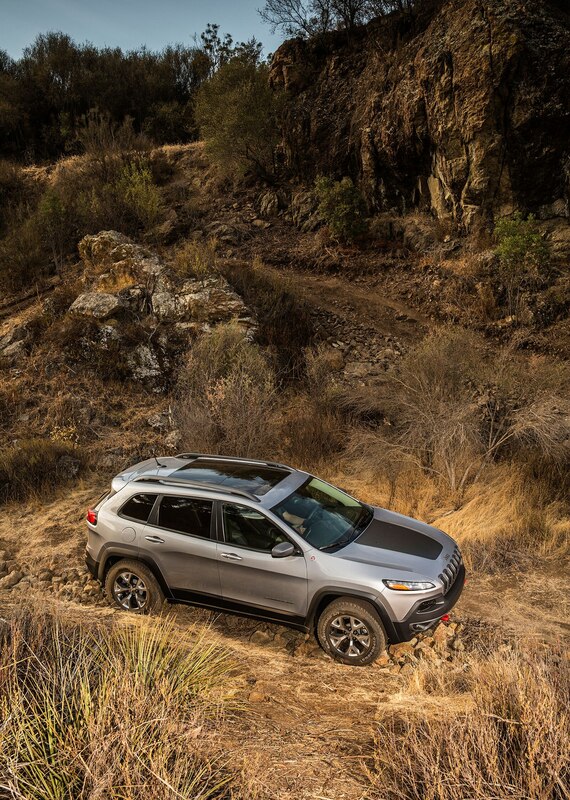 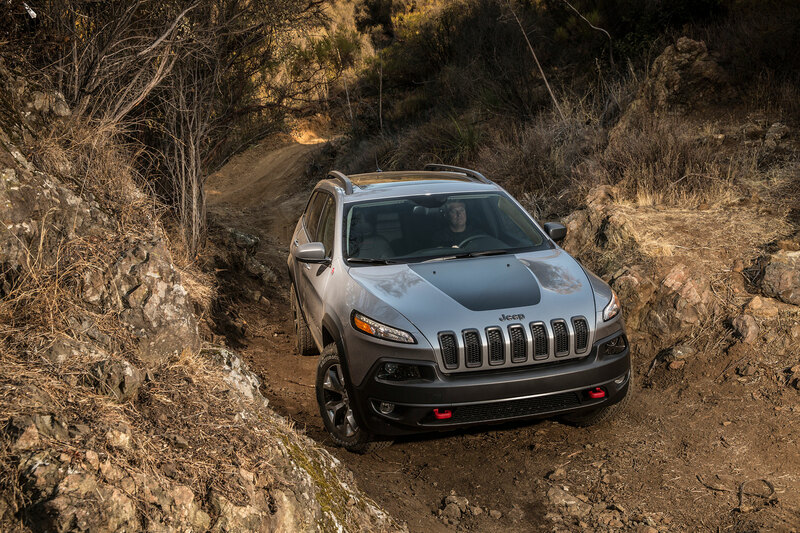 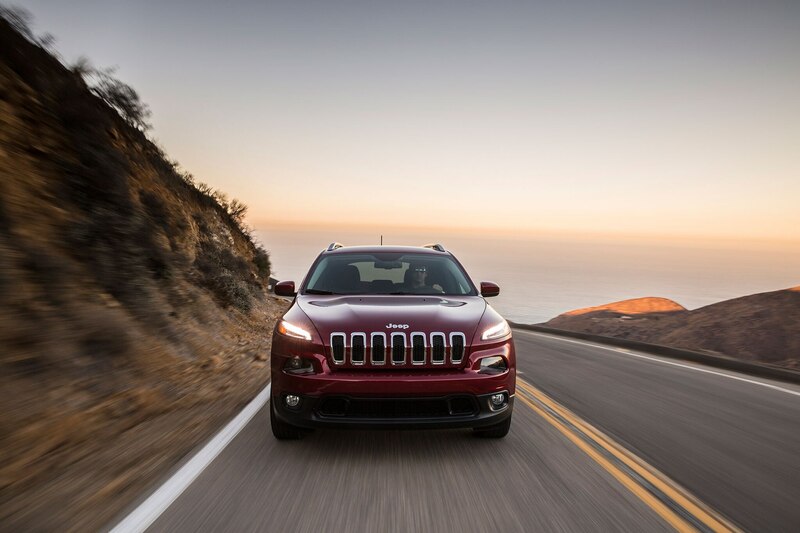 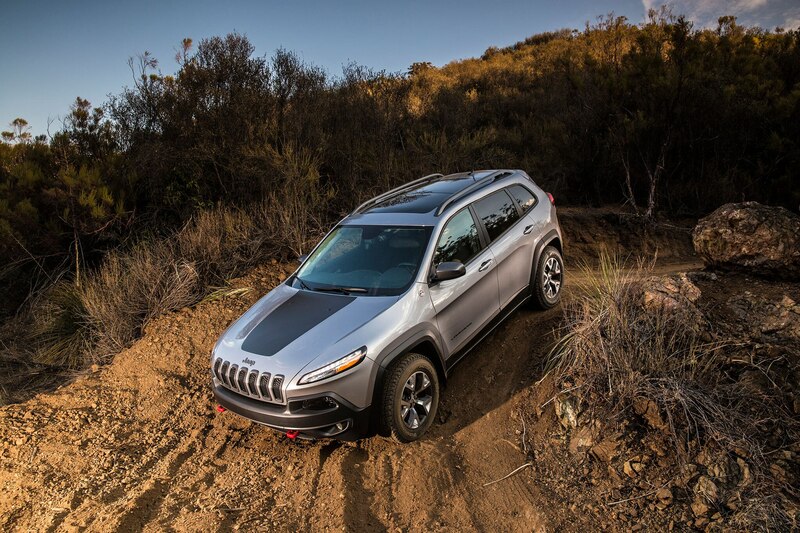 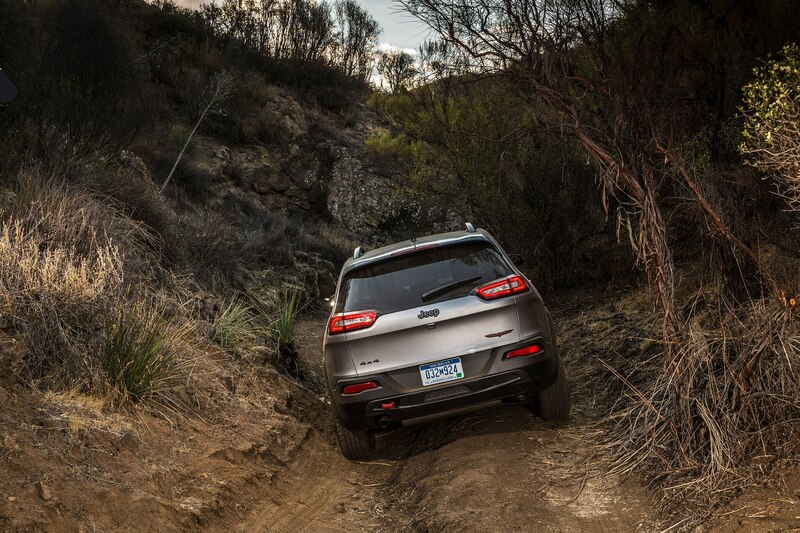 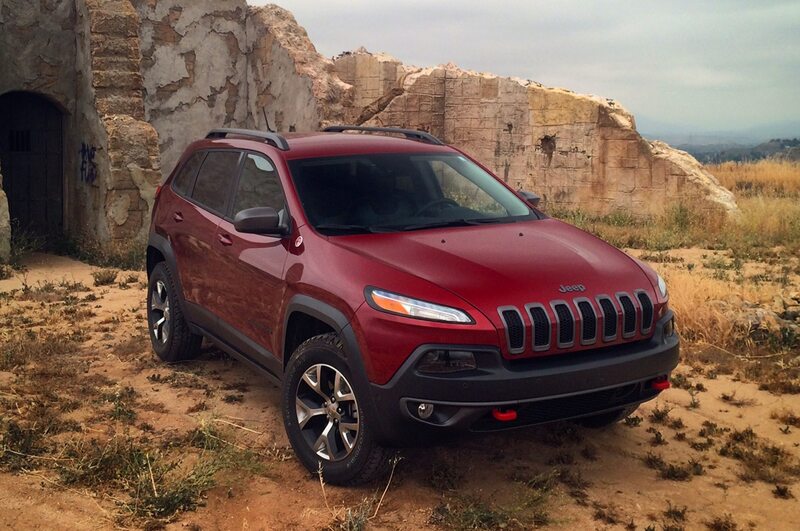 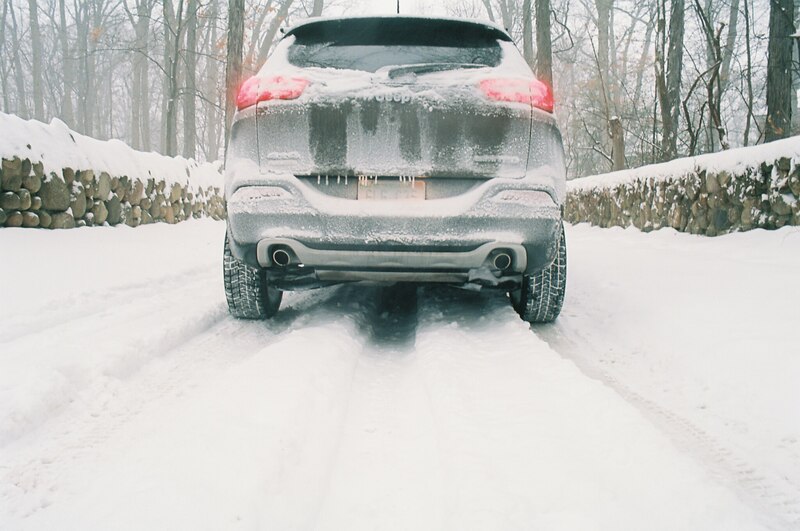 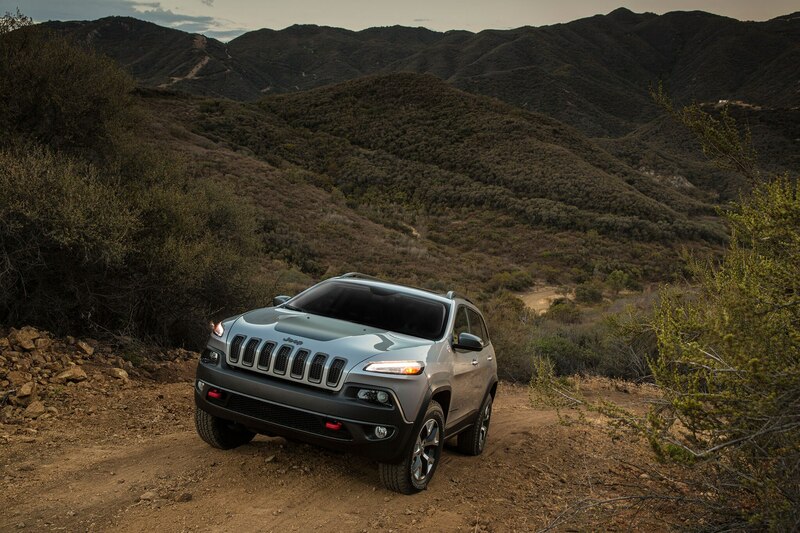 Off-roading in the 2015 Jeep Cherokee Trailhawk.